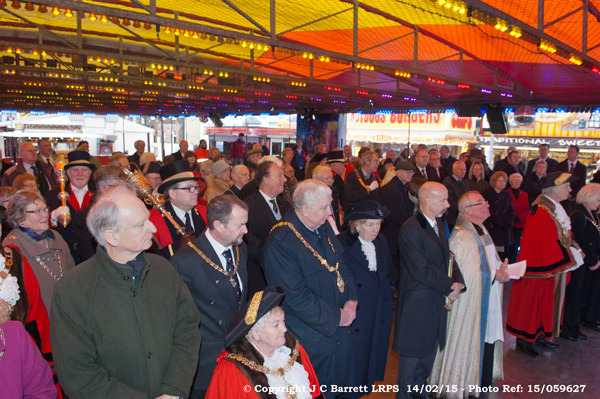 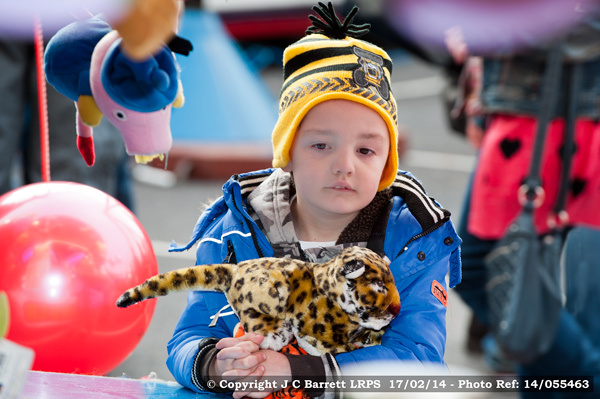 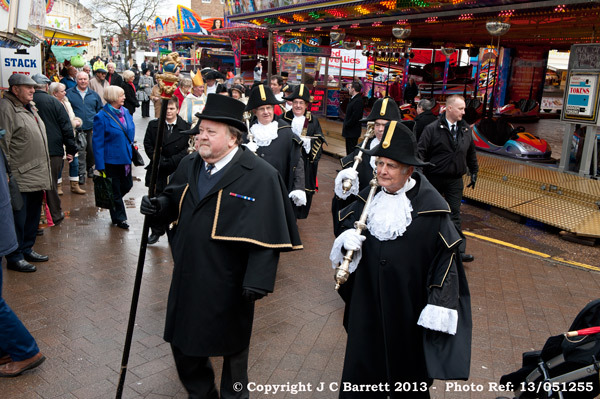 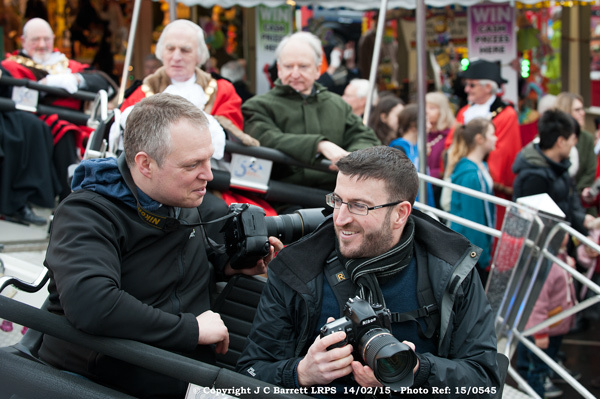 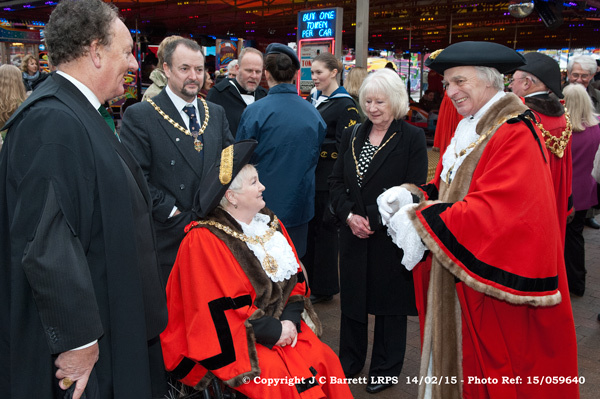 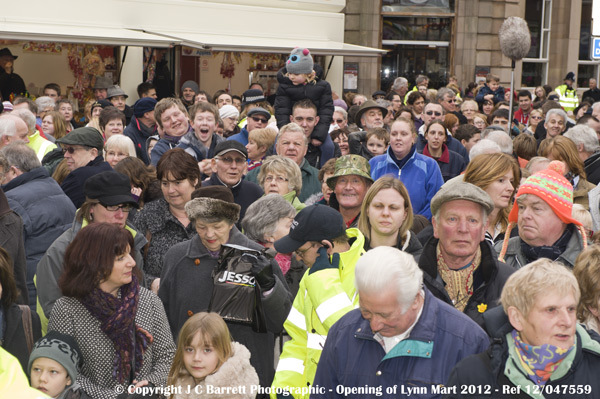 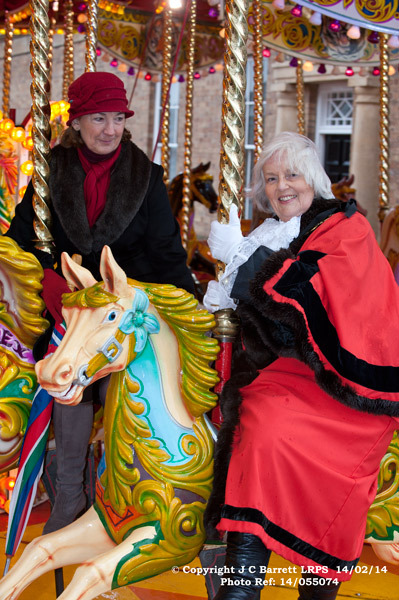 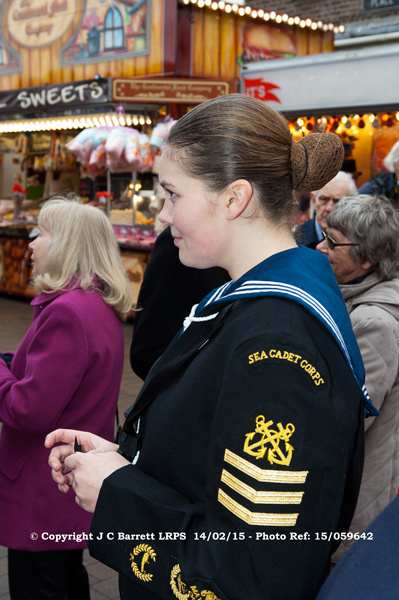 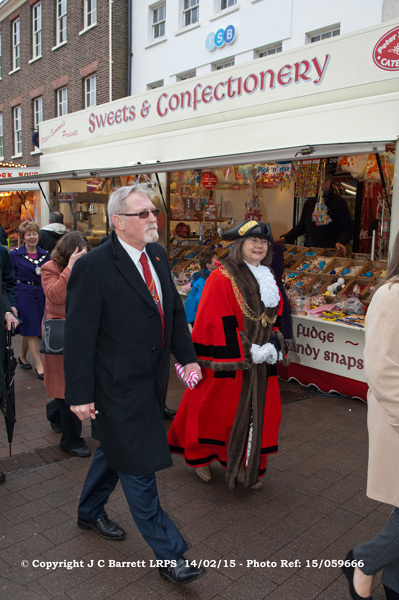 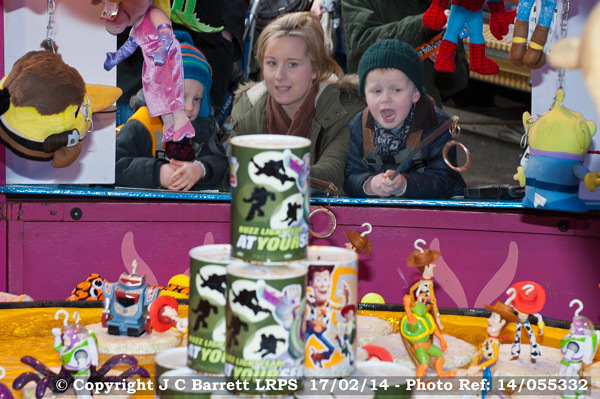 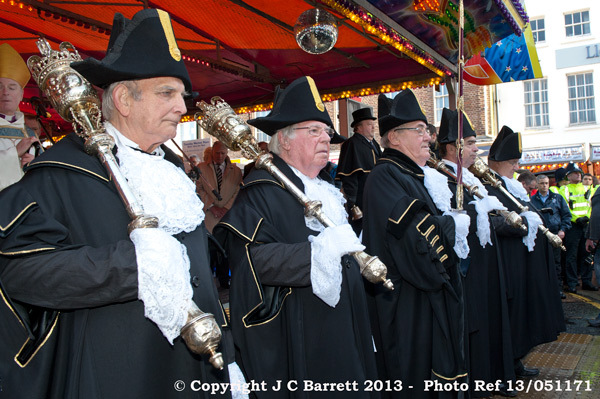 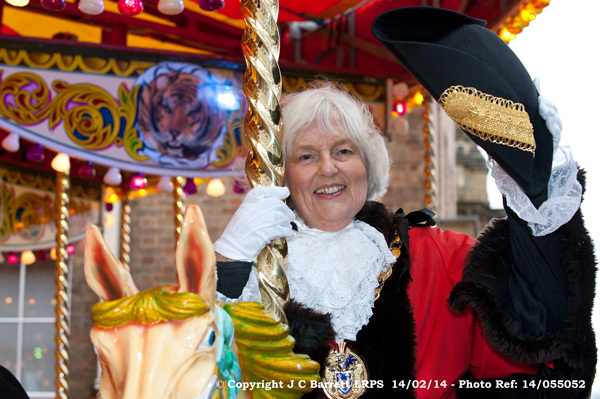 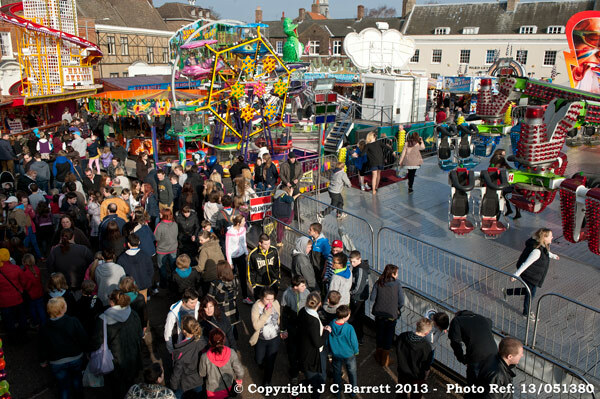 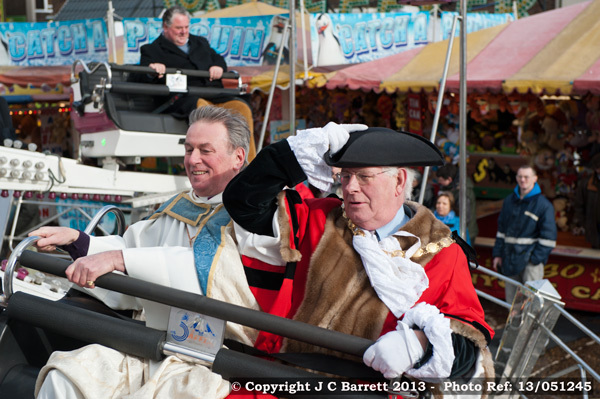 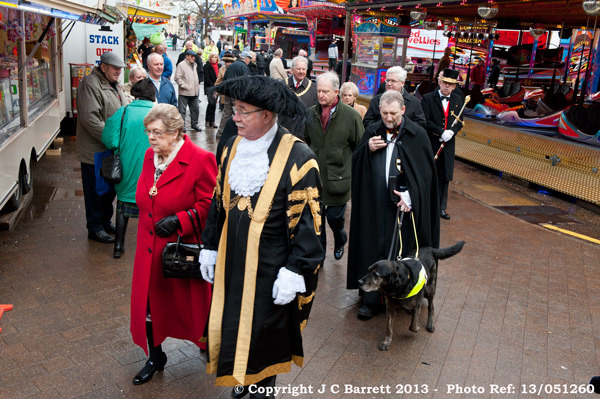 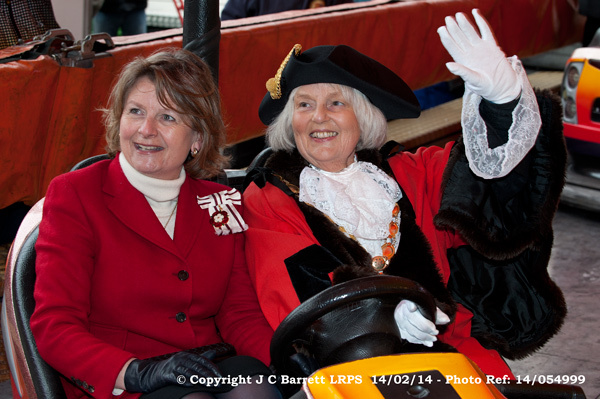 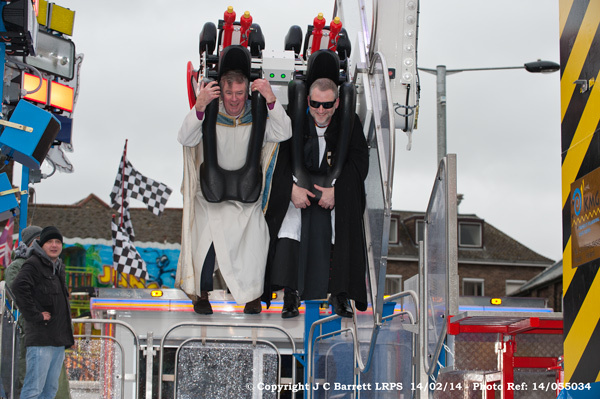 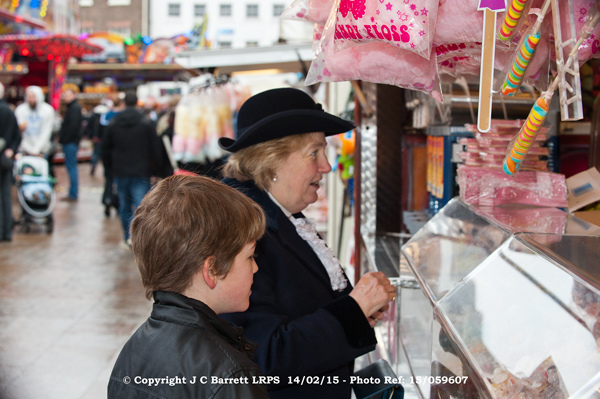 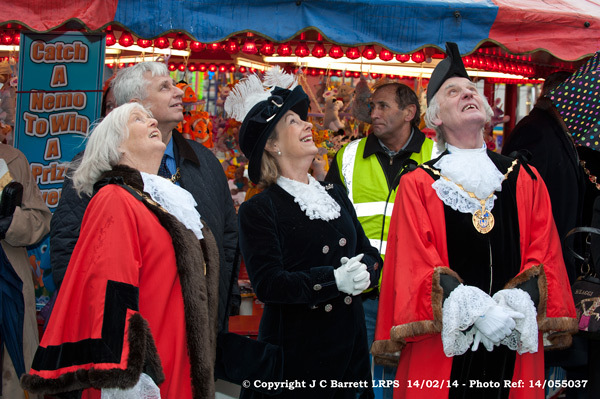 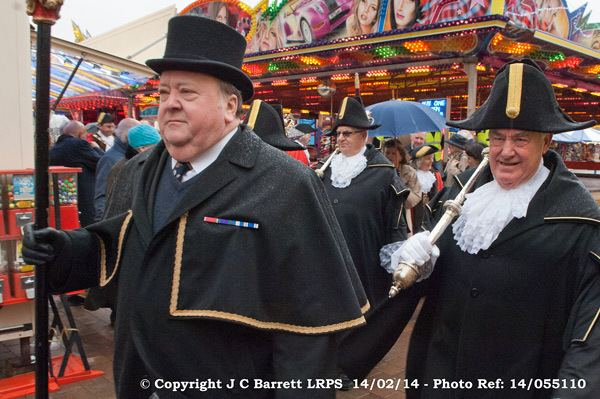 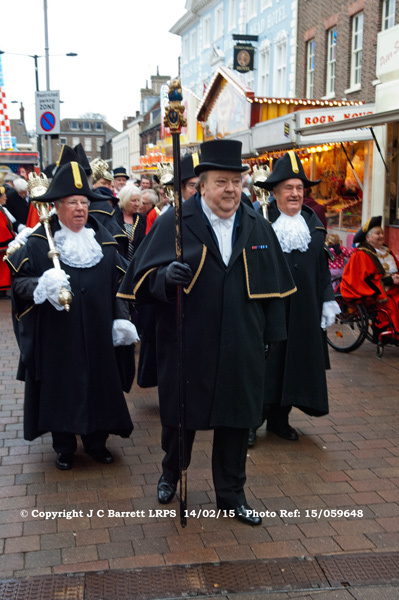 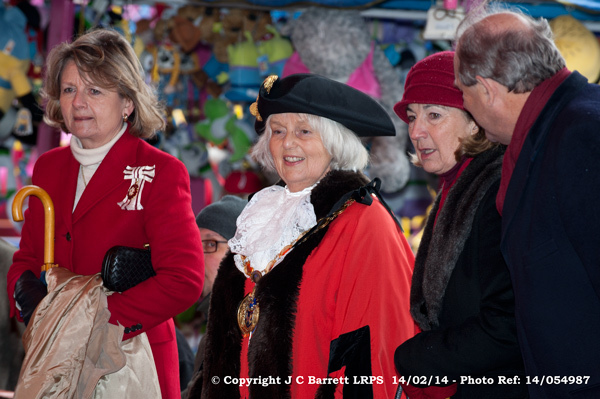 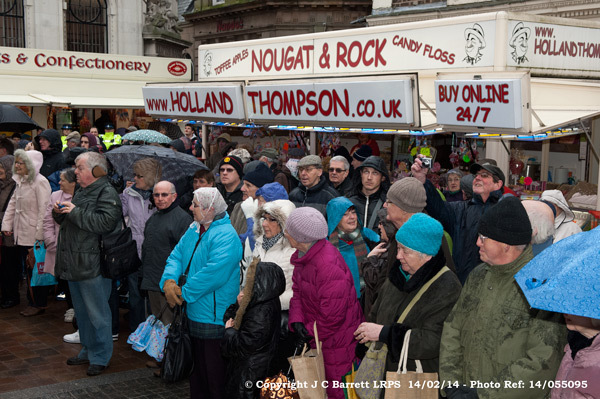 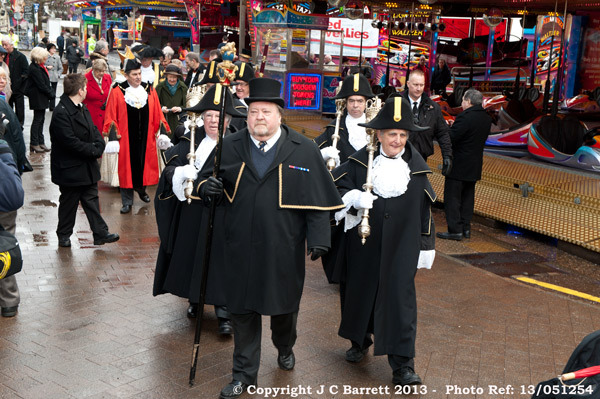 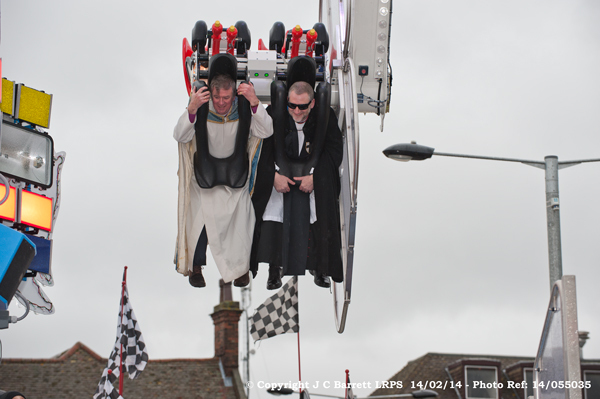 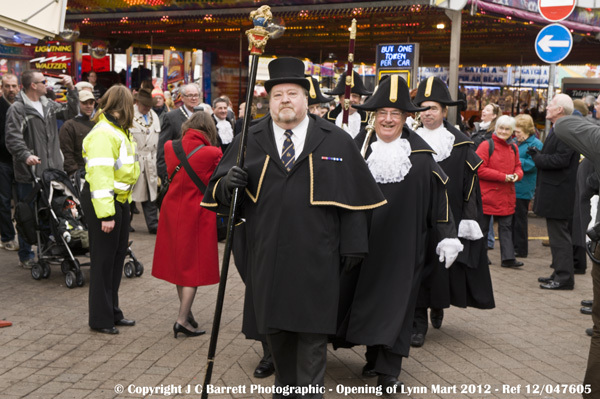 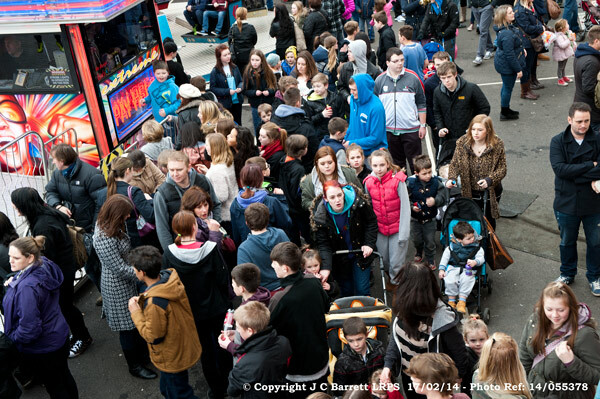 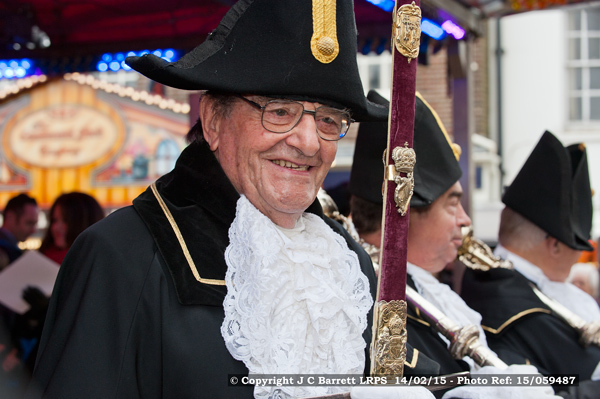 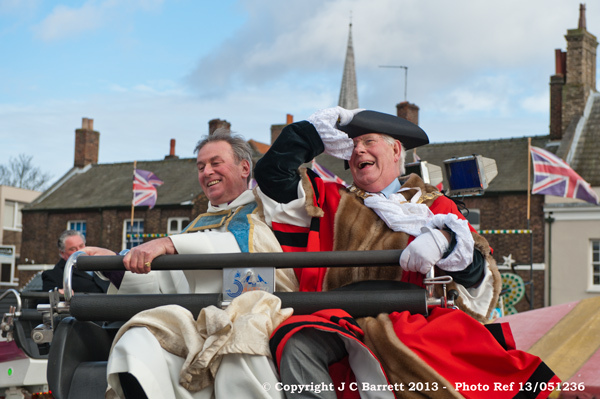 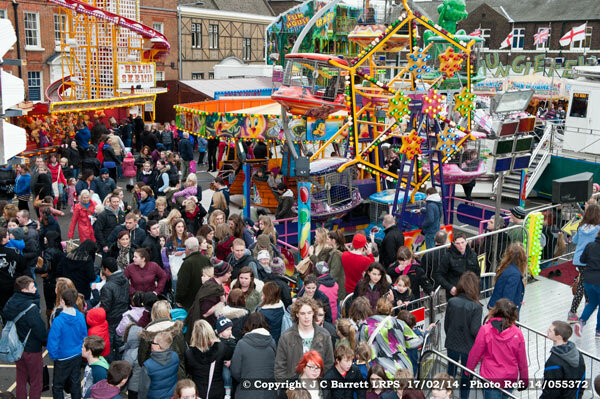 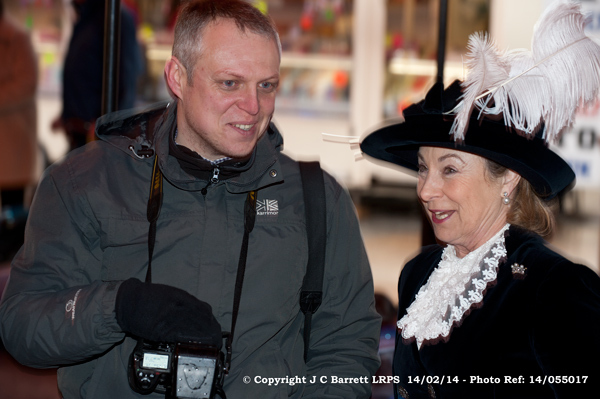 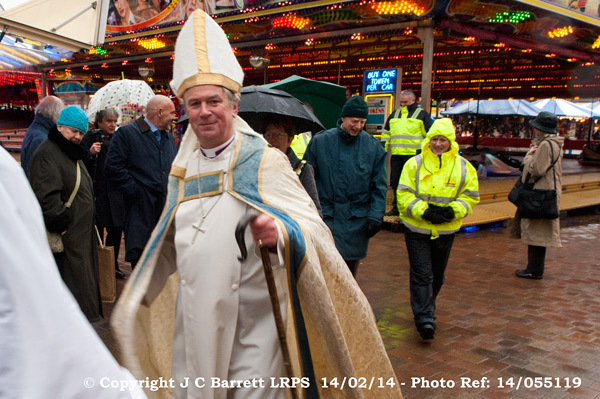 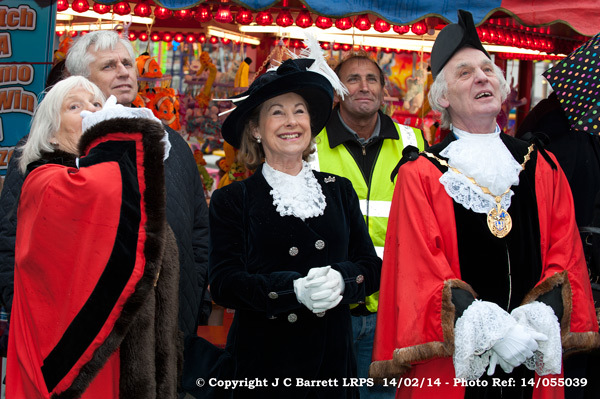 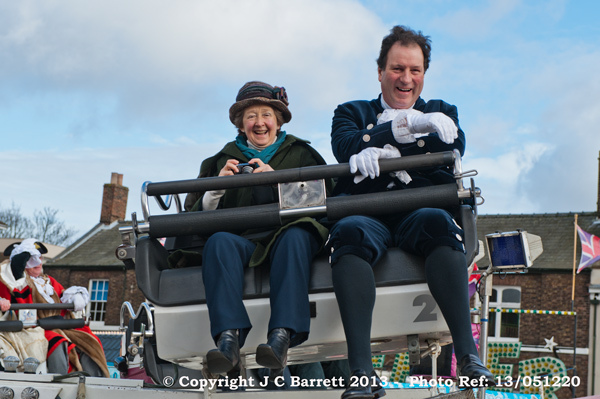 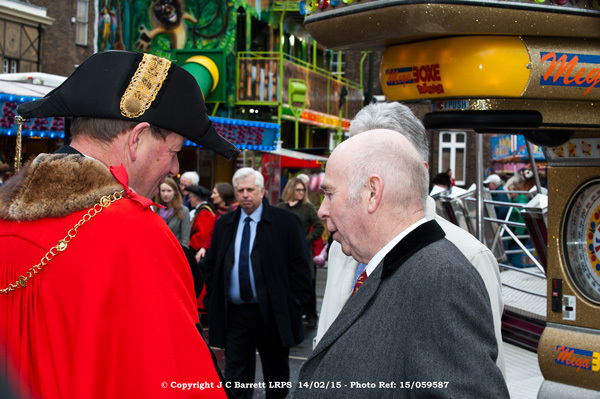 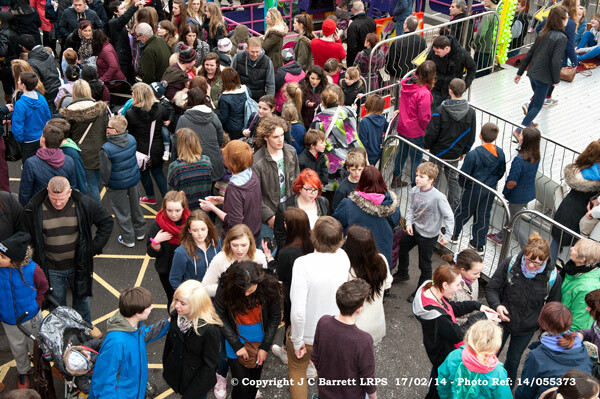 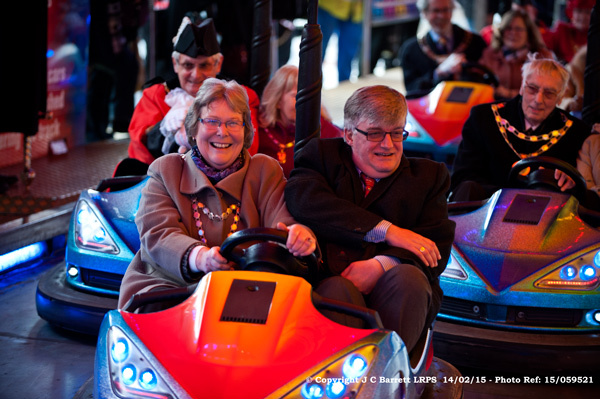 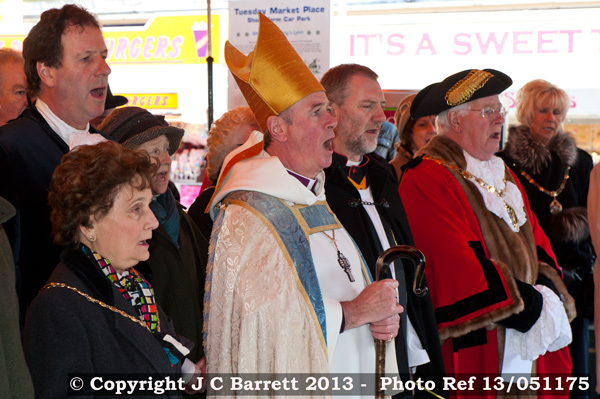 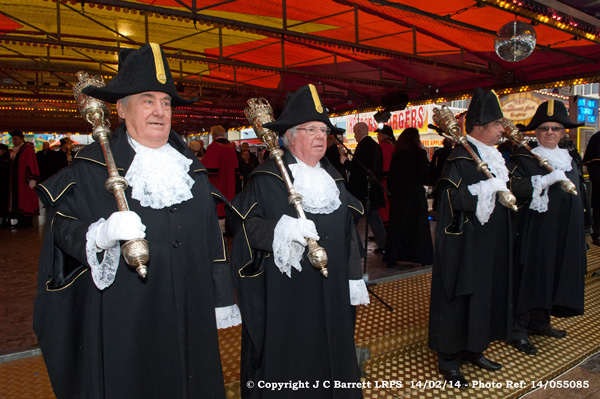 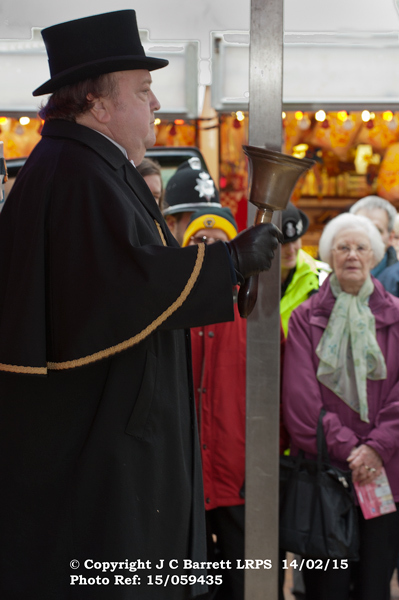 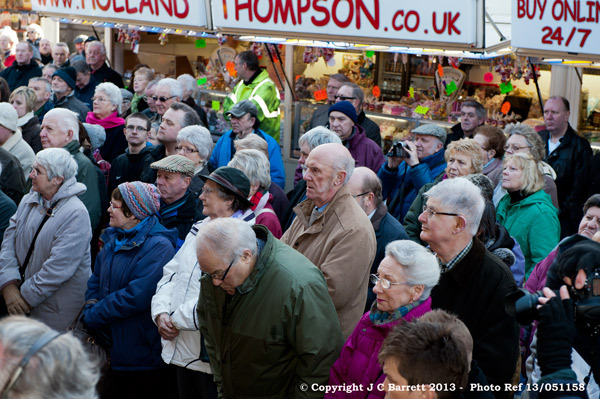 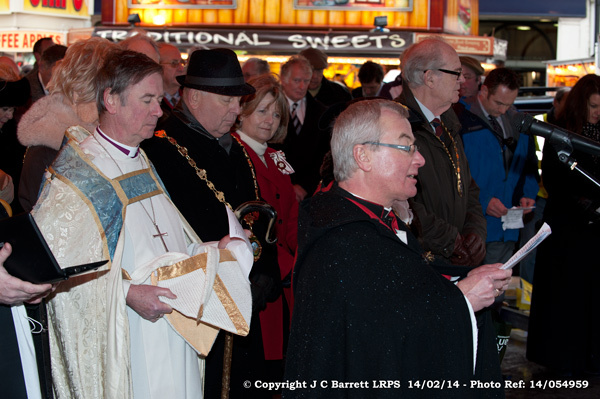 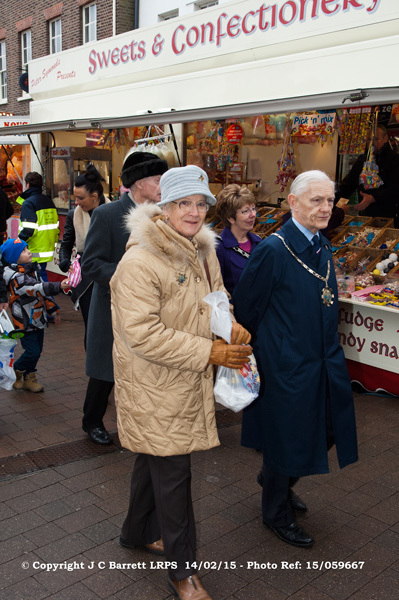 The 811th King's Lynn Mart 2015 - There was an opening ceremony at 12 noon on Saturday 14th February. 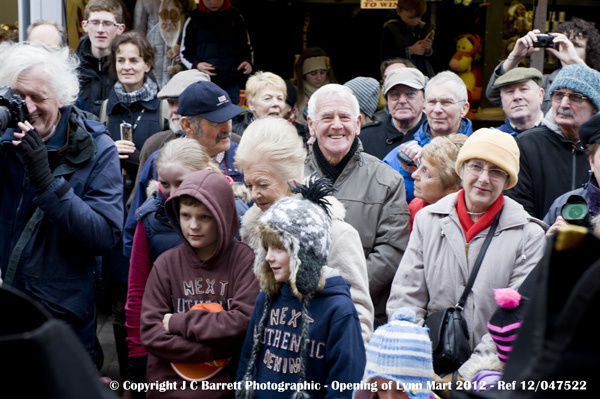 The traditional Family Day took place on Monday 16th February The Mart will open at 12 noon all of half-term week, 16th to 20th. 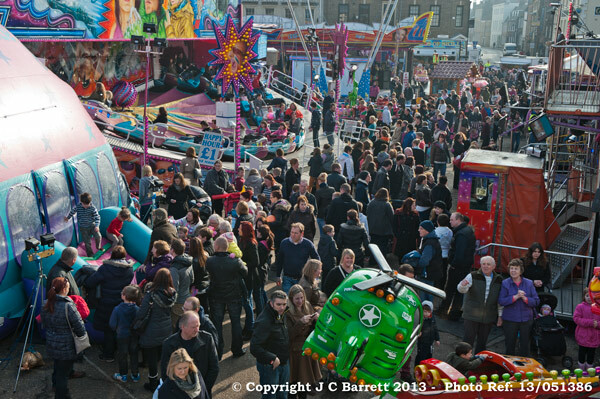 Opening at 6pm the following week, 23rd to 27th. 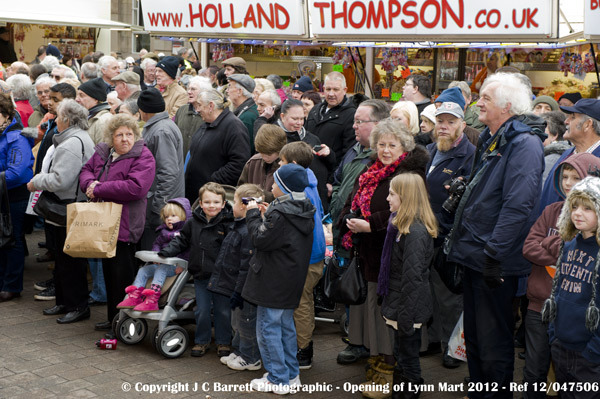 Saturdays it will be open from 12 noon. 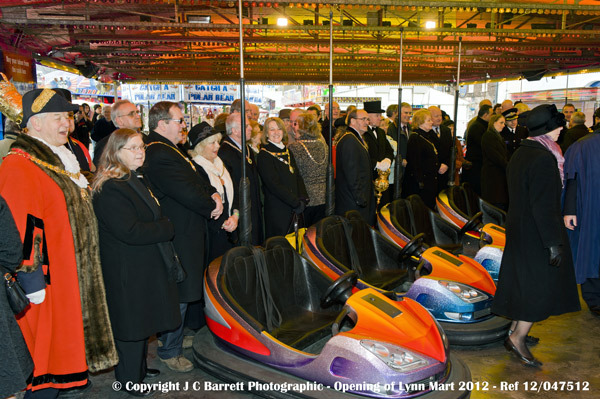 Sundays the Mart remains closed. 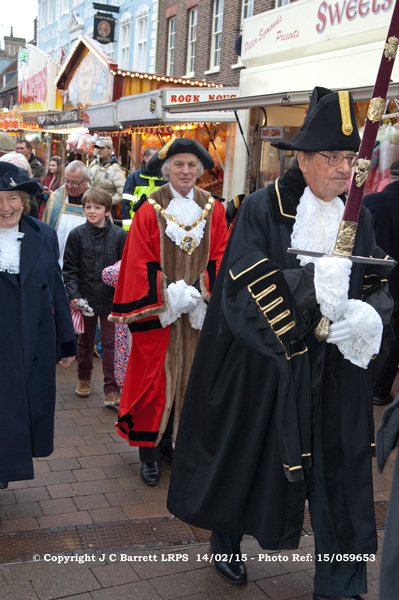 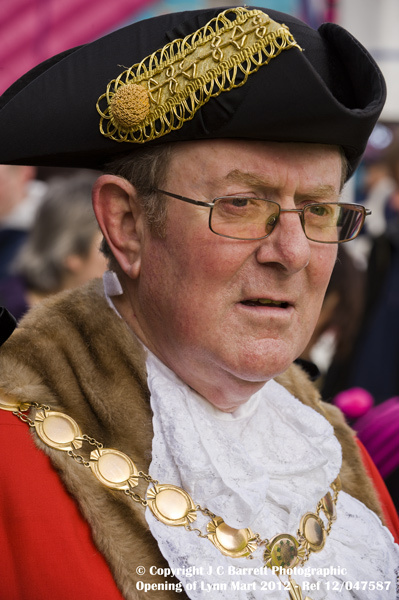 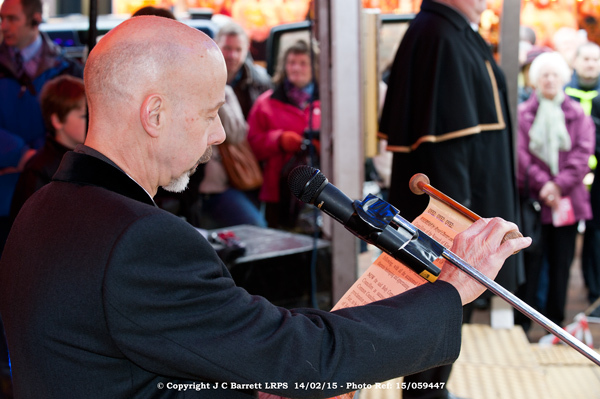 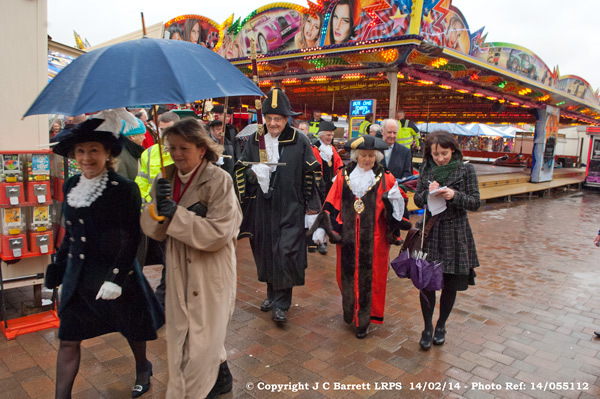 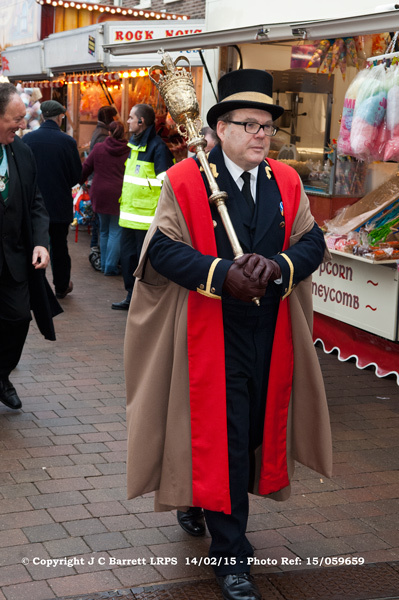 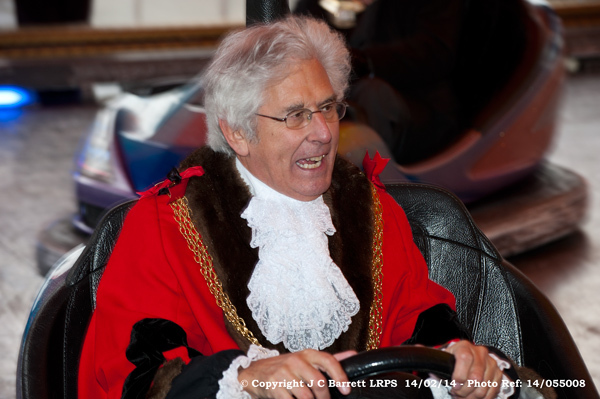 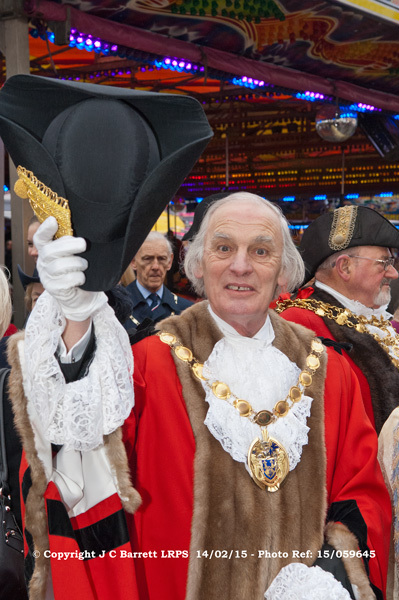 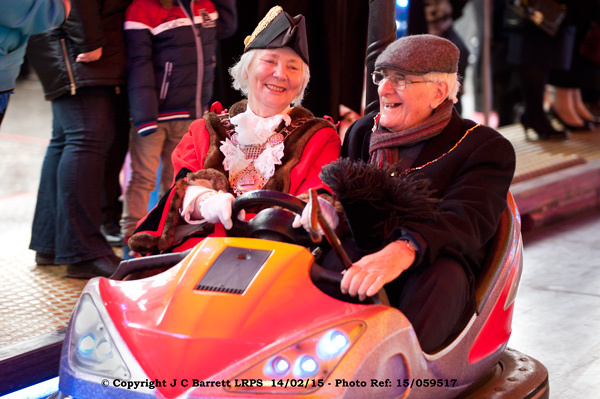 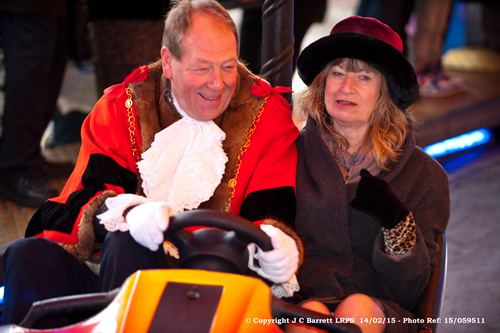 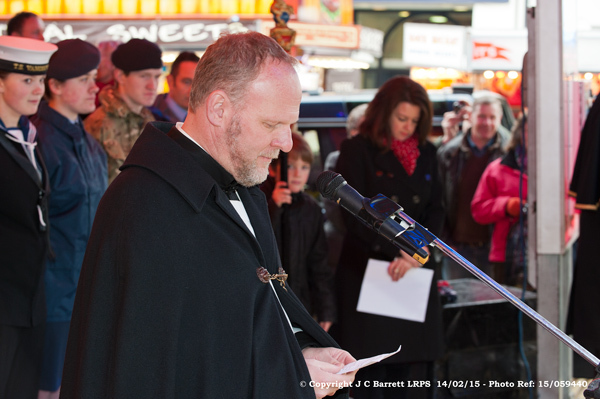 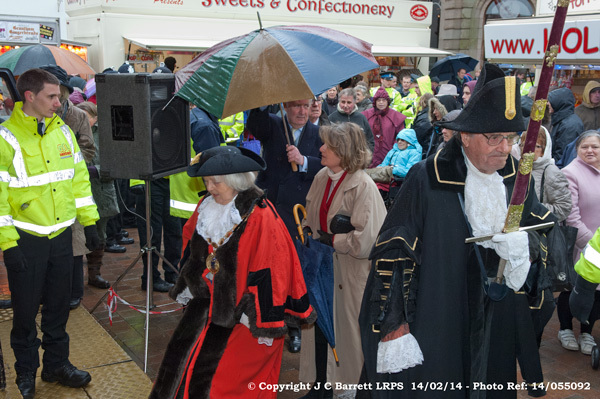 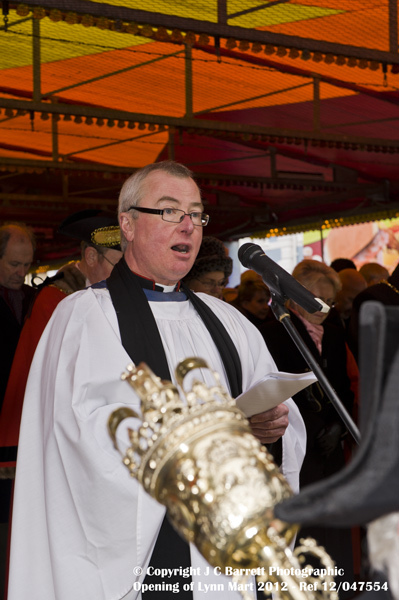 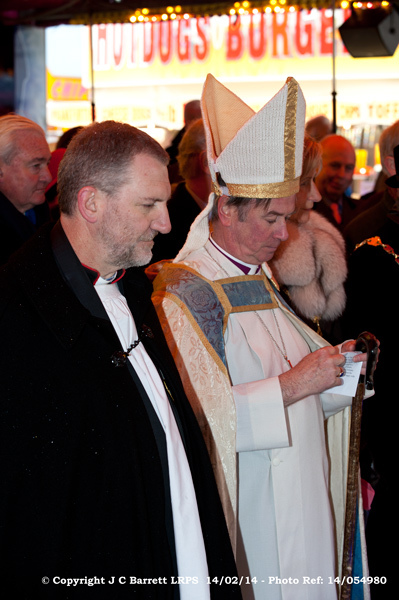 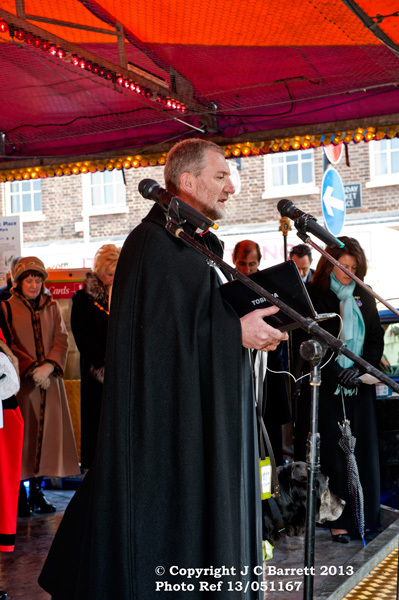 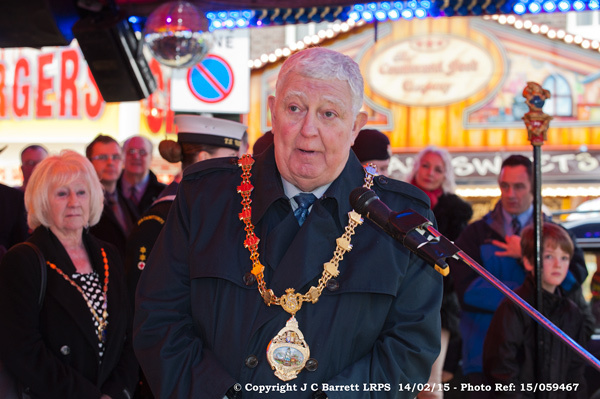 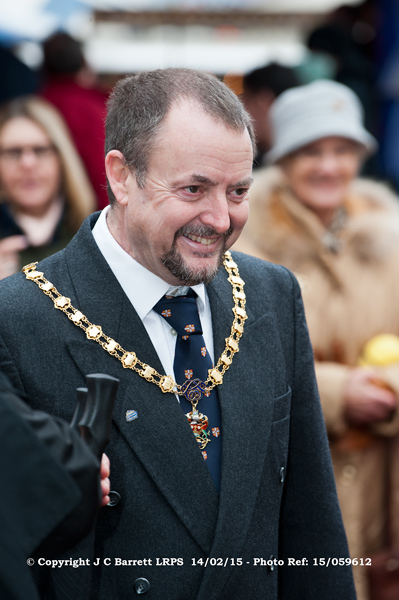 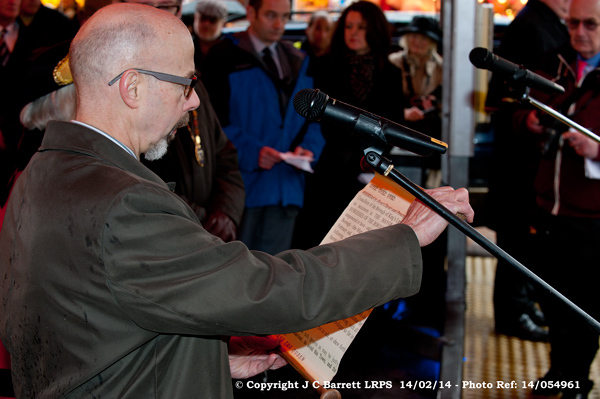 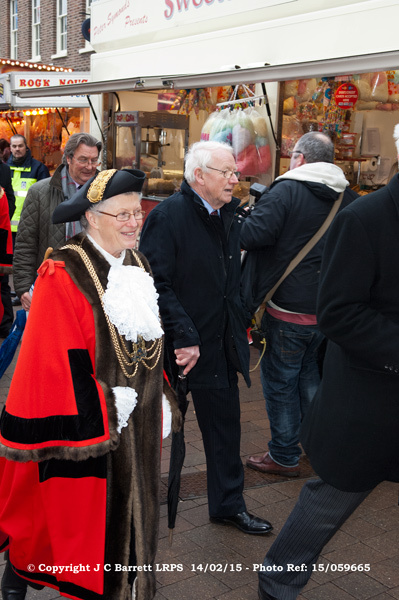 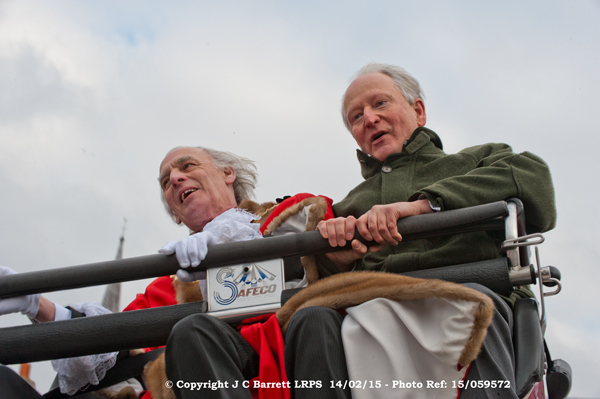 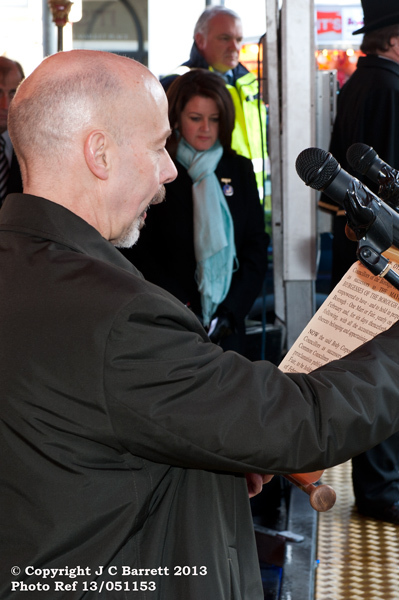 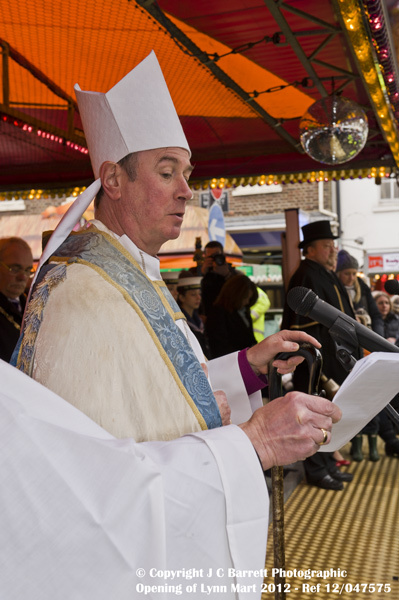 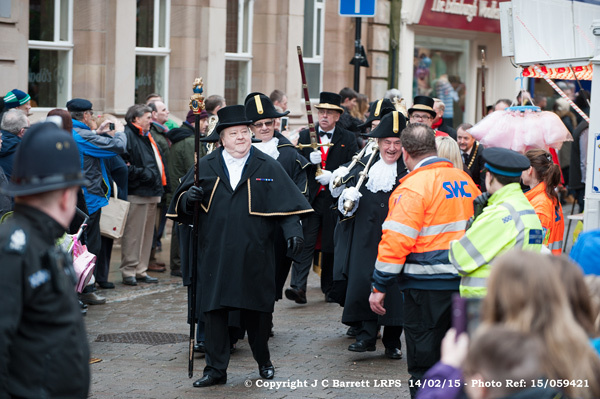 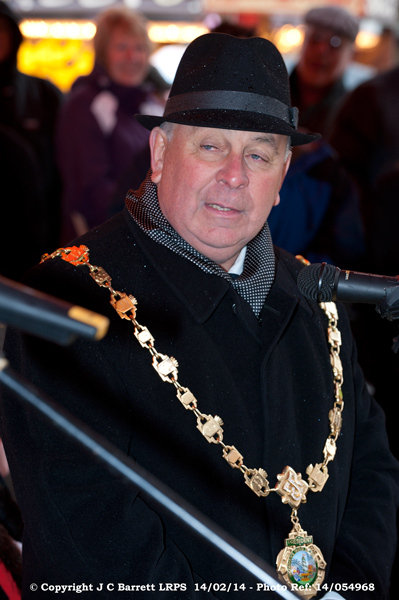 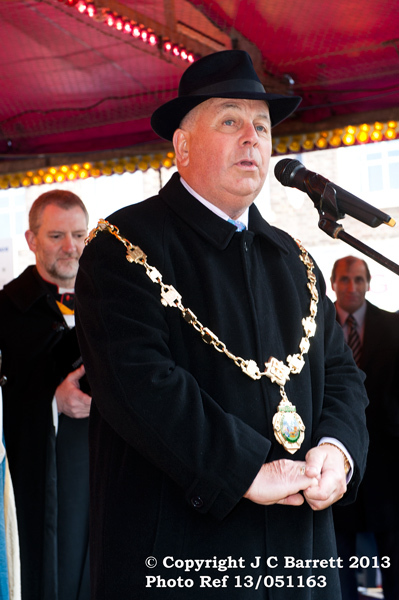 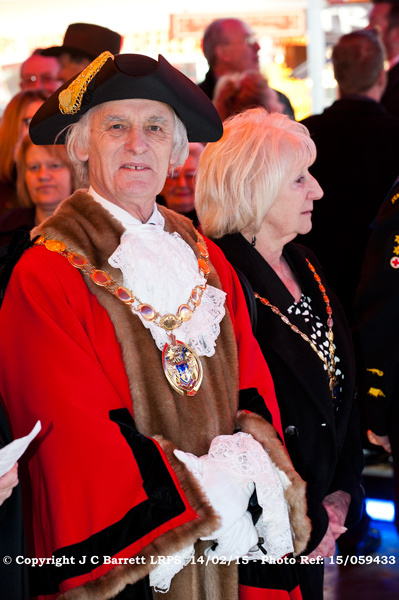 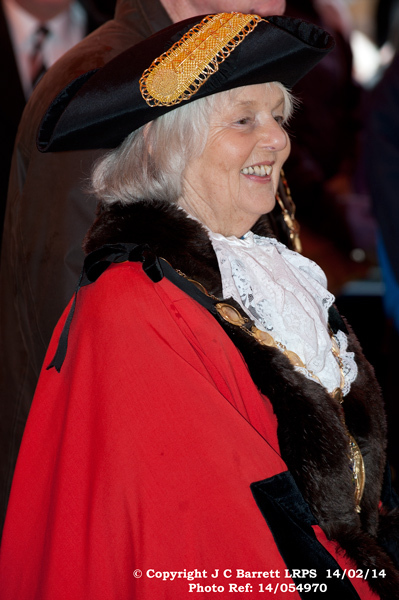 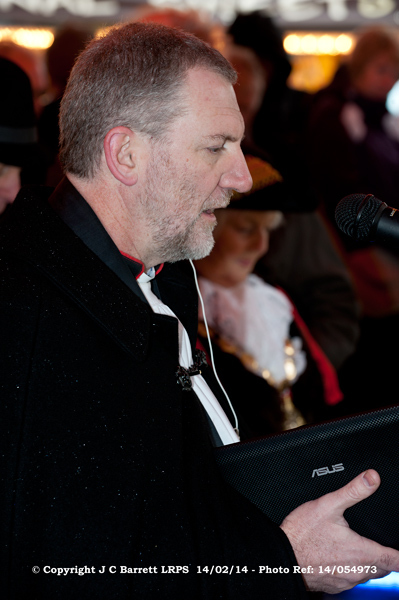 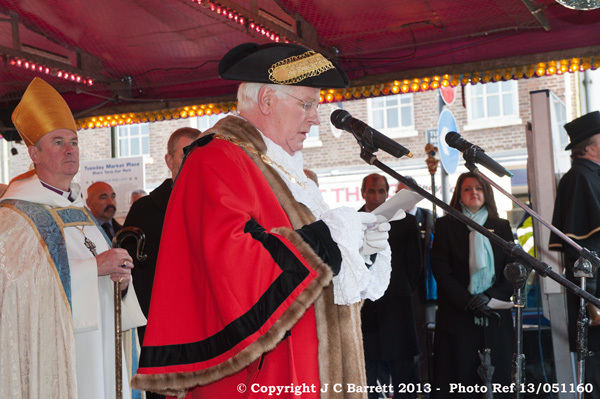 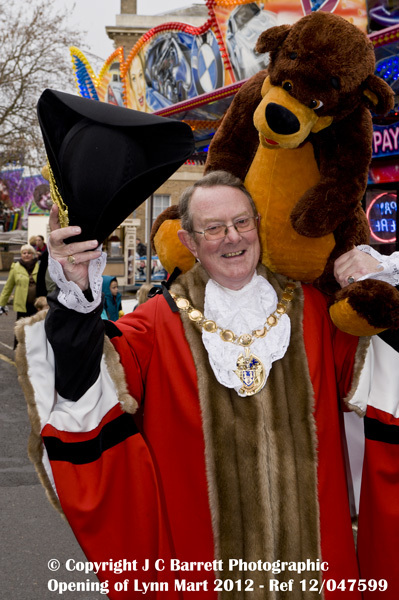 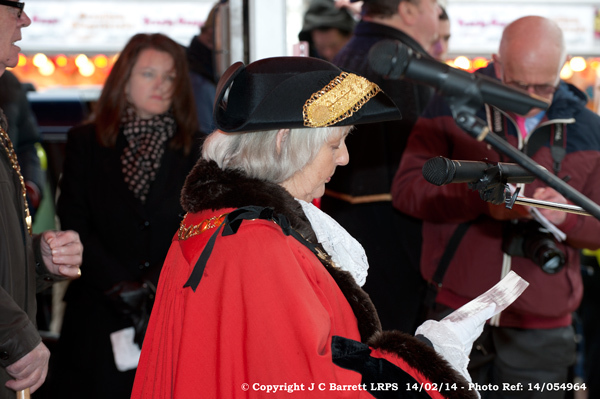 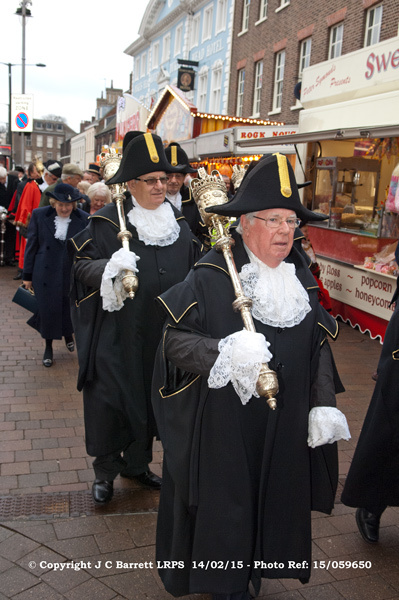 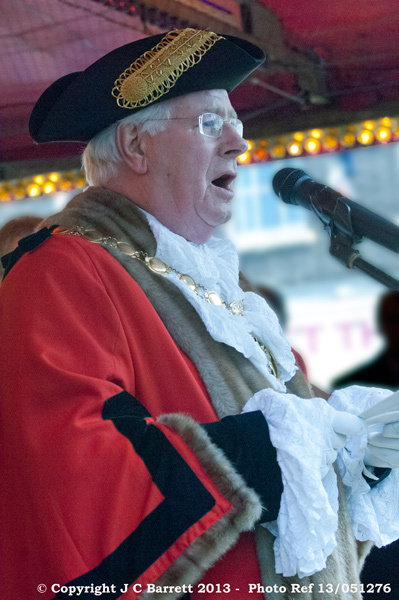 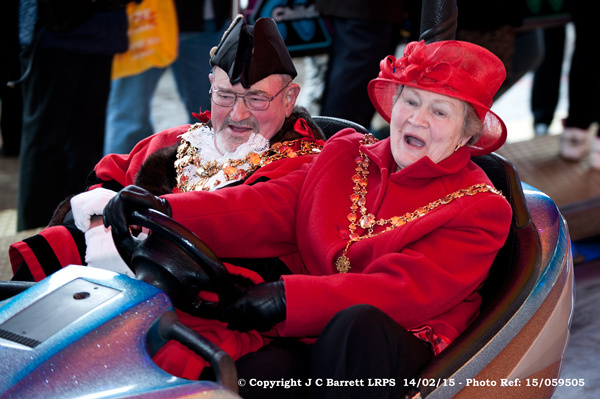 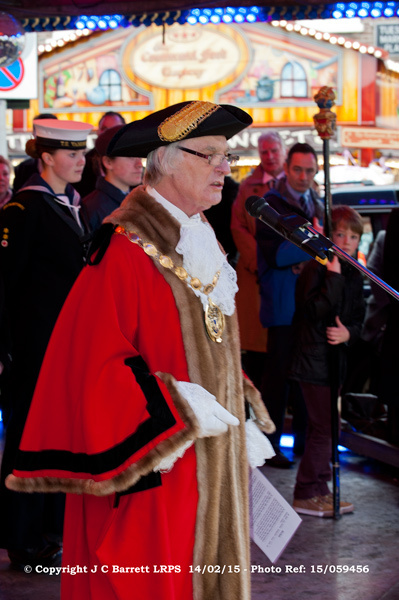 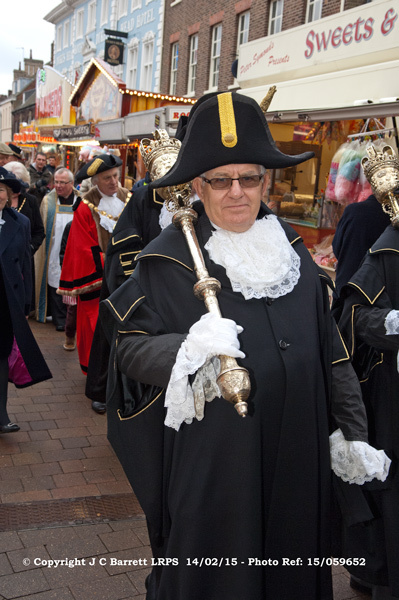 2015 - The official opening by the Borough Mayor Councillor Barry Ayres, with the traditional proclamation before the mayors of neighbouring boroughs and other dignitaries took place on Saturday 14th February 2015 (St Valentine's Day) at 12 noon. 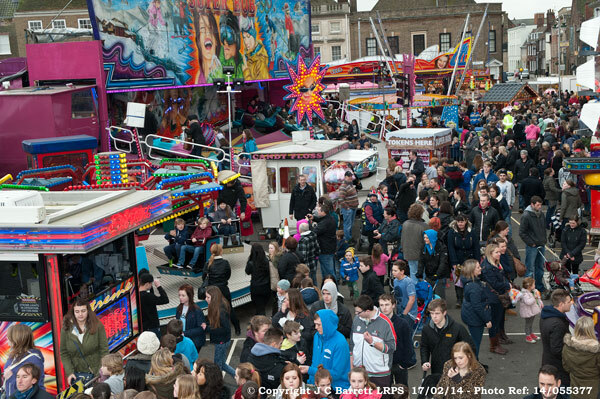 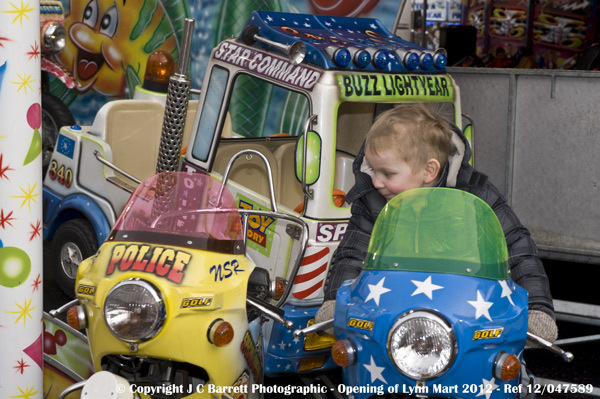 The Mart always starts in King's Lynn, this marks the first event in the showmen's year, which sees families travel all over the country, many from King's Lynn. 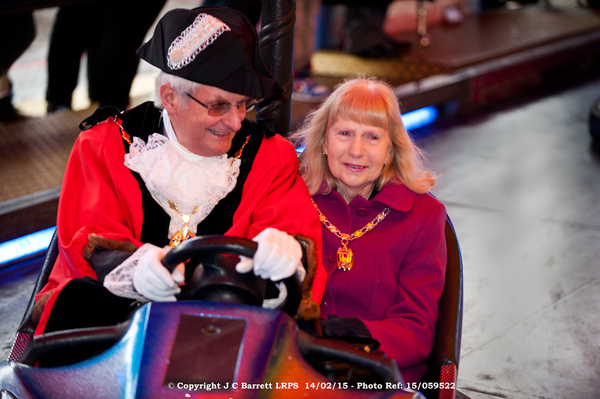 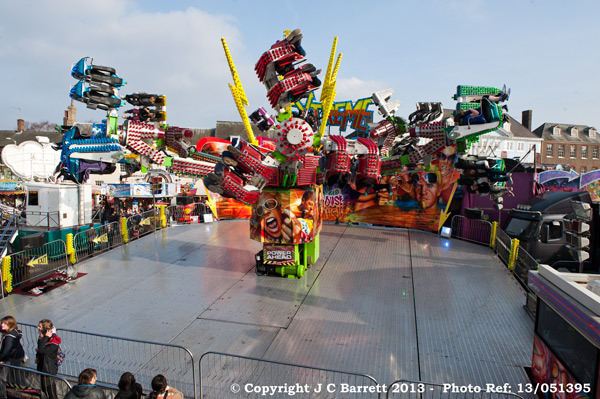 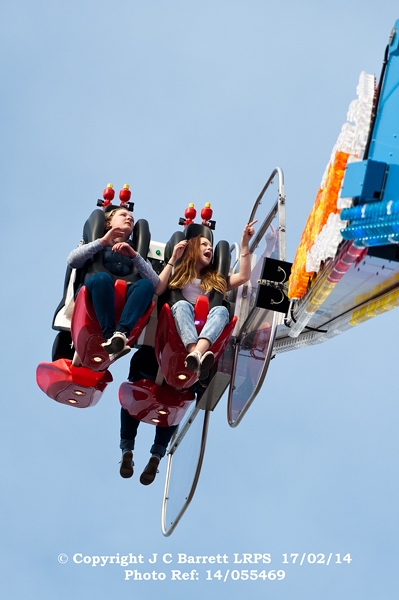 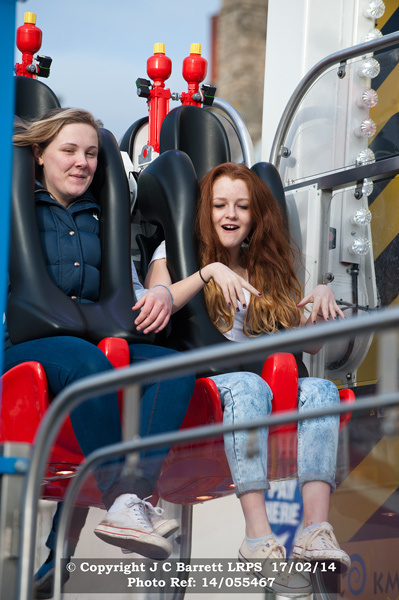 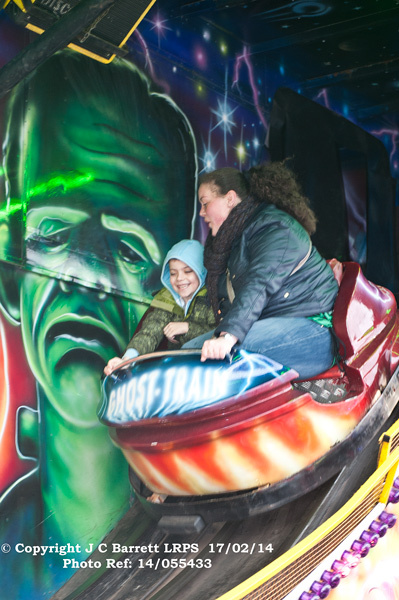 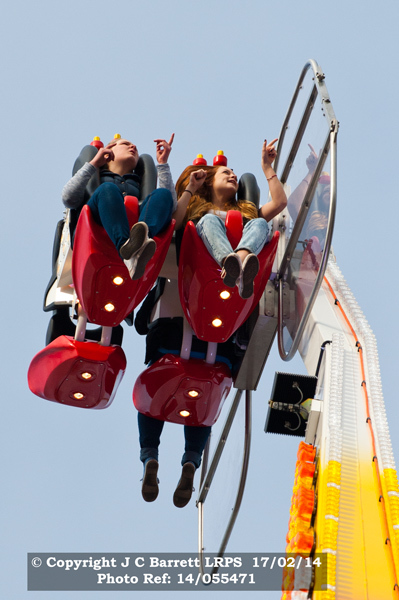 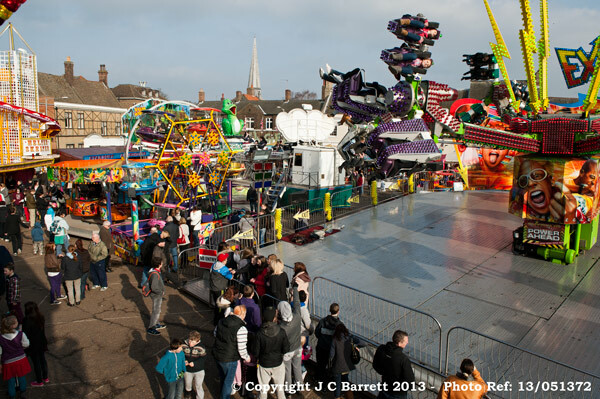 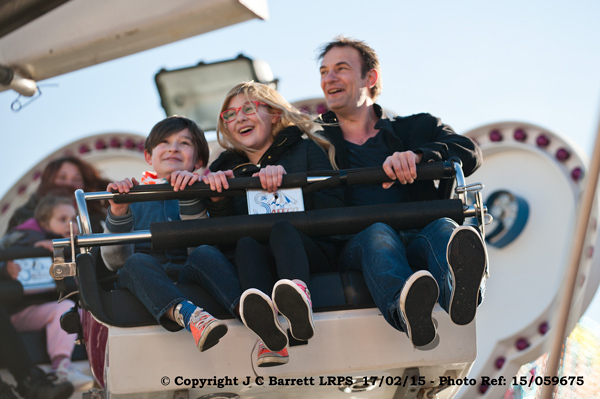 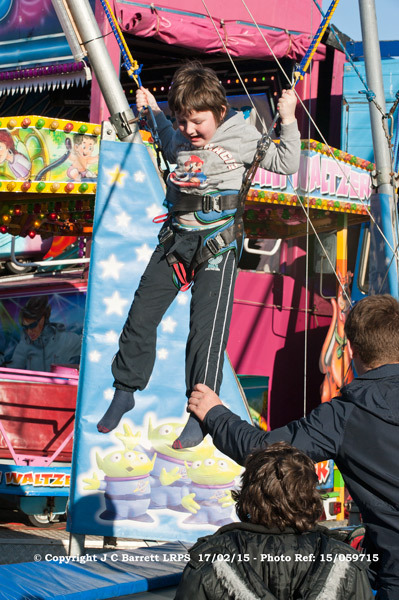 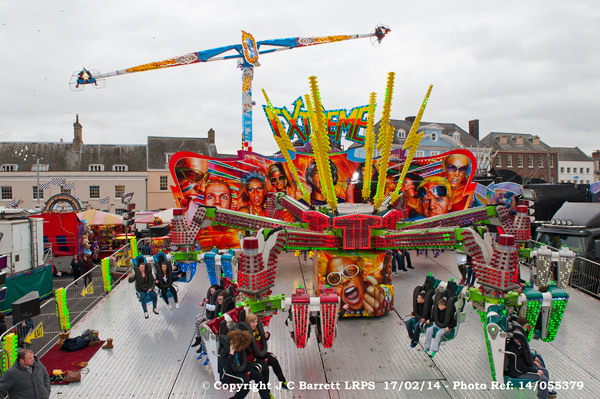 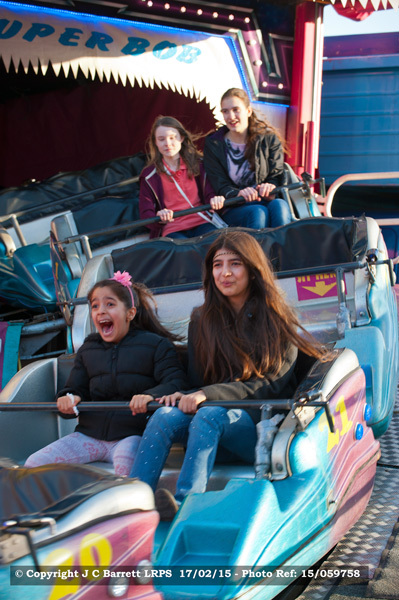 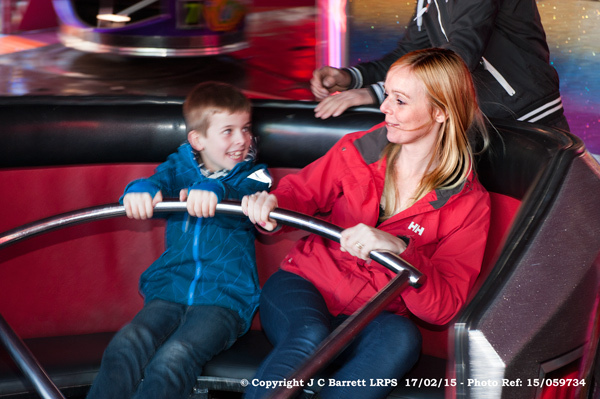 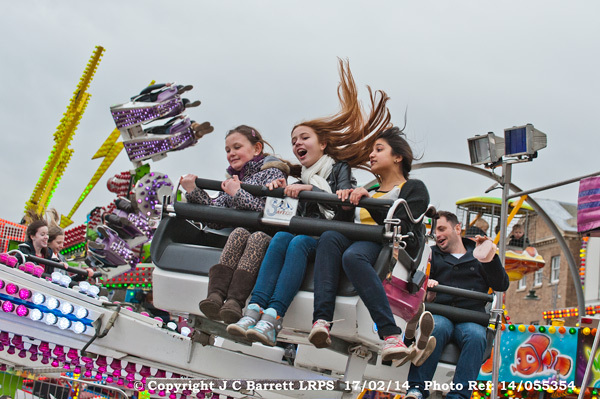 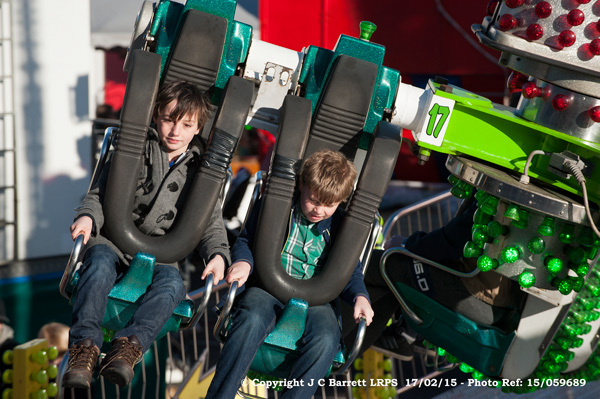 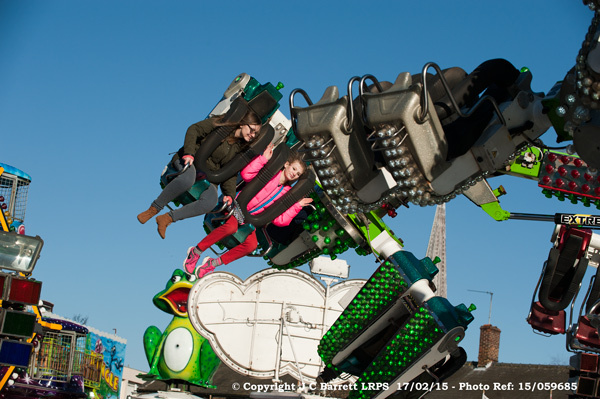 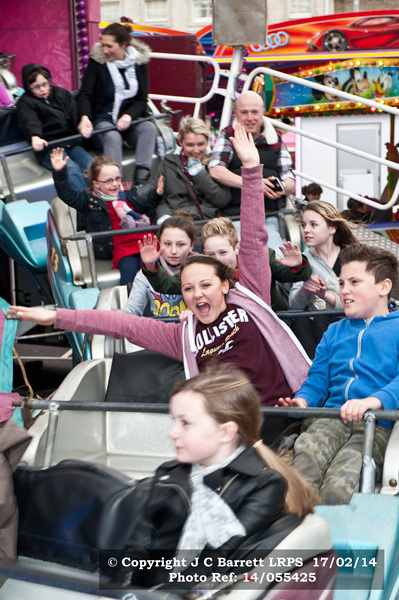 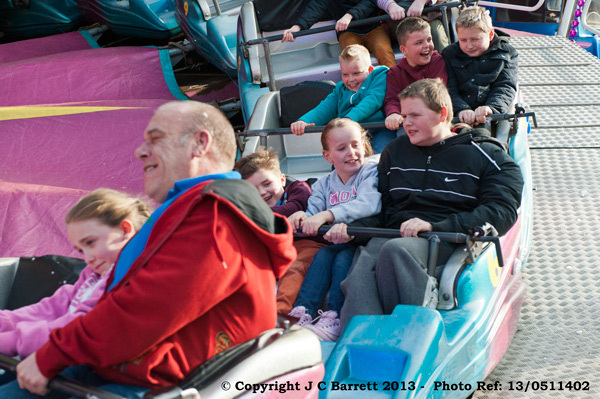 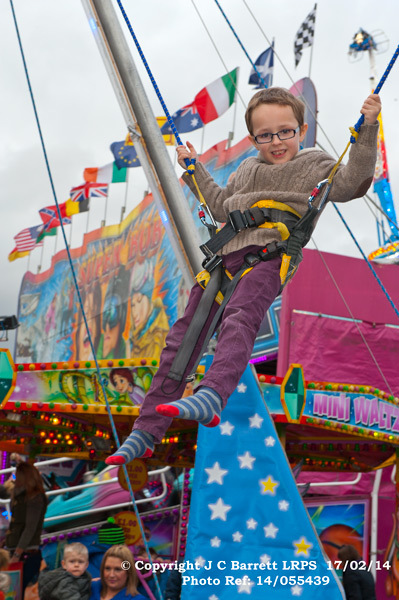 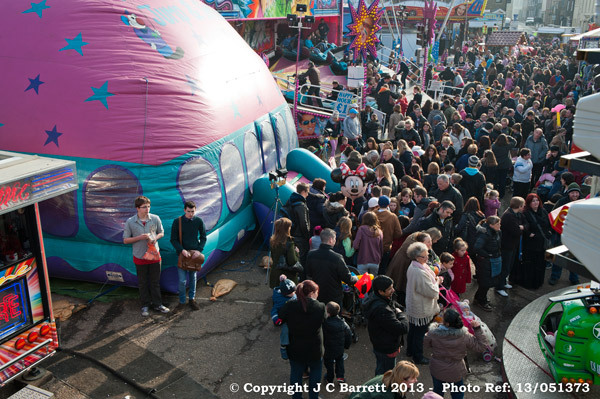 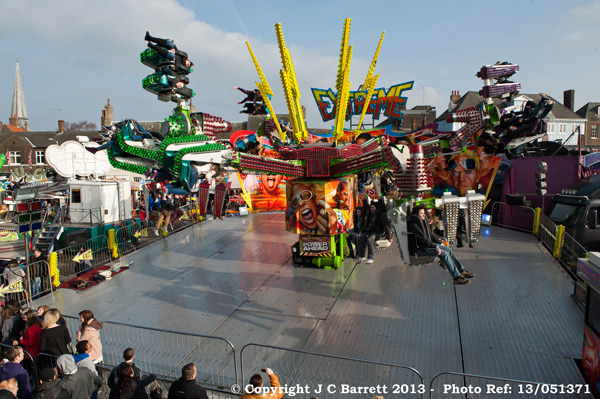 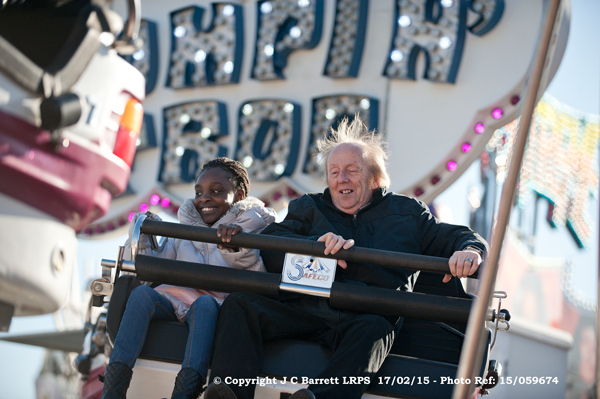 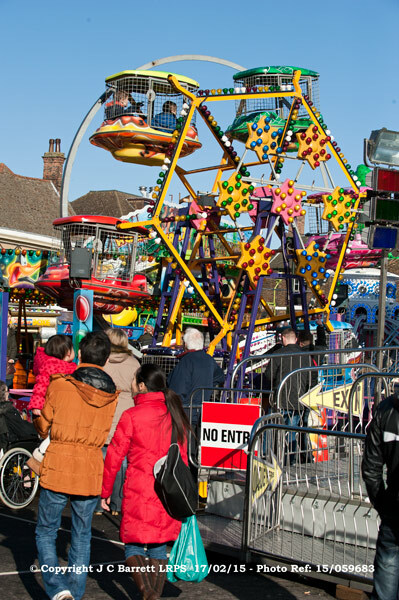 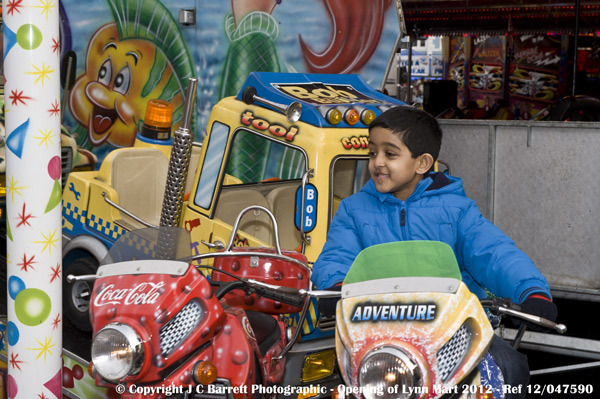 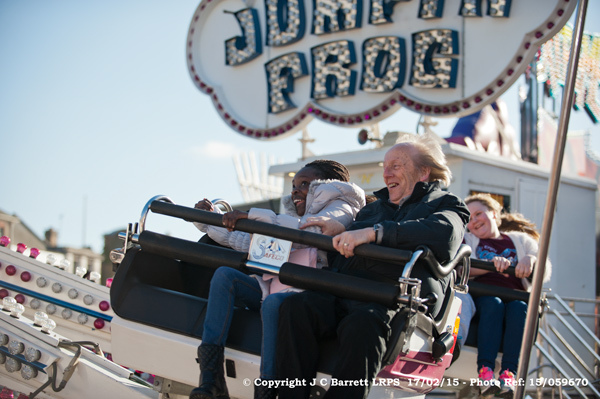 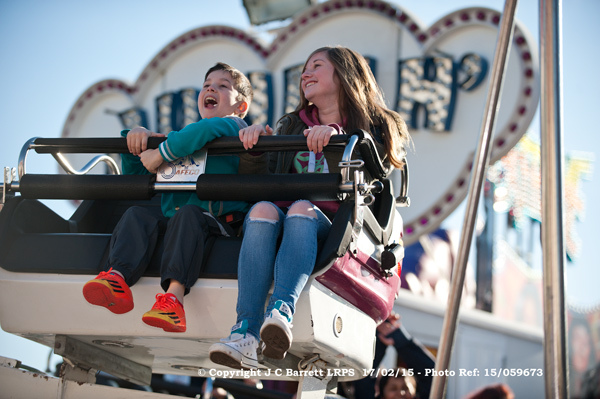 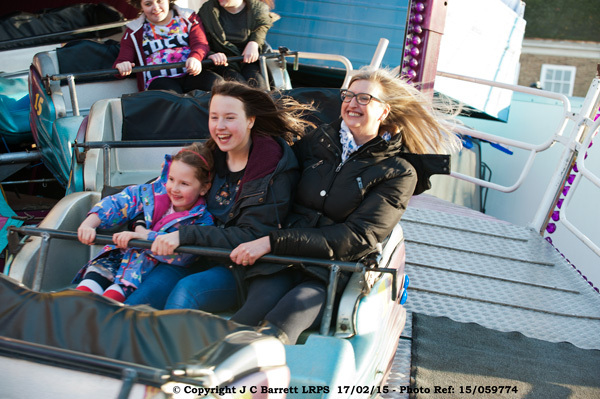 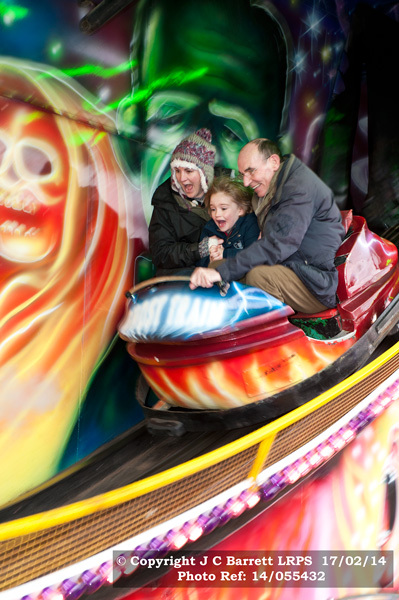 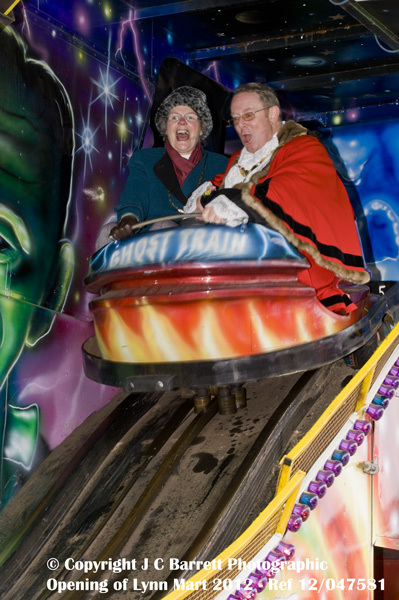 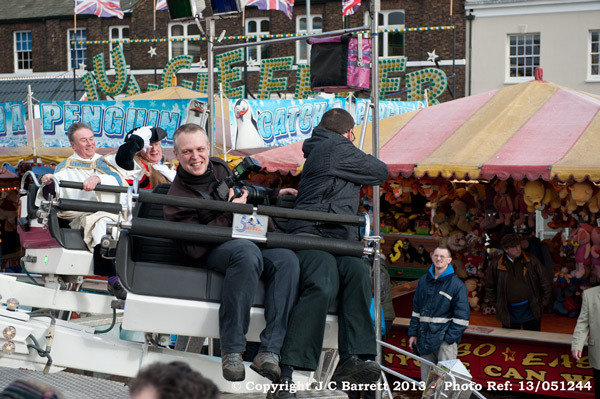 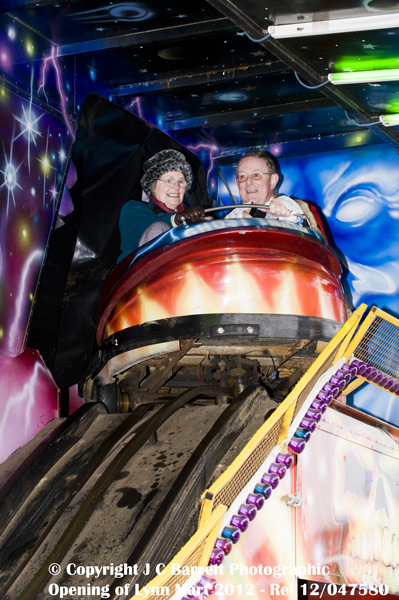 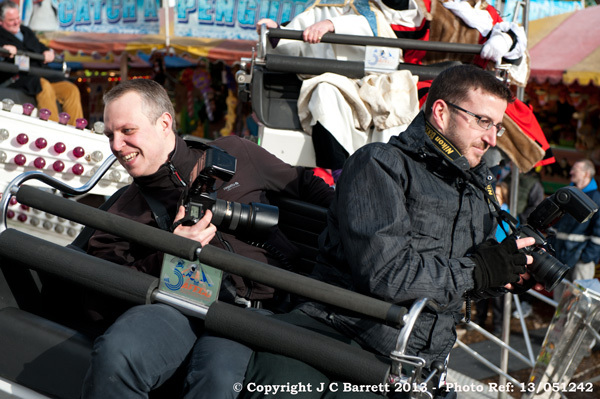 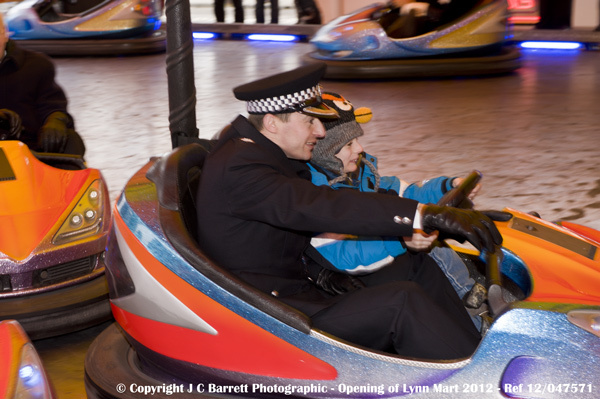 The rides include the Altitude which has a 140 ft drop is one of the big attractions (2nd year at Lynn), other rides include:- Jumping Frogs, dodgems, Waltzers, Jungle Fun house, Racc O Rama, Helter Skelter, Mini Waltzers, Hi Energy, Extreme, Electric Rotor, Chair-o-plane, Fun House, Super Bob, Mush Express, and much more. 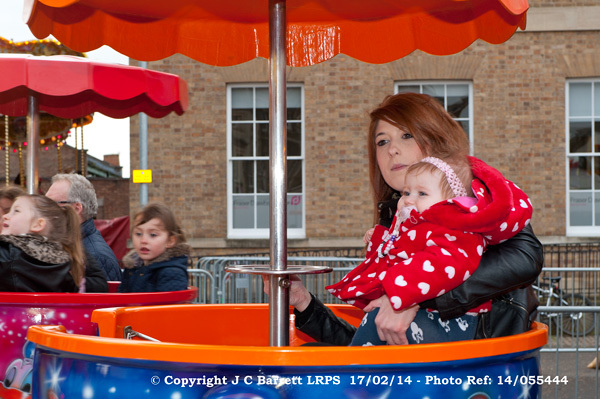 Click on ABOVE image to view other photographs. 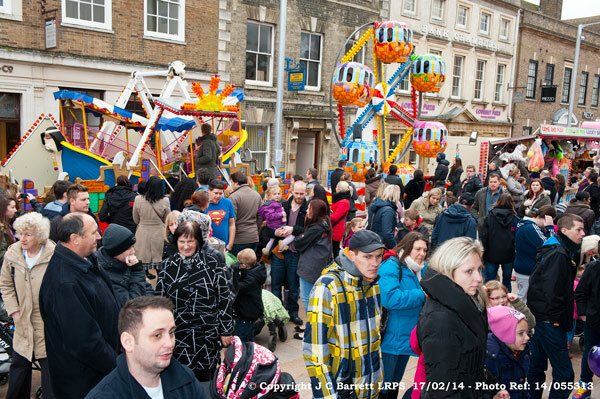 This year's event ran until Saturday, February 28 2015. 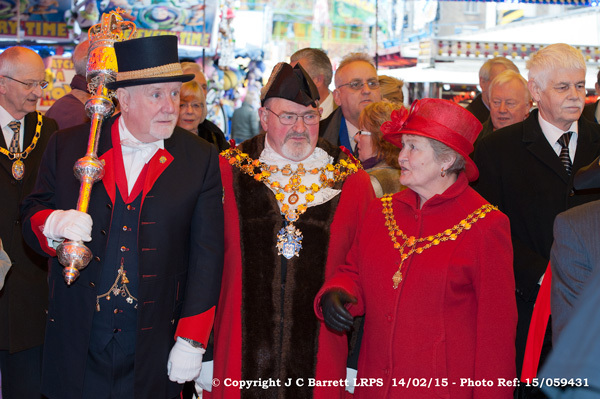 The traditional Family Day took place on Monday 16th February 20915. 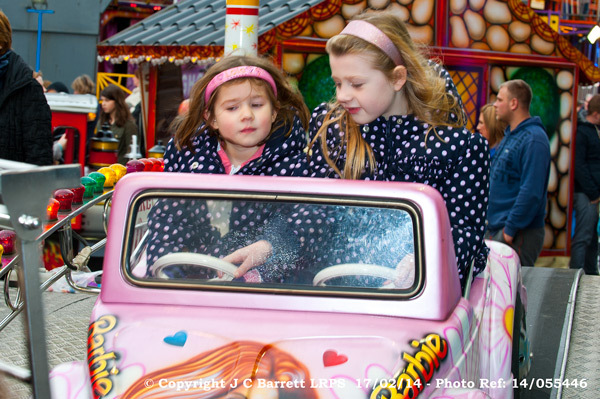 The Mart will opened at 12 noon all of half-term week (Monday 16th February Friday 20th February 2015). 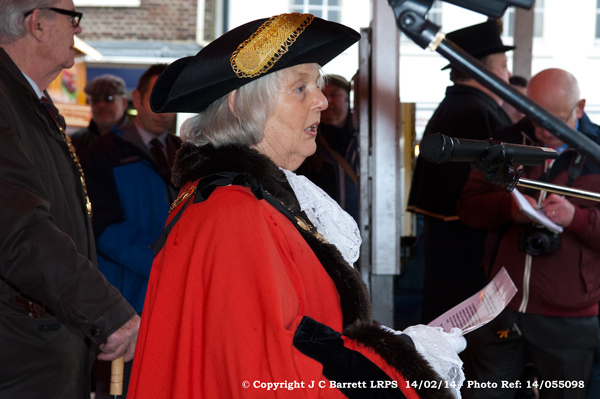 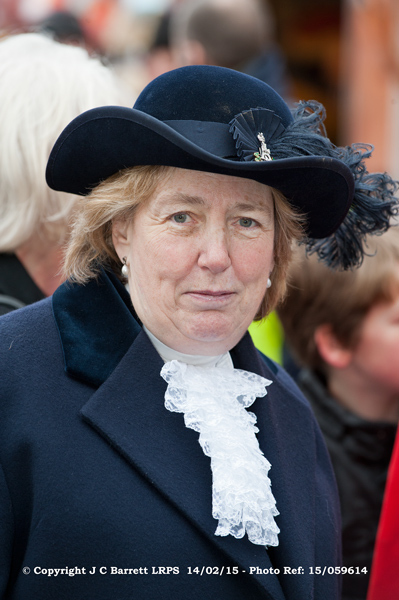 2014 - The official opening by the Borough Mayor Elizabeth Watson, with the traditional proclamation before the mayors of neighbouring boroughs and other dignitaries took place on Friday 14th February 2014 (St Valentine's Day) at 12 noon. 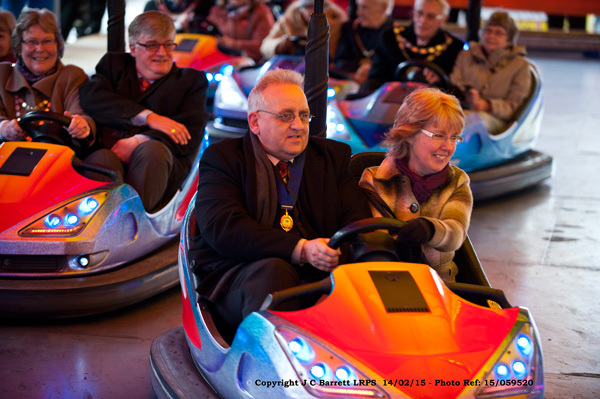 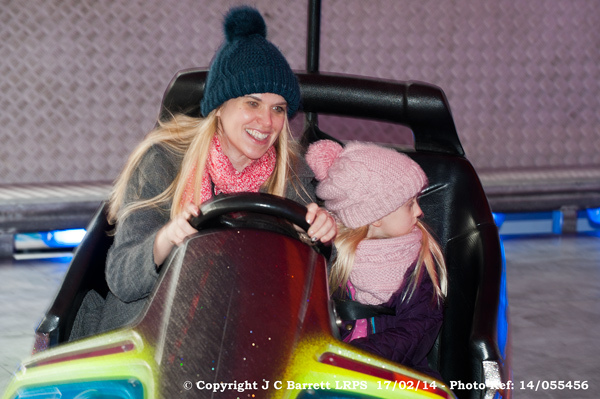 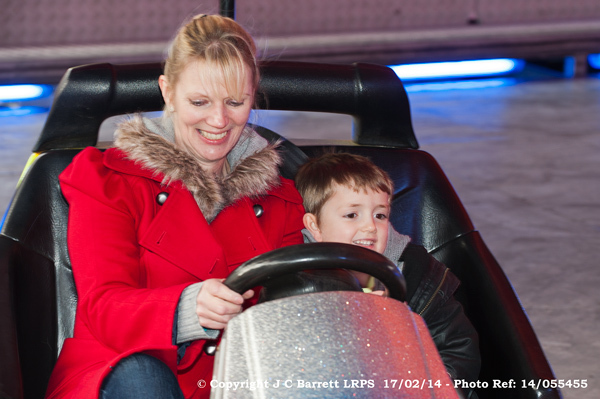 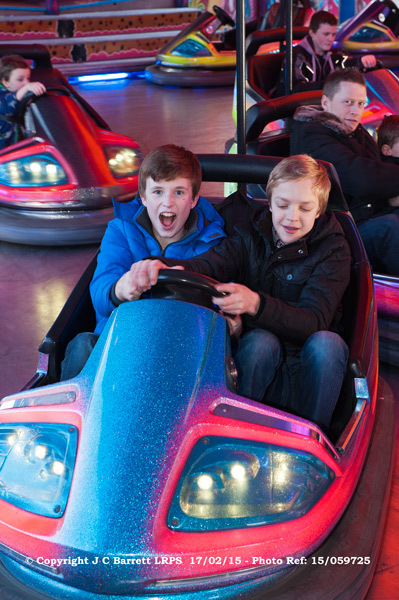 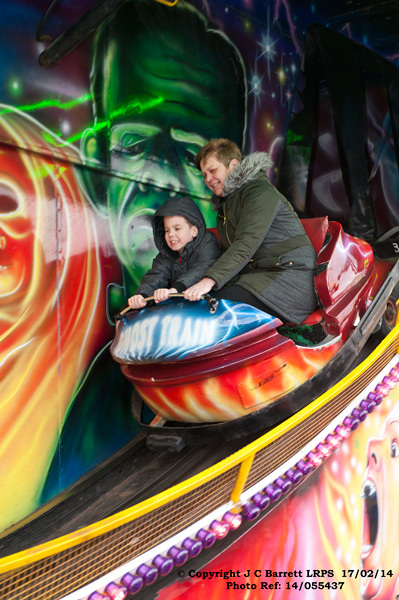 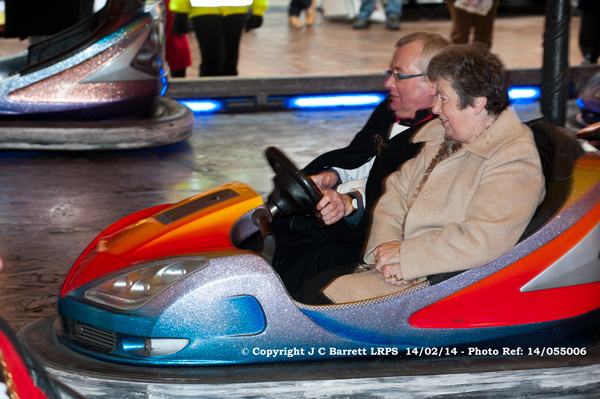 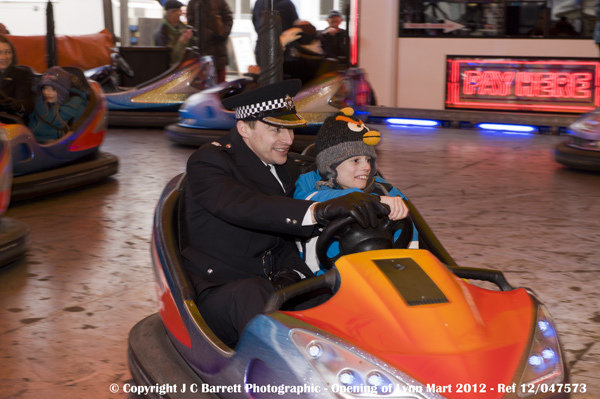 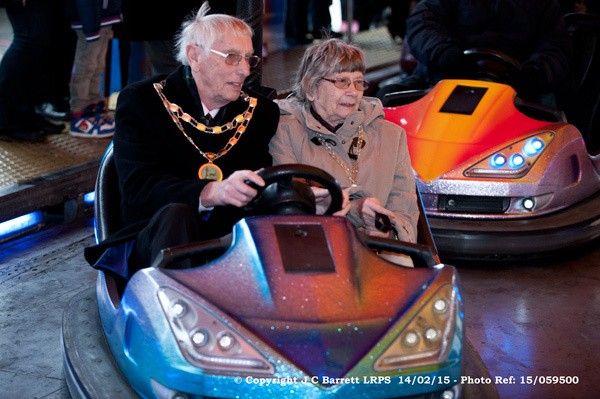 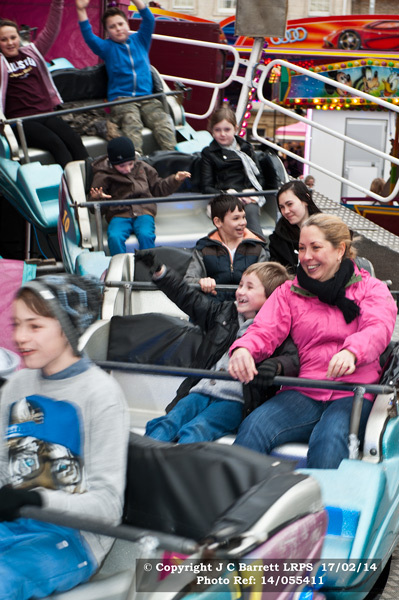 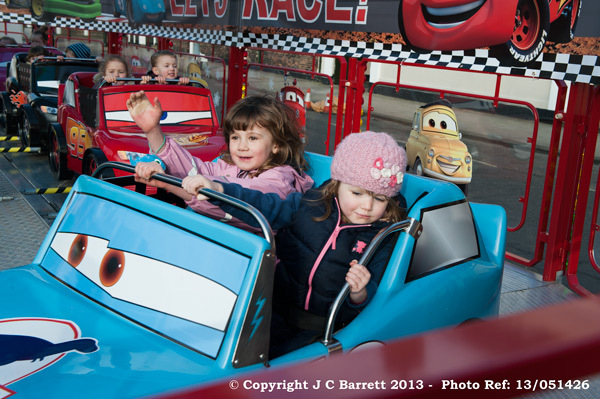 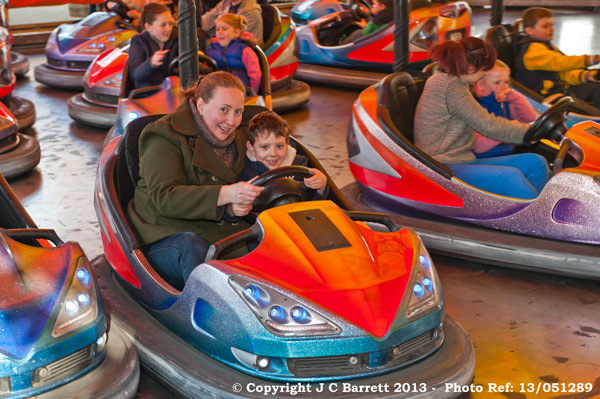 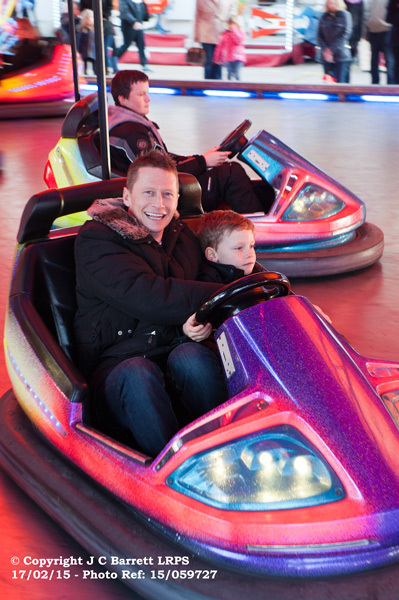 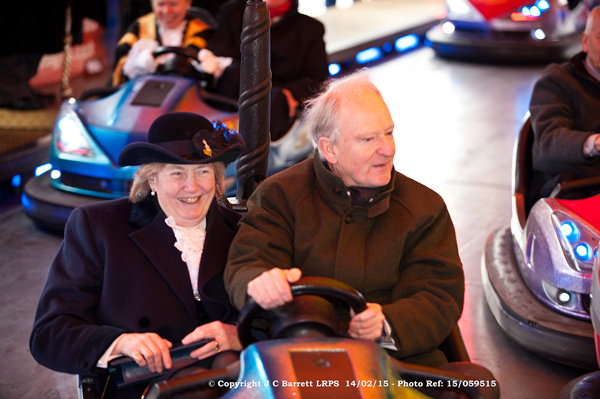 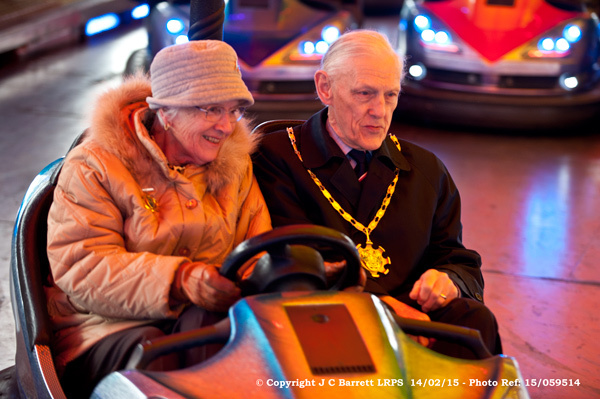 The family day was on Monday the 17th February, from 12 noon till 10pm, when all rides were £1, apart from the Booster and Dodgems. 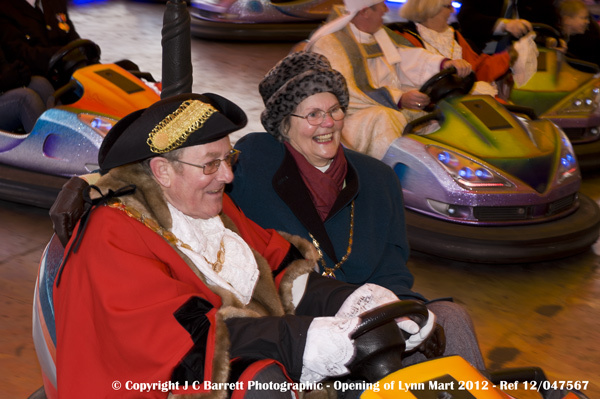 The Mart is always in the town, this marks the first event in the showmen's year, which sees families travel all over the country, many from King's Lynn. 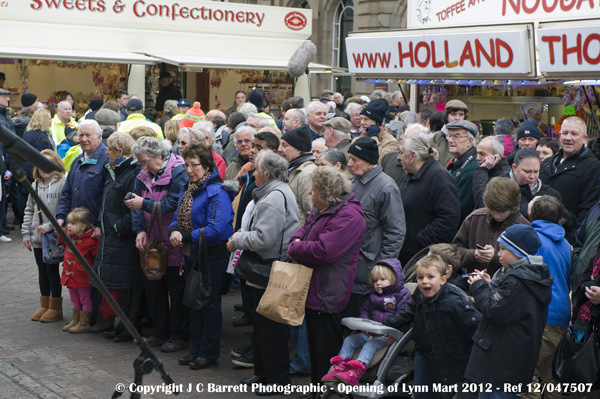 This is the first year for the mart since the major refurbishment which has seen parts of the square paved ready for cafe seating over the last few months. 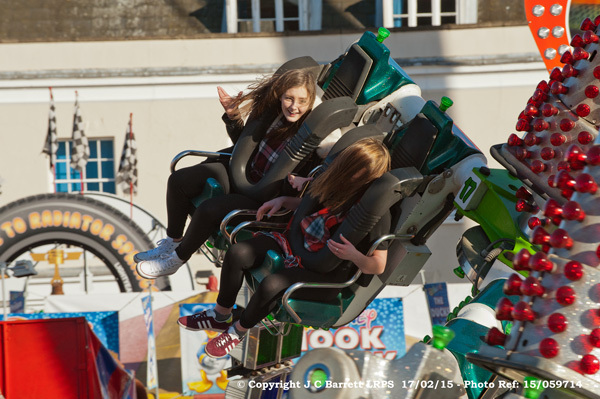 There were no less than three new rides to experience including the new Altitude ride as well as the traditional Carousel returning after a four year break. 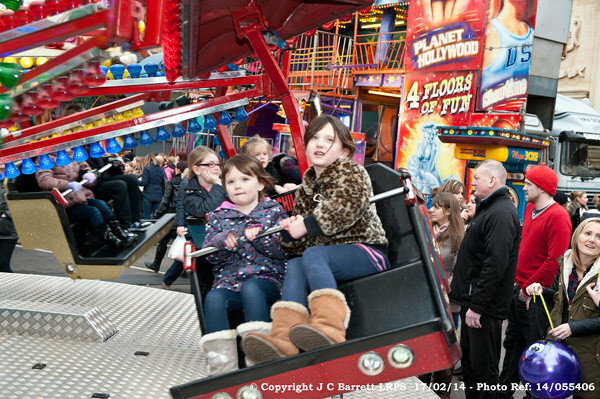 The Mart had some "breathtaking" rides. 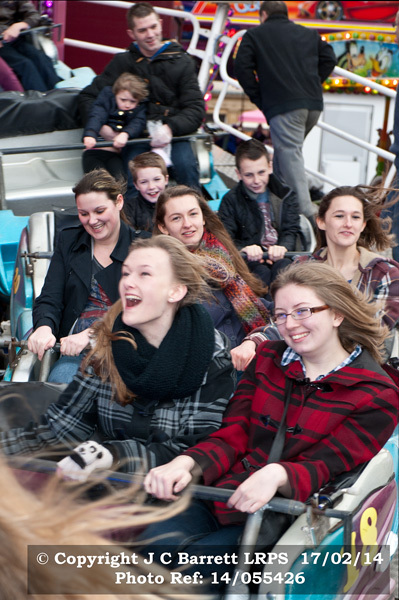 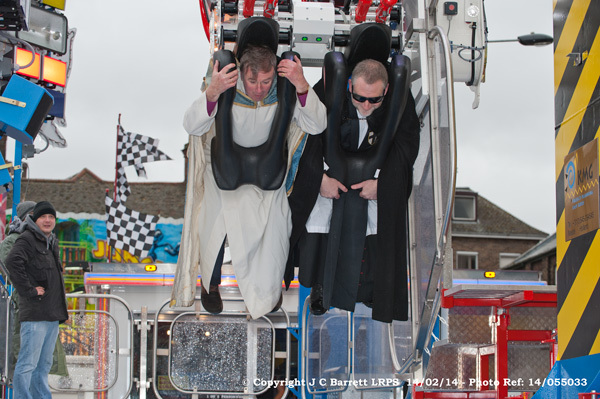 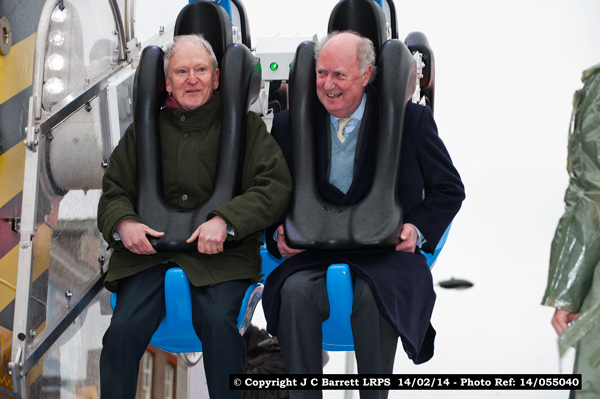 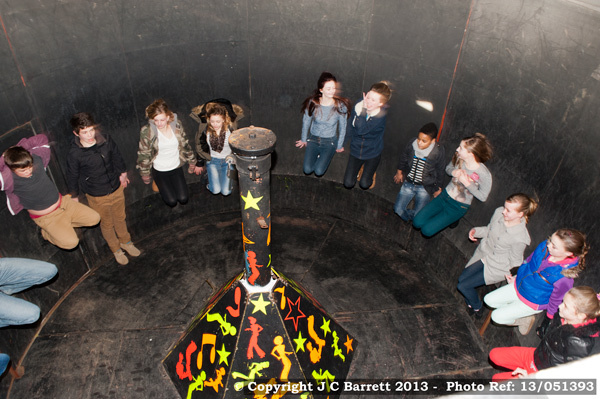 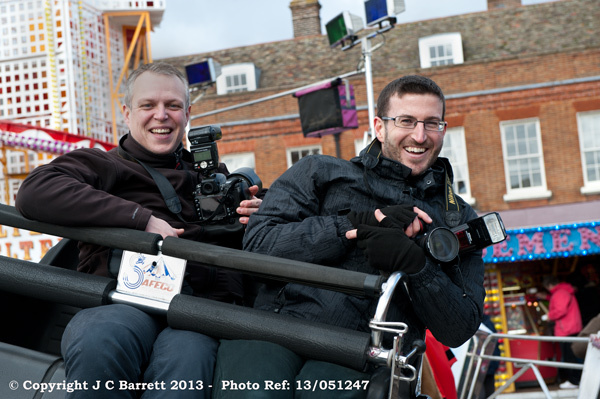 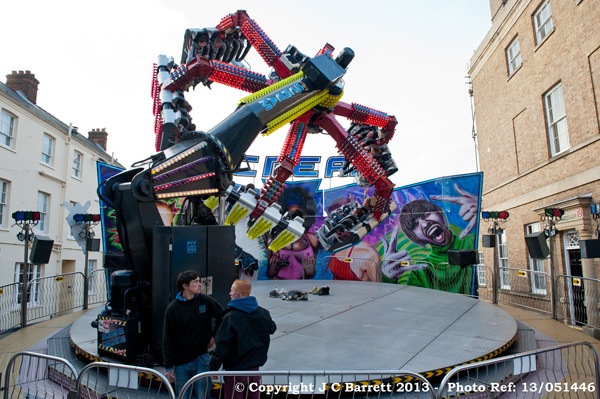 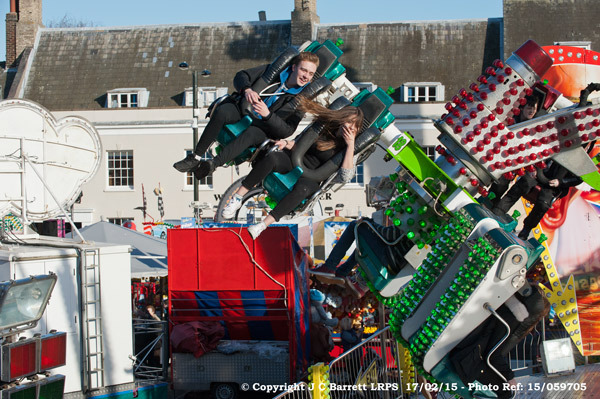 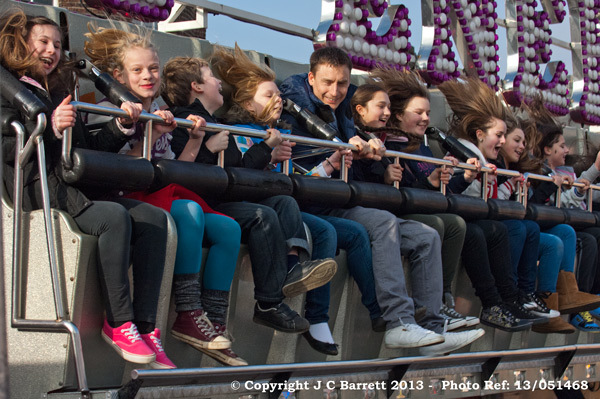 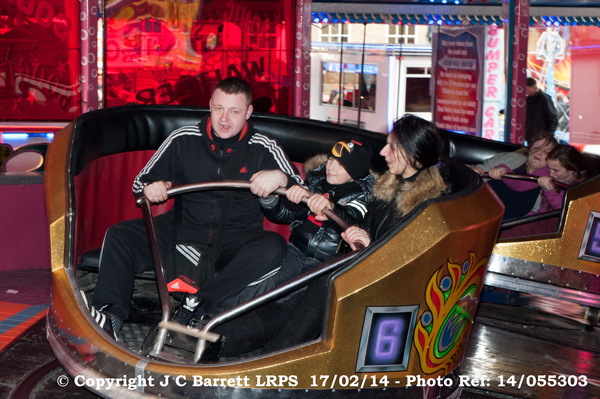 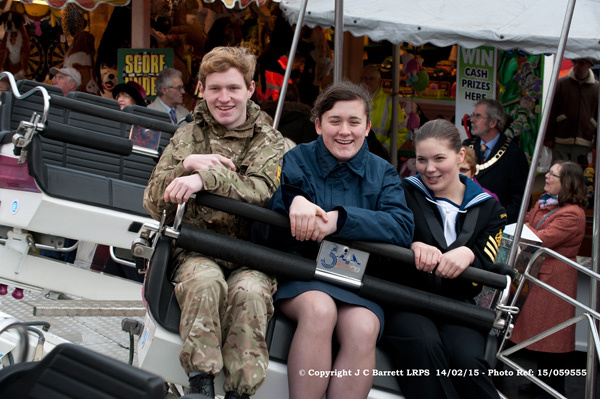 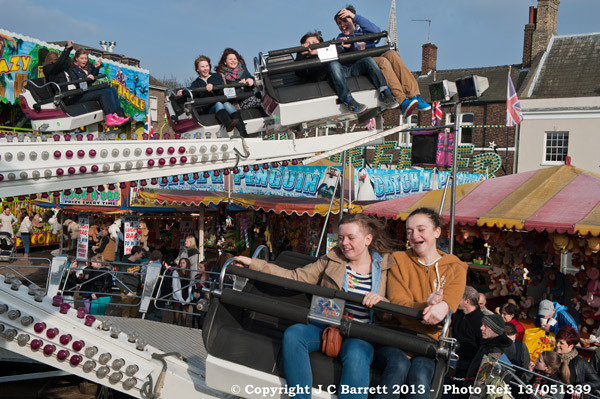 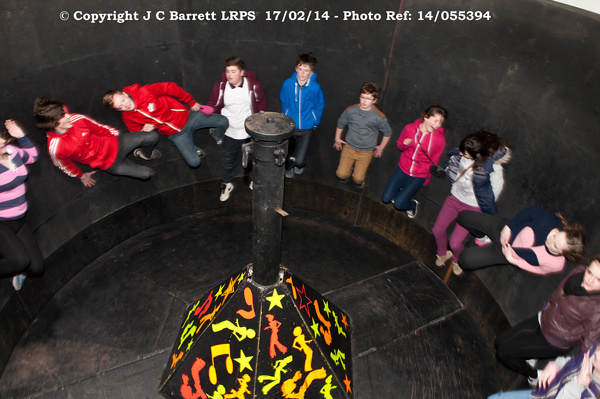 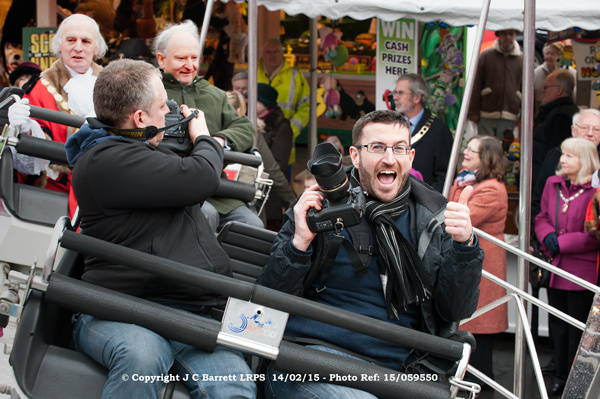 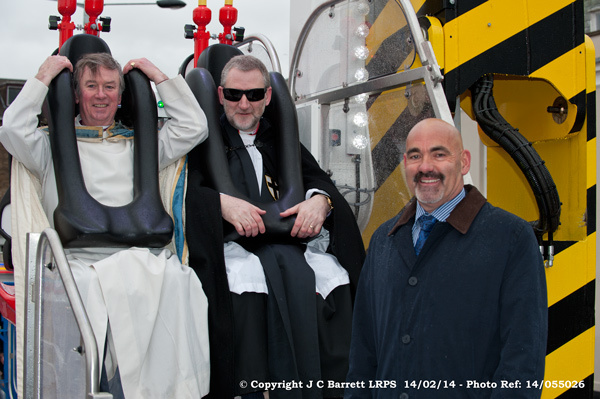 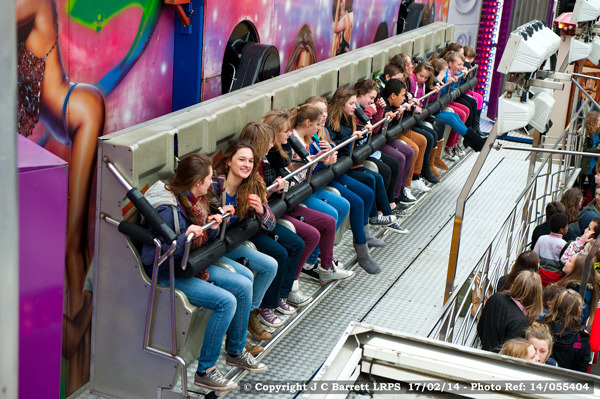 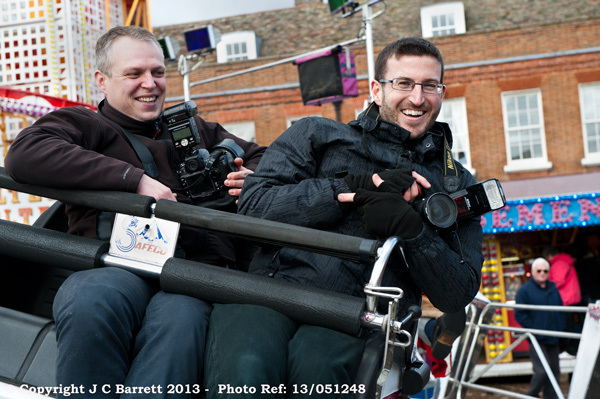 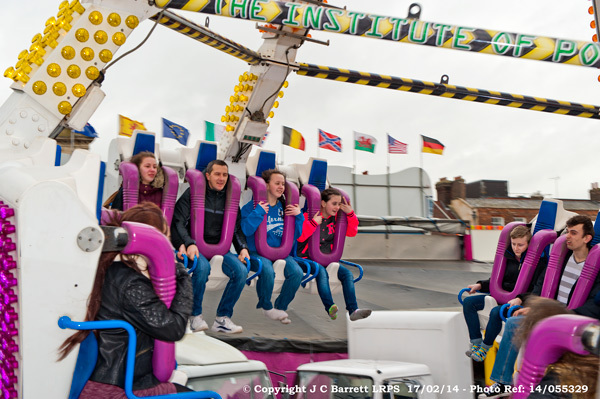 For the first time the Altitude which has a 140 ft drop was one of the big attractions, another ride was the Oblivion that holds 16 people at a time and swings from side-to-side and up-and-down, this too was its first appearance at the King's Lynn mart. 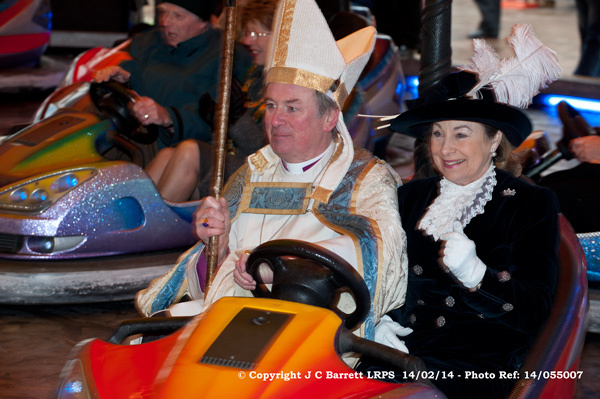 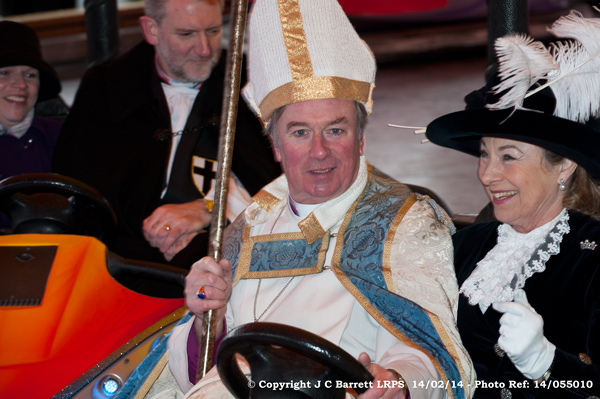 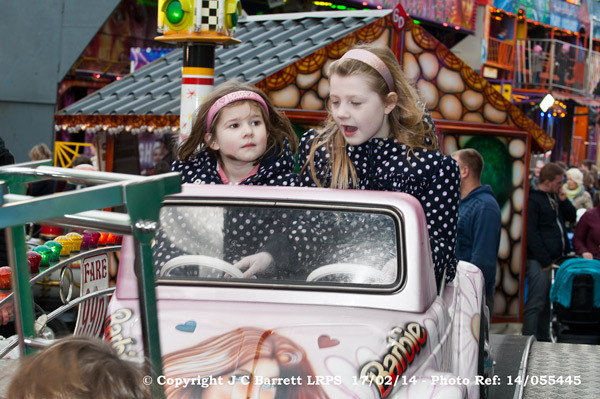 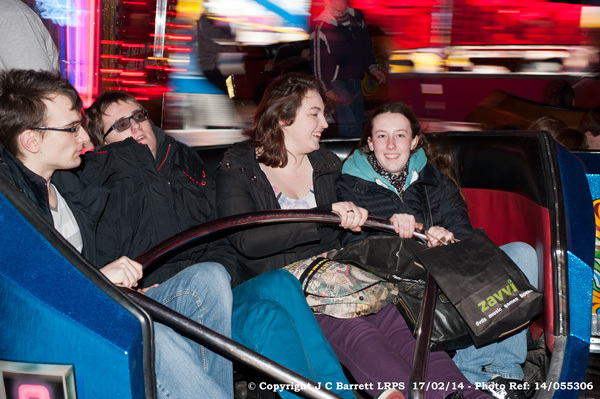 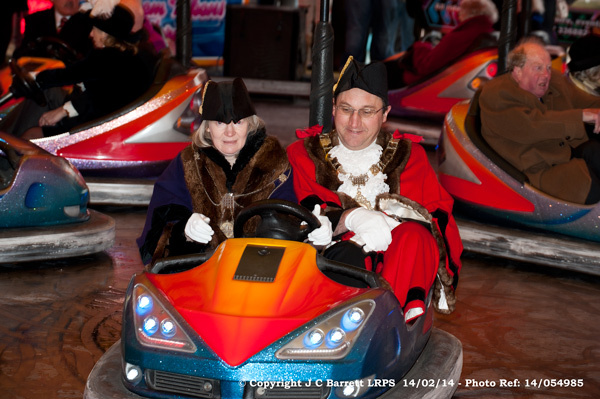 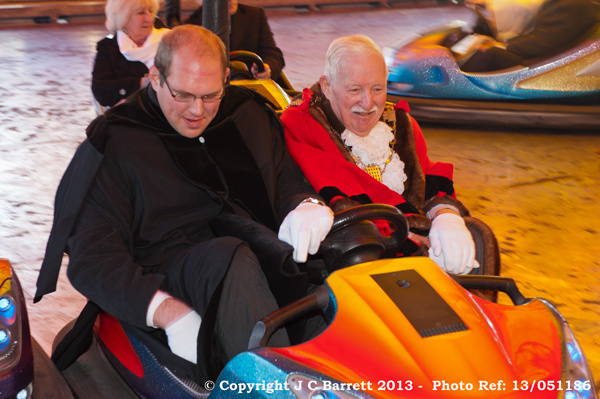 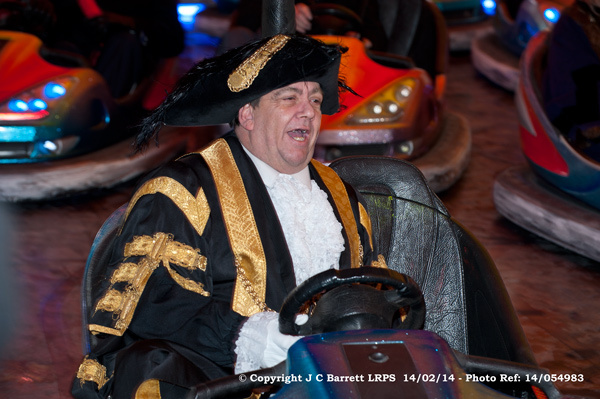 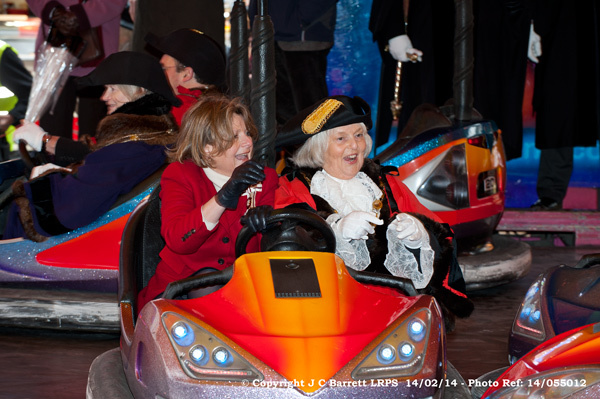 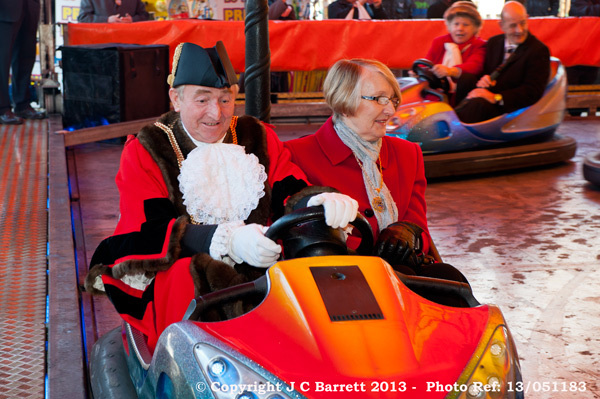 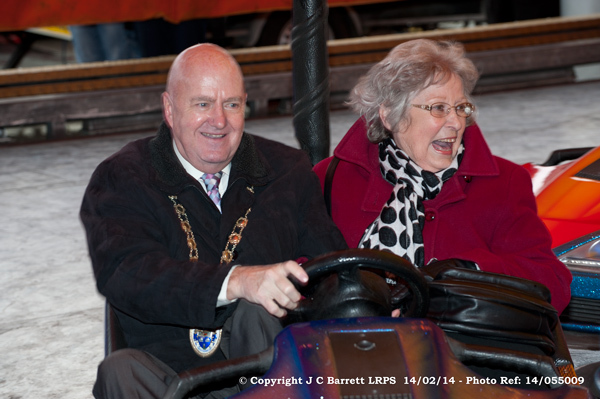 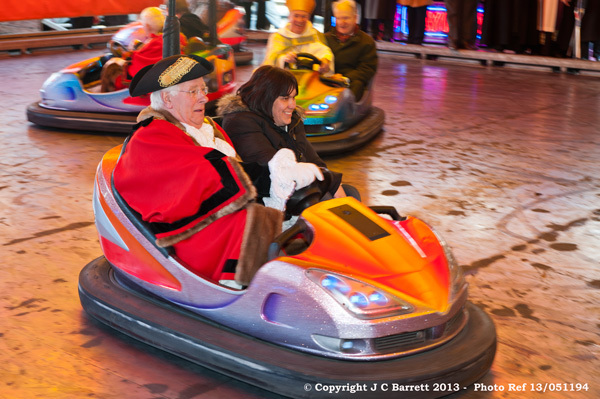 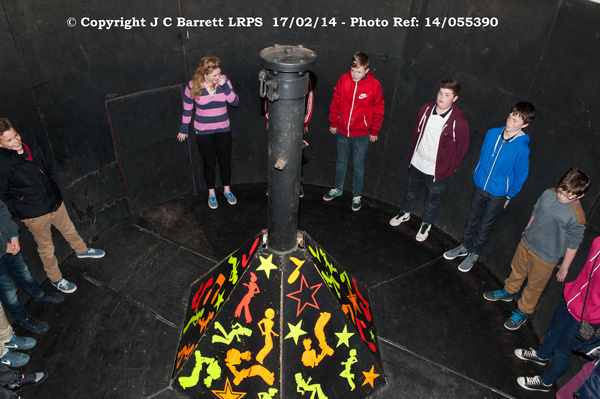 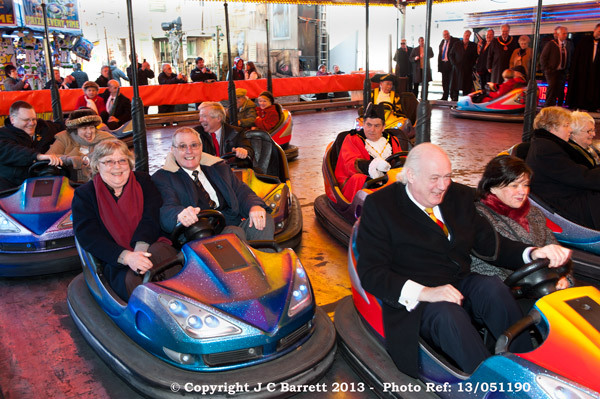 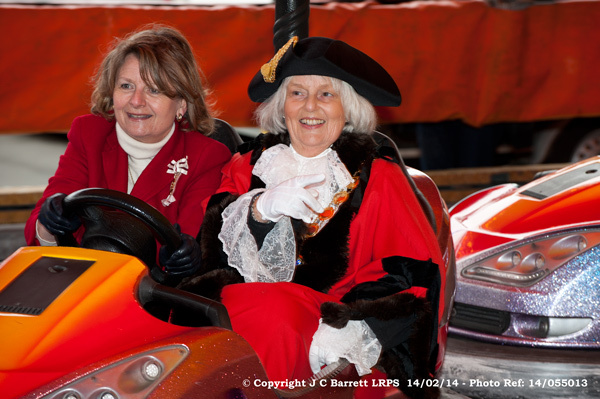 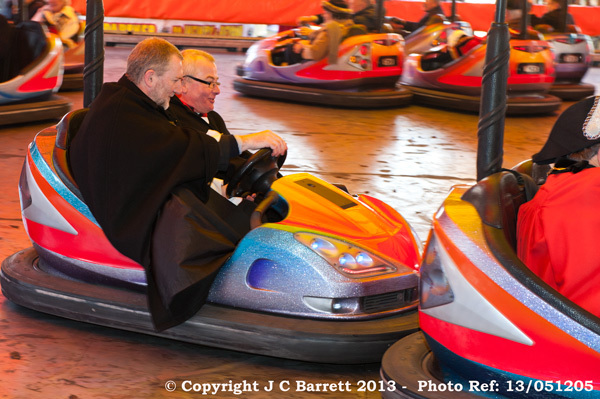 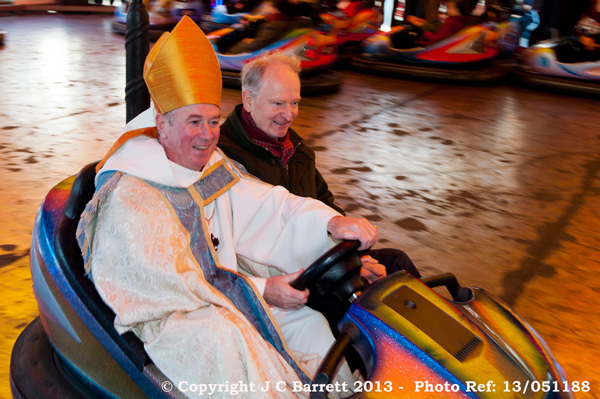 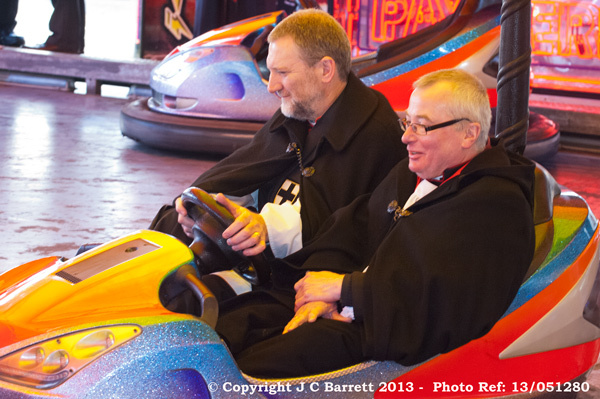 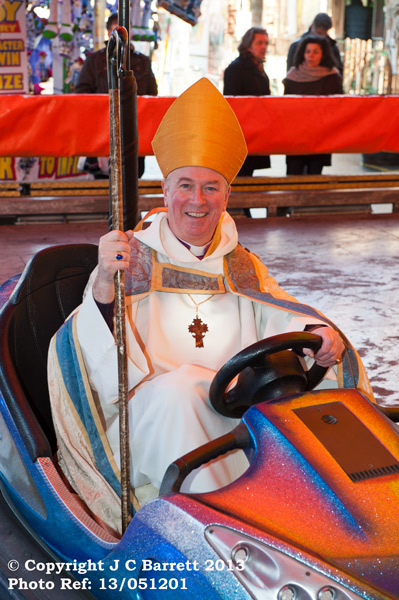 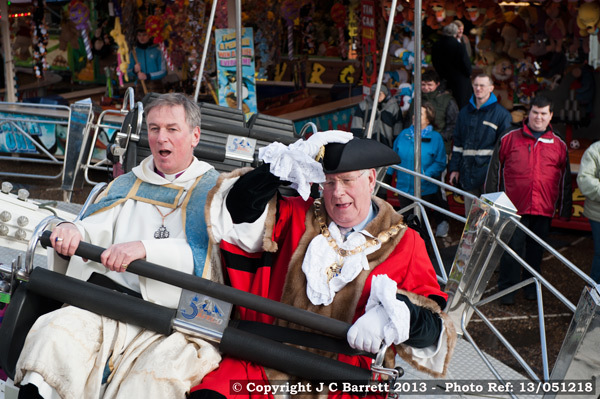 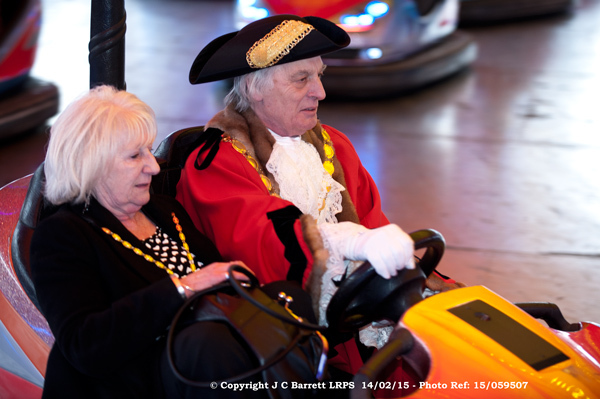 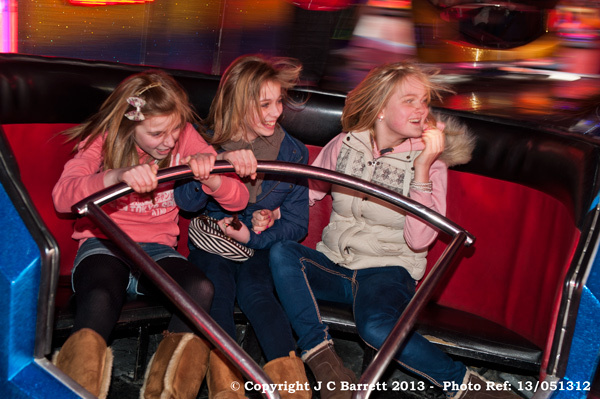 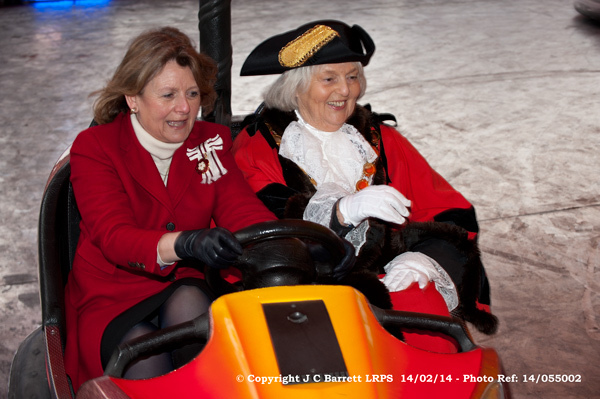 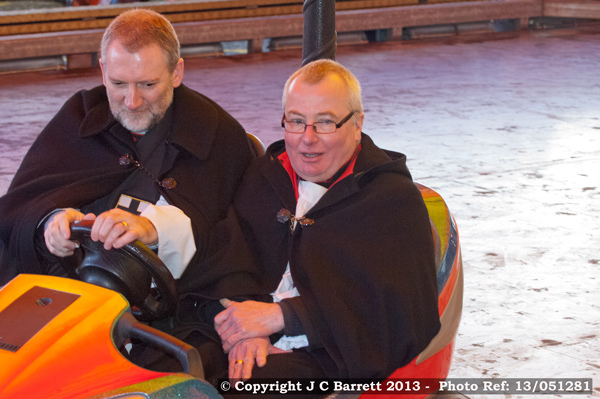 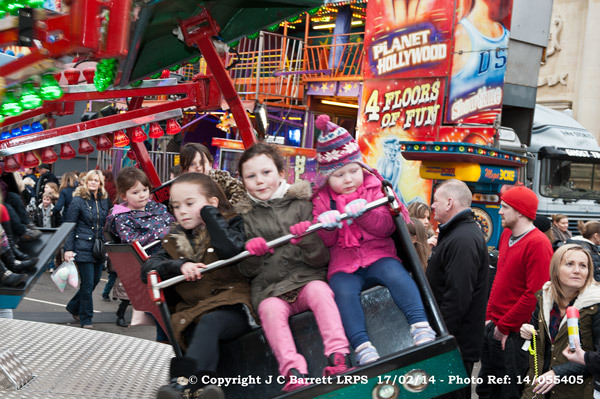 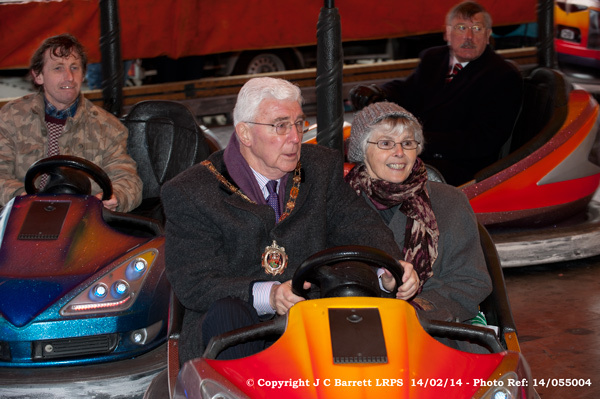 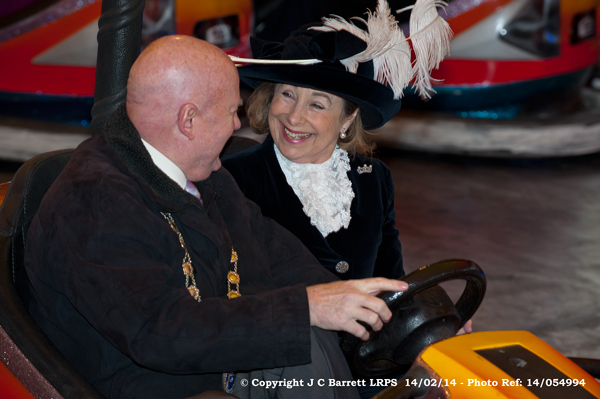 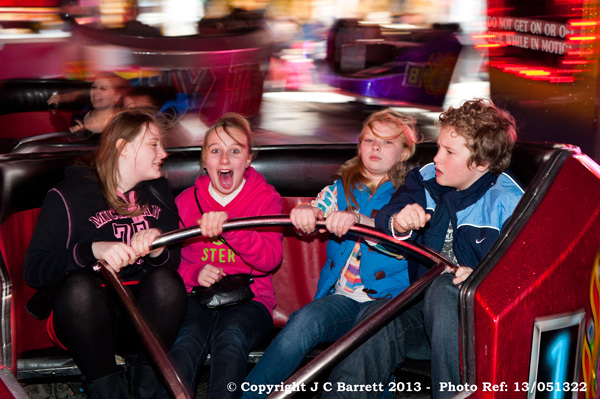 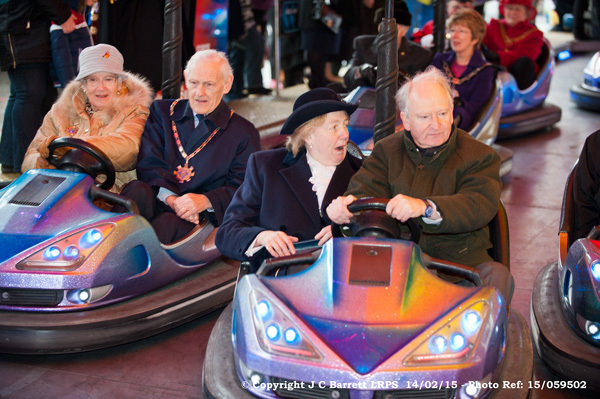 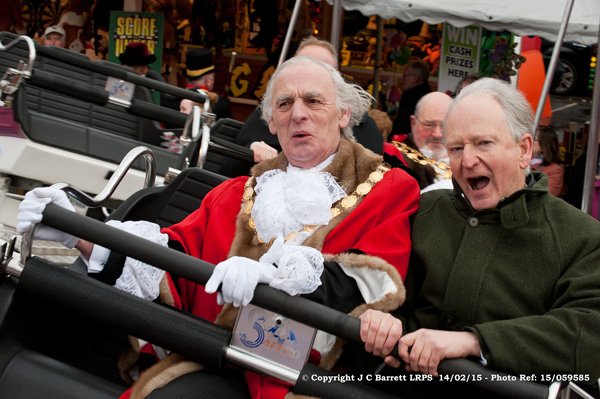 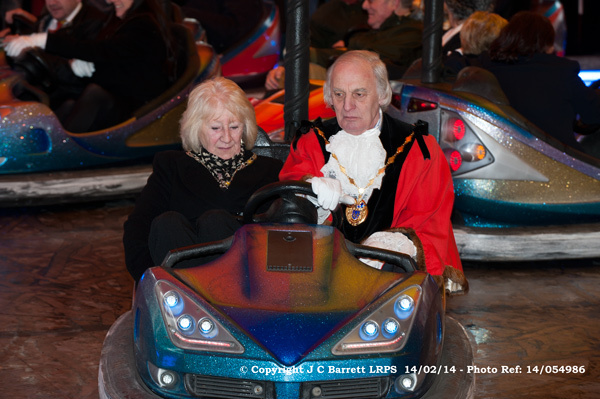 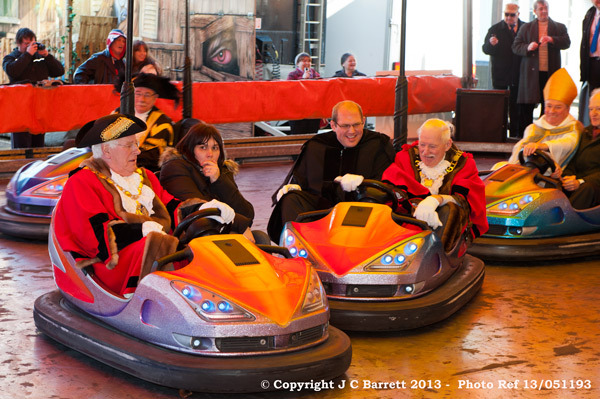 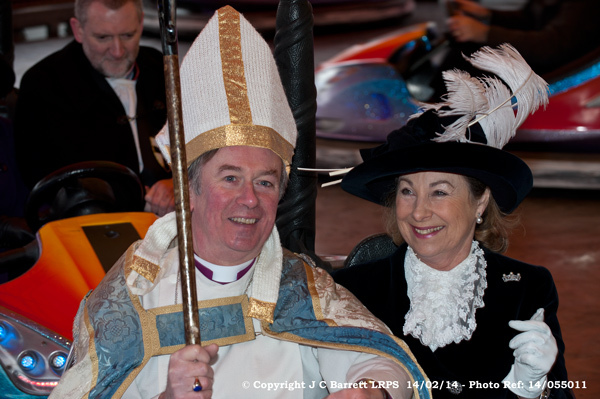 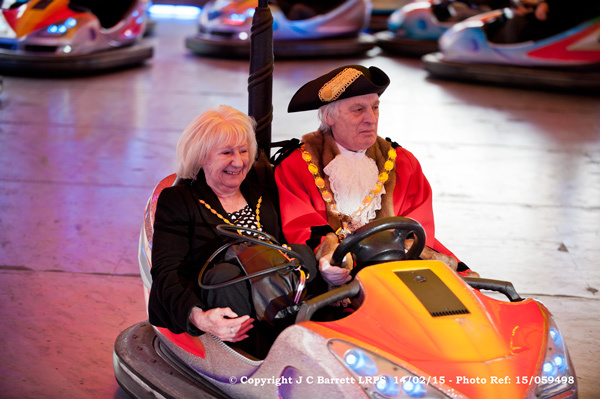 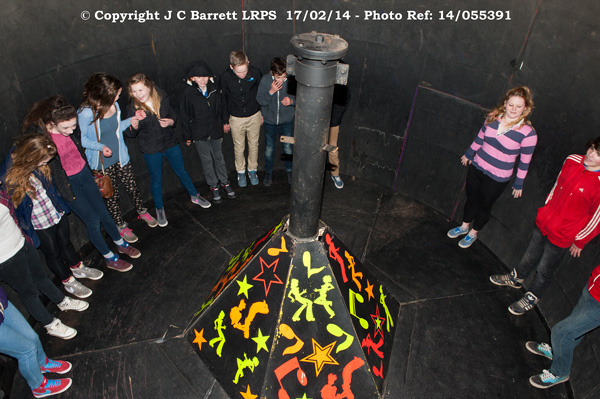 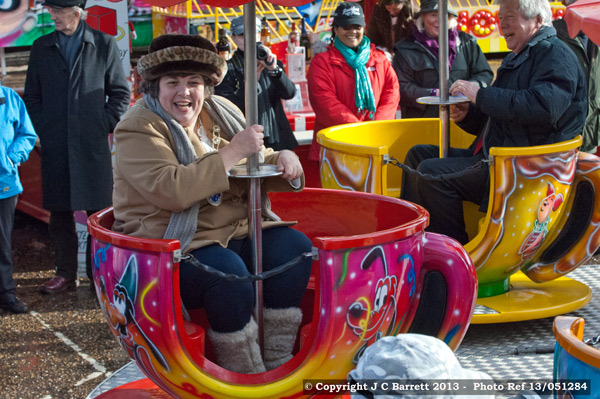 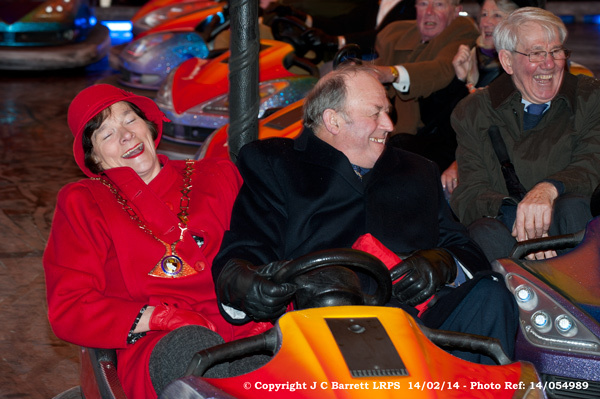 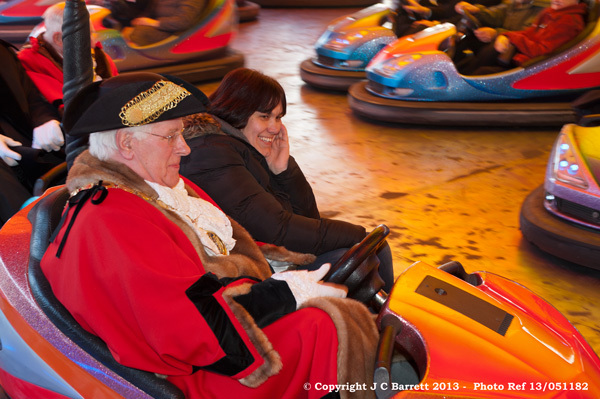 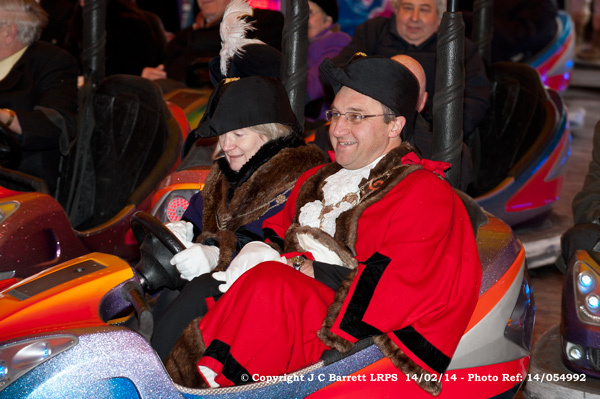 As usual there were traditional rides such as the Jumping Frogs, the dodgems and the Waltzers. 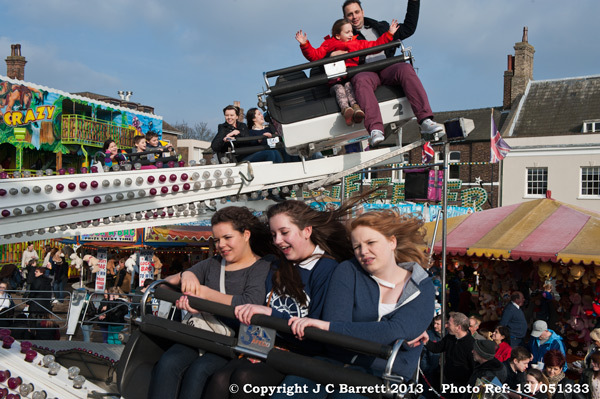 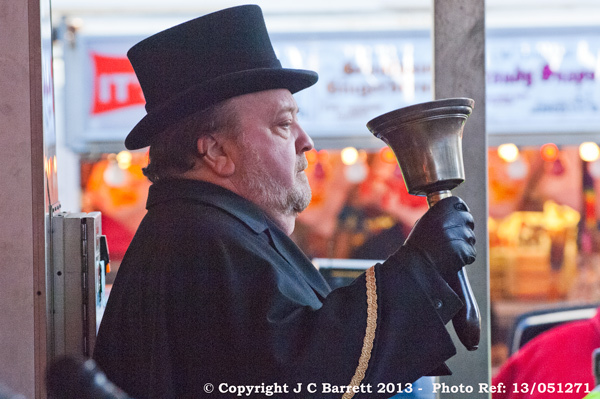 This year the showmen and women had to set-up the fair before the high winds and rain which had been forecast arrived. 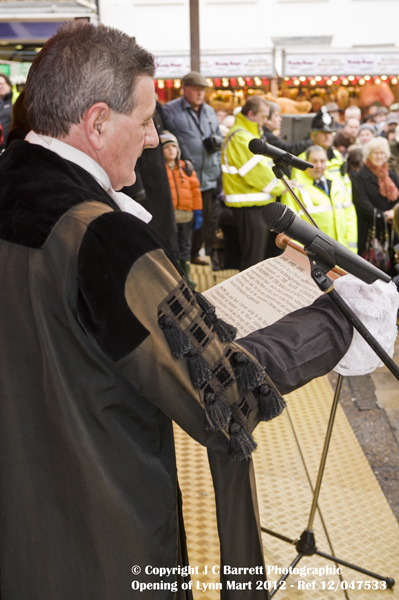 The final day was 25th February. 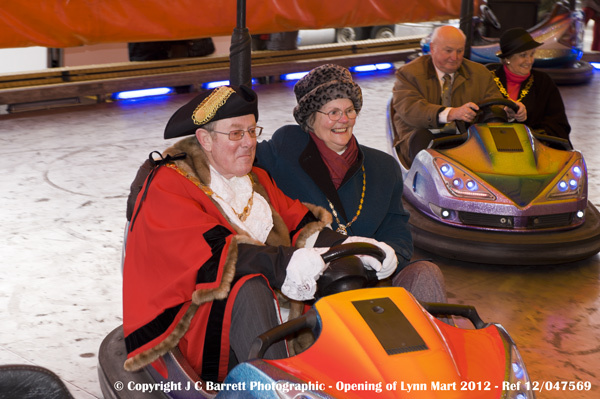 King's Lynn Mart February 14th 2013. 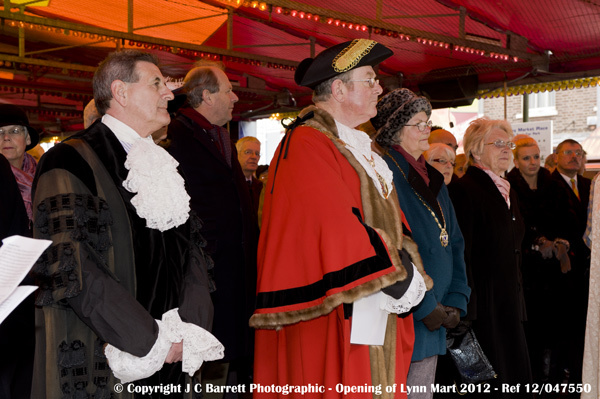 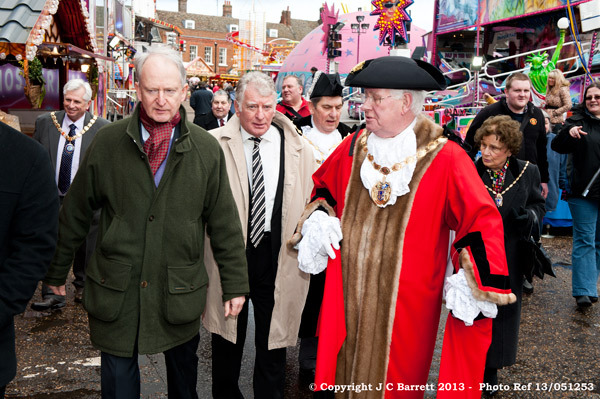 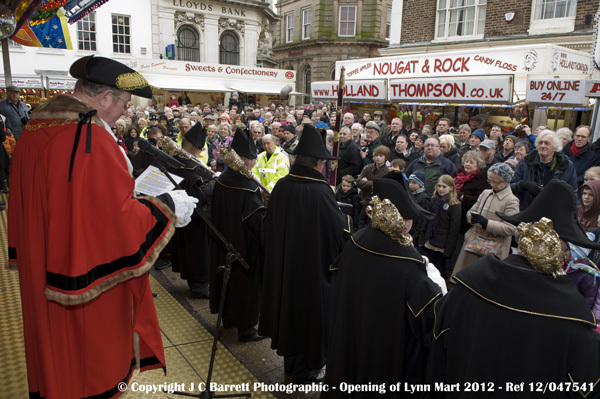 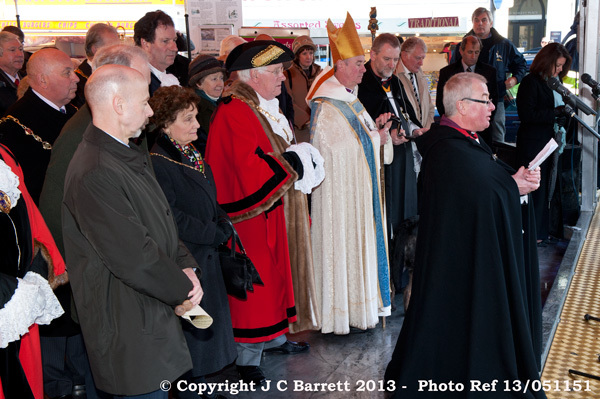 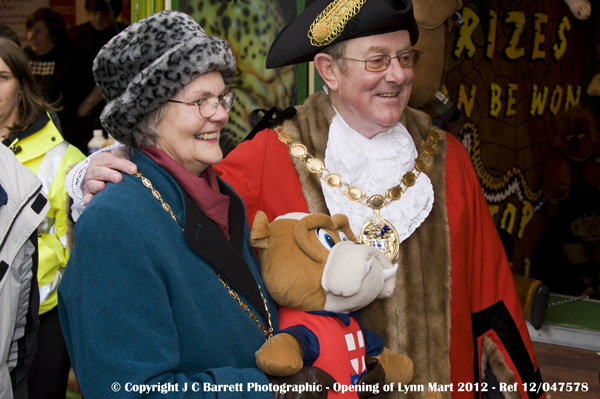 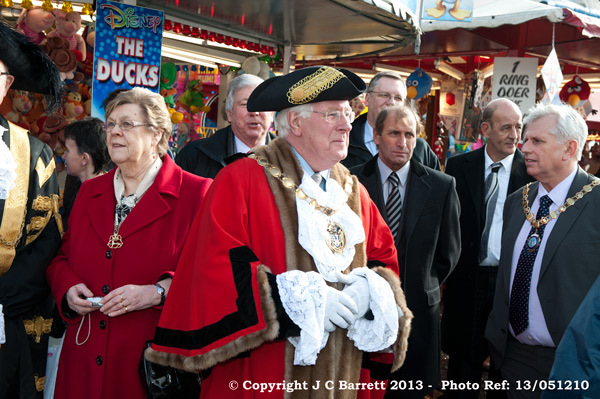 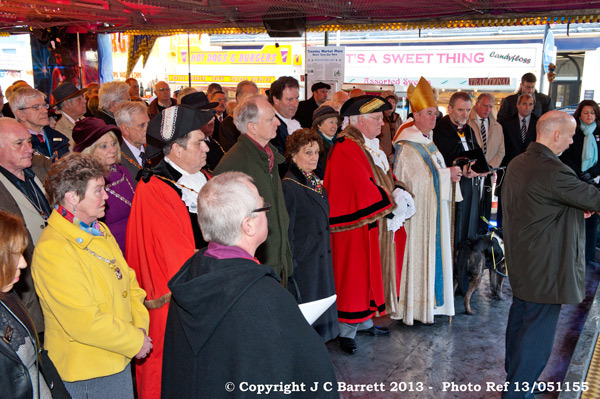 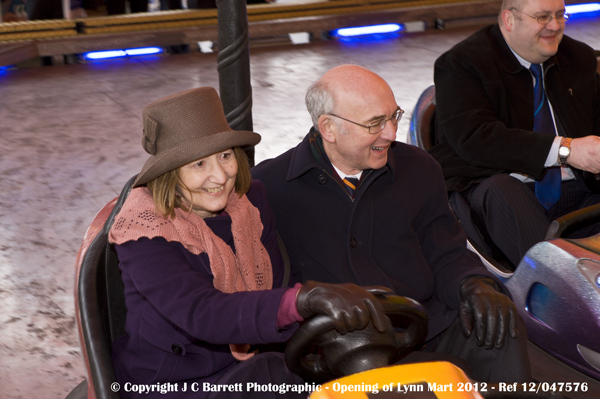 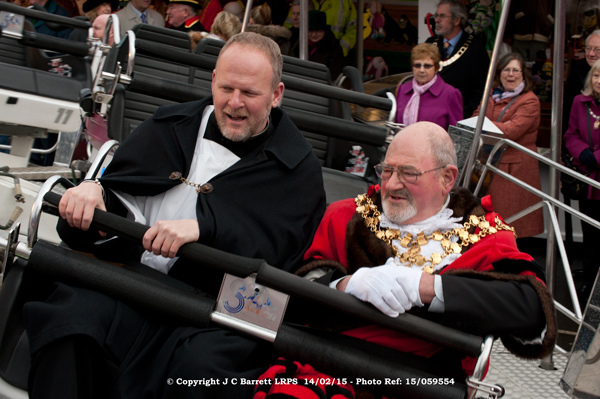 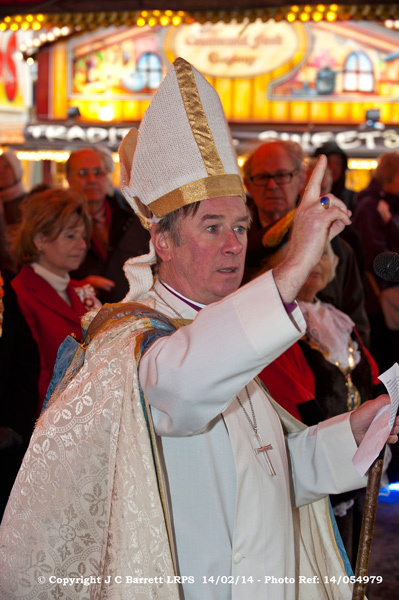 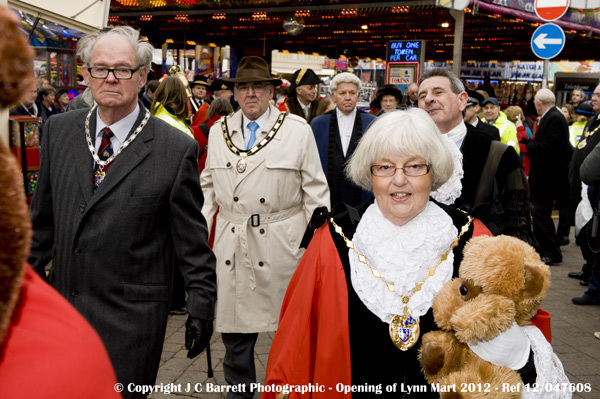 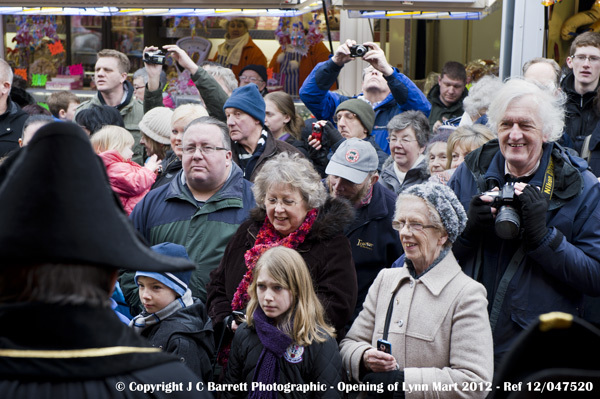 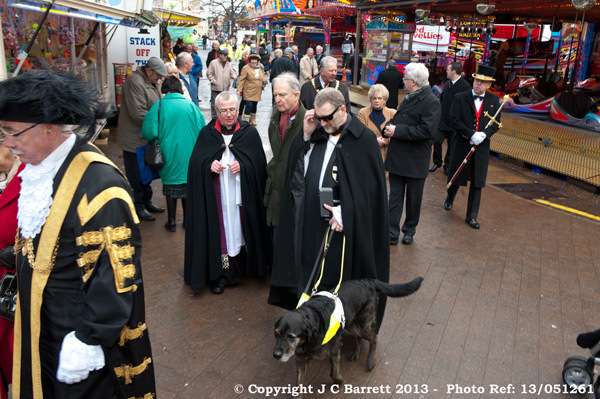 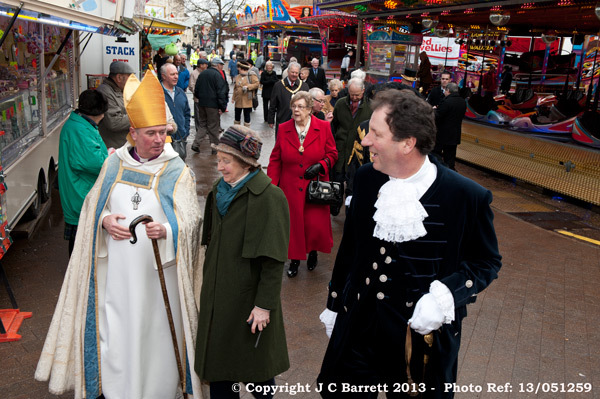 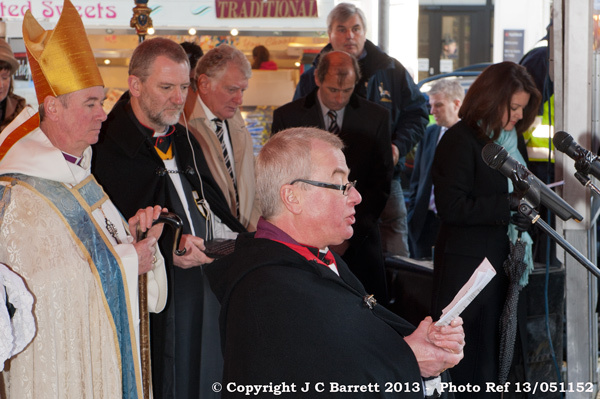 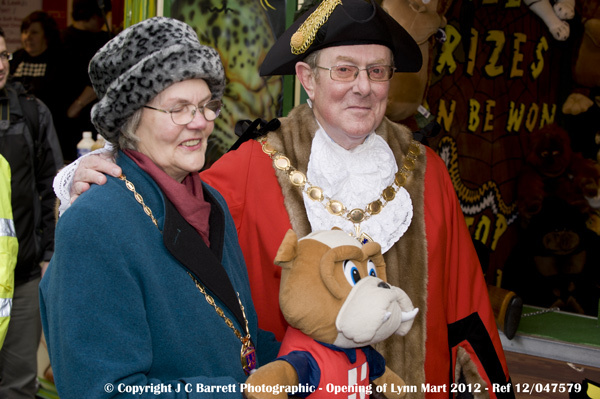 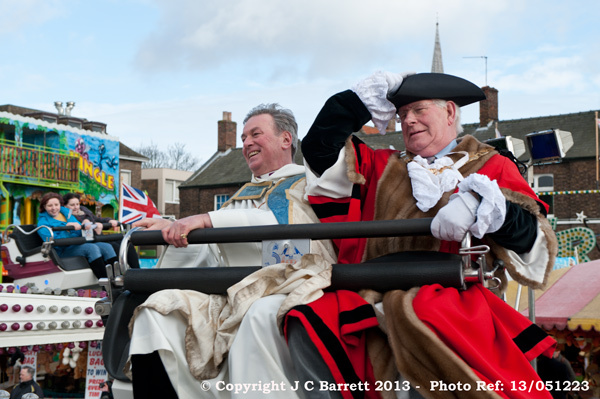 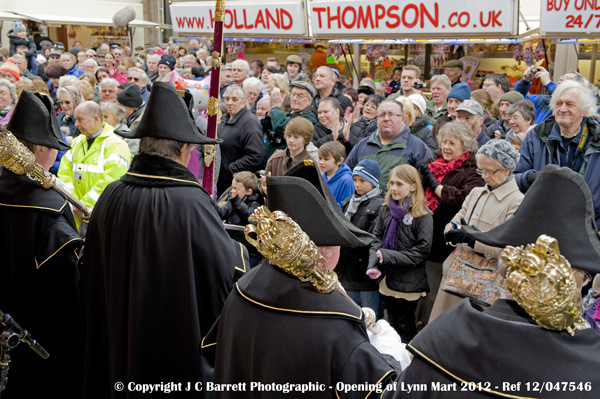 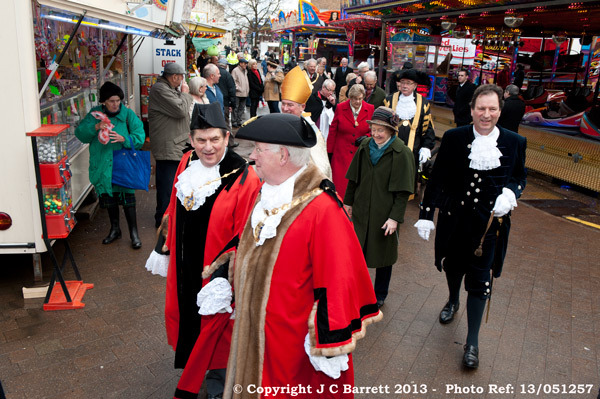 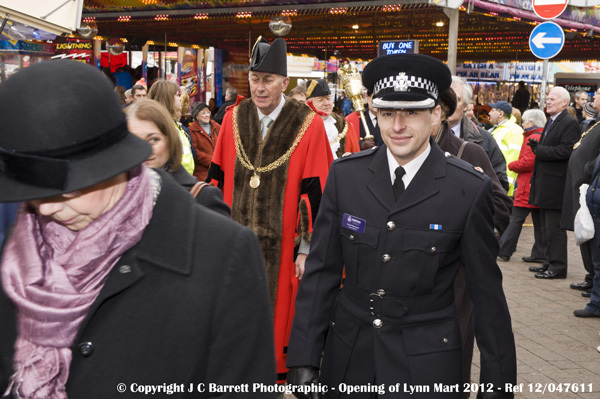 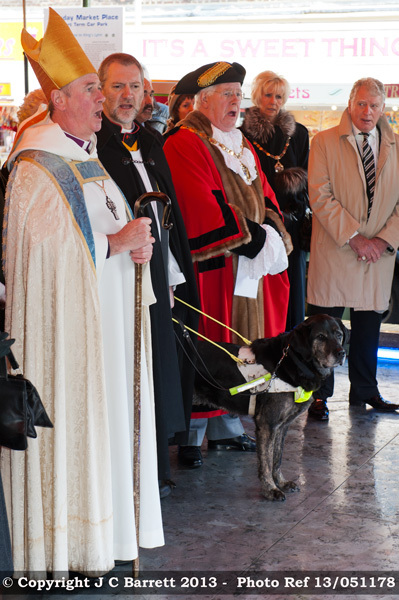 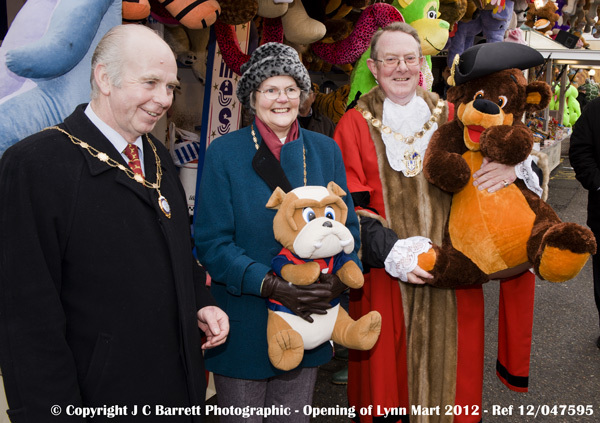 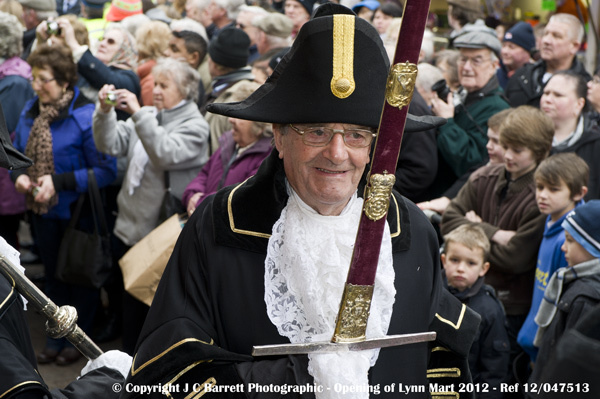 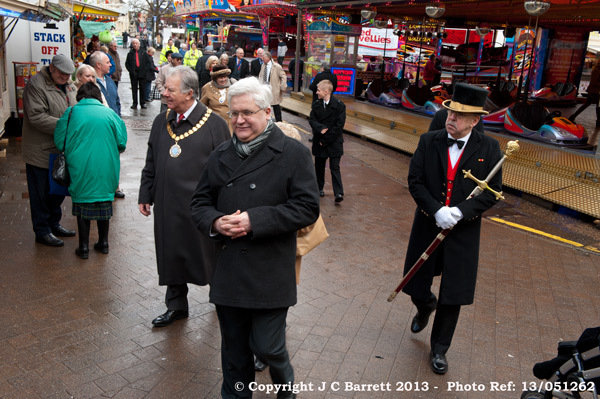 On Thursday 14th February 2013 (St Valentine's Day) at noon Borough Mayor Geoffrey Wareham opened the King's Lynn Mart. 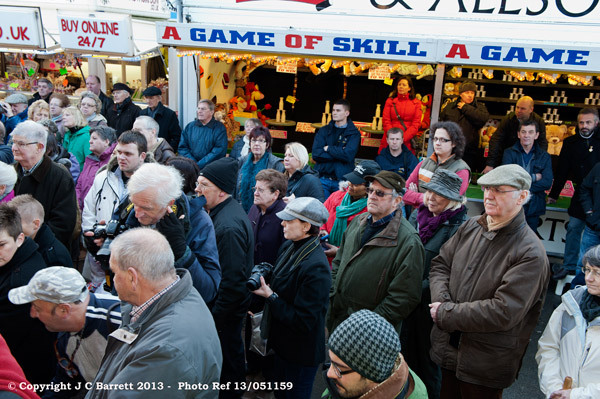 This year the Mart will be open from Thursday 14th February to Saturday 23rd February 2013, opening on weekdays from 6pm and on Saturdays from 12 noon. 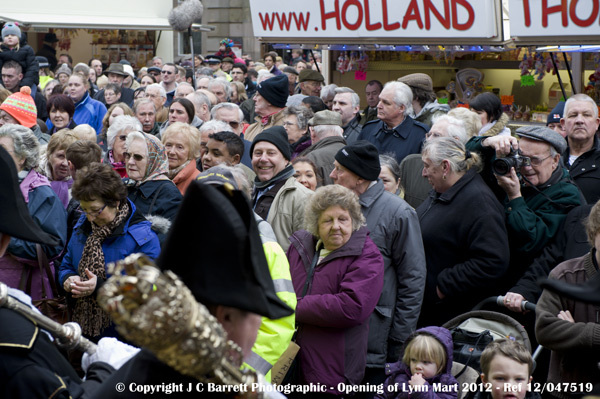 The Mart will be closed on Sunday. 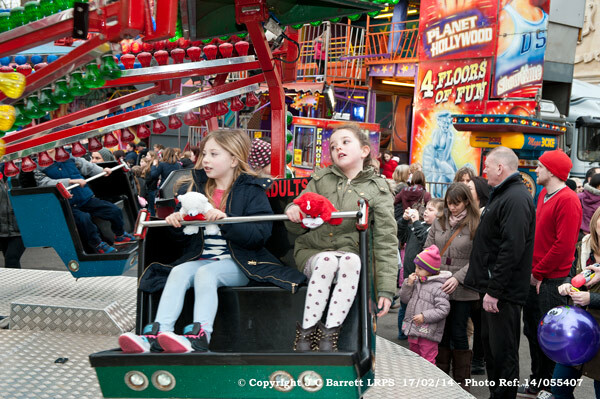 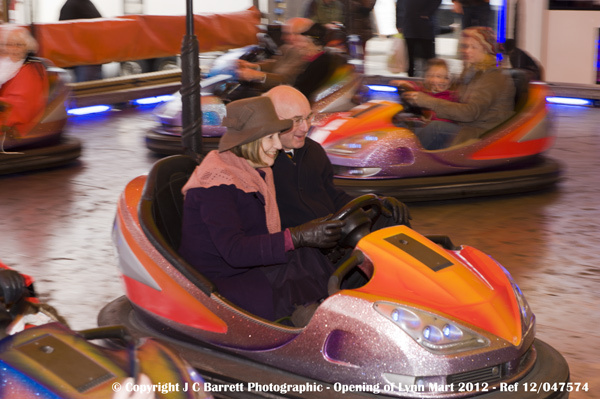 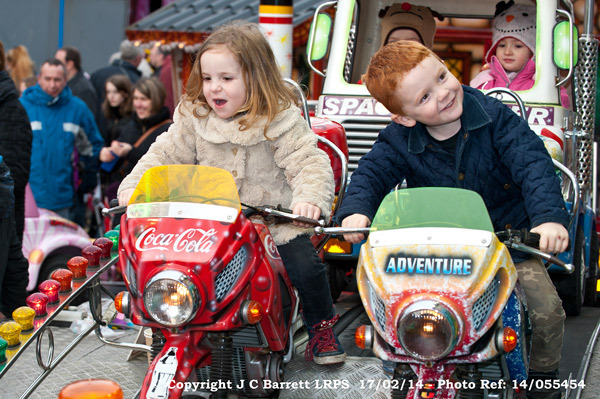 Traditionally the Mart is the first in the Showmen's calendar where new rides are tried out and old favourites brought out from winter storage. 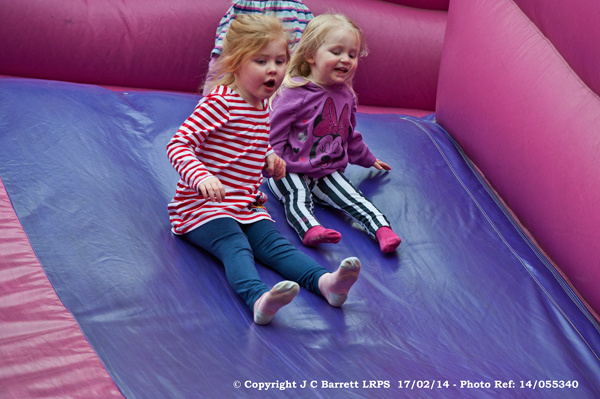 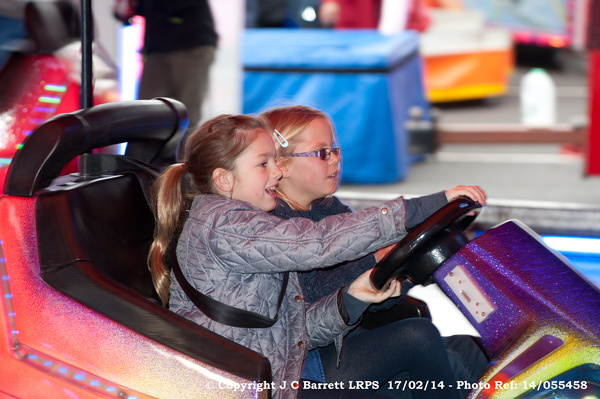 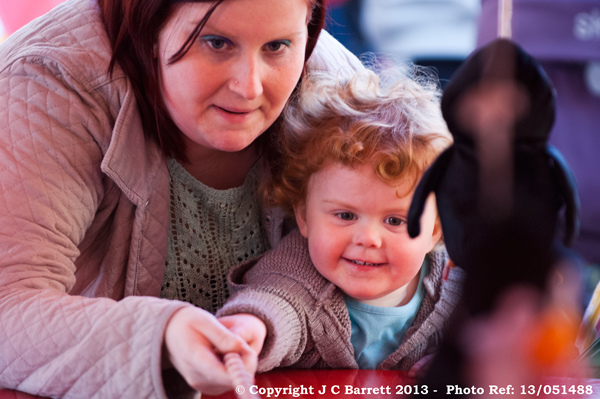 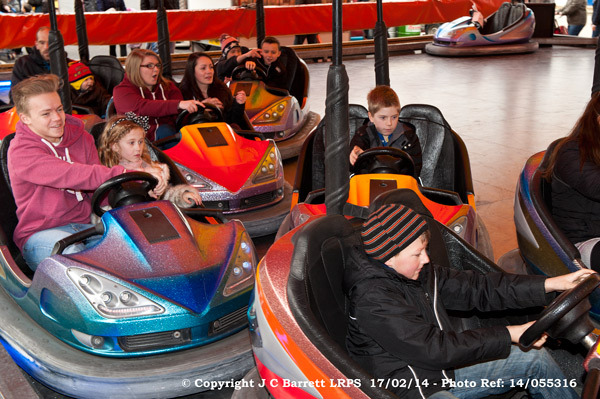 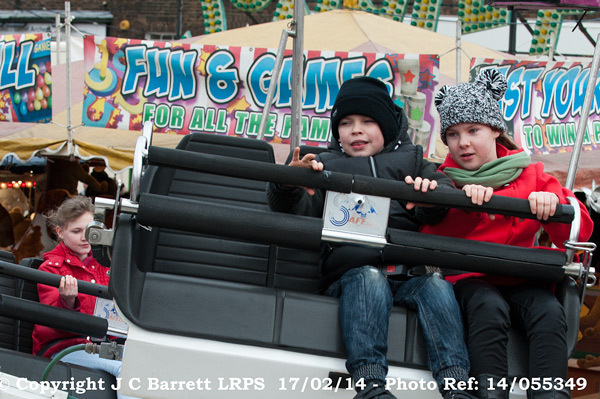 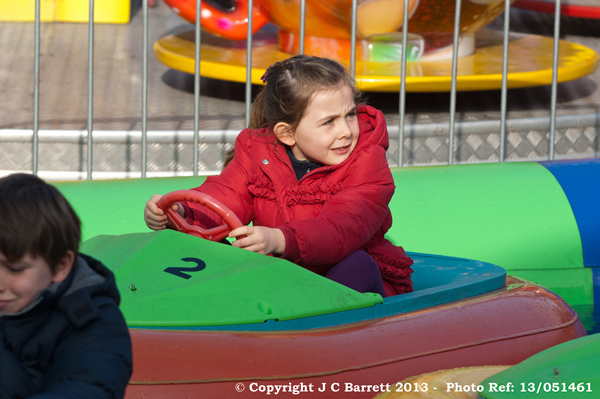 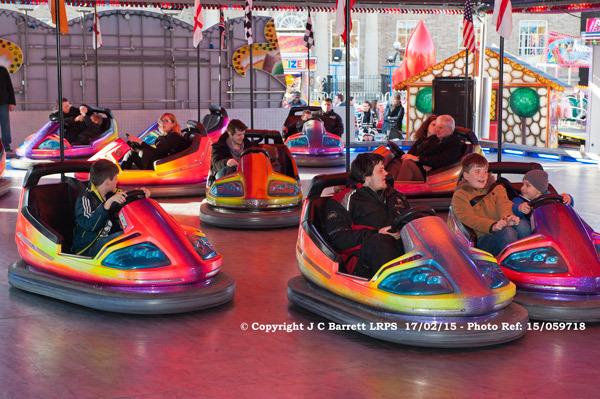 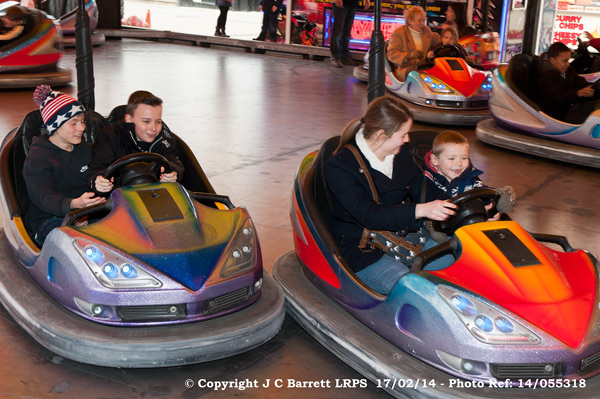 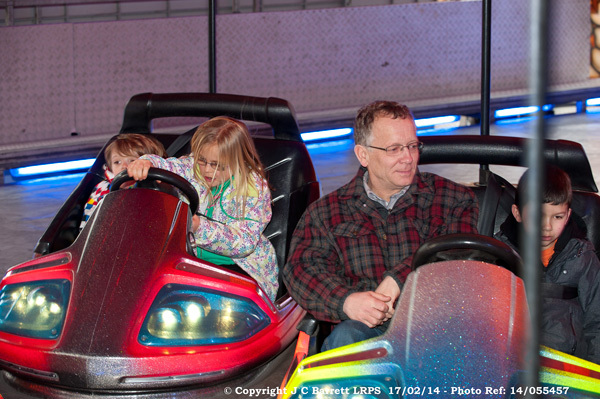 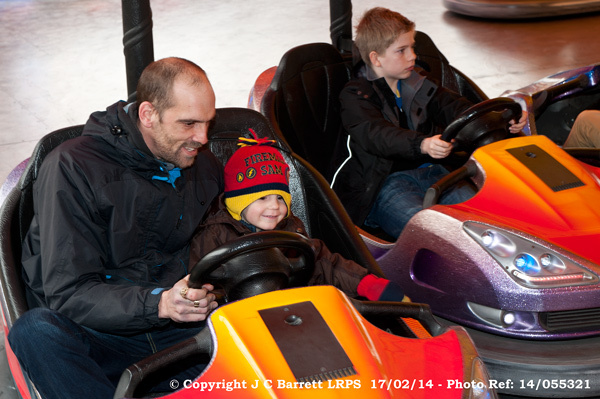 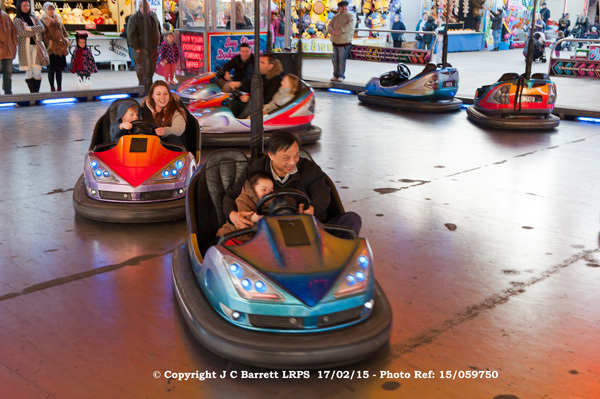 The family day was held on Monday 18th February, - See photo grpup 6 above) All Rides £1.00 with the exception of the Dodgems at £2.00 per car. 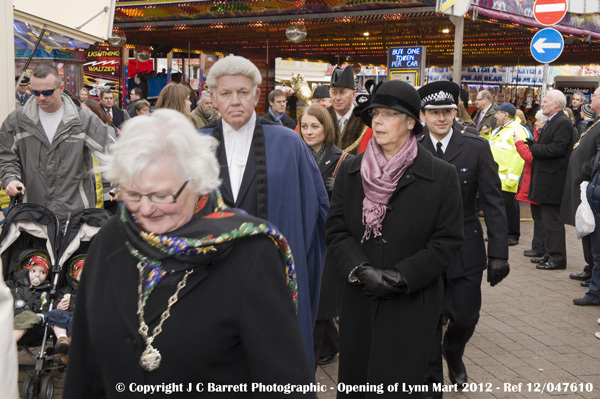 King's Lynn Mart February 14th 2012. 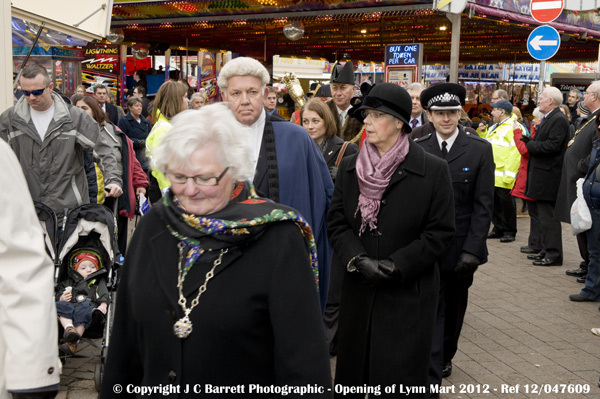 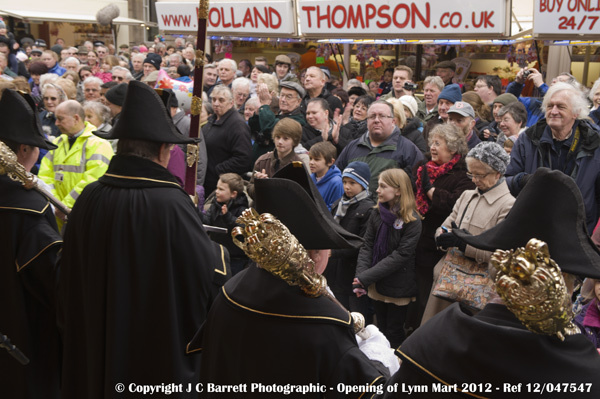 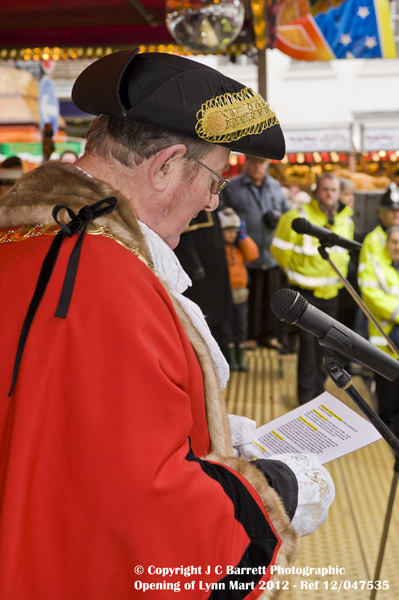 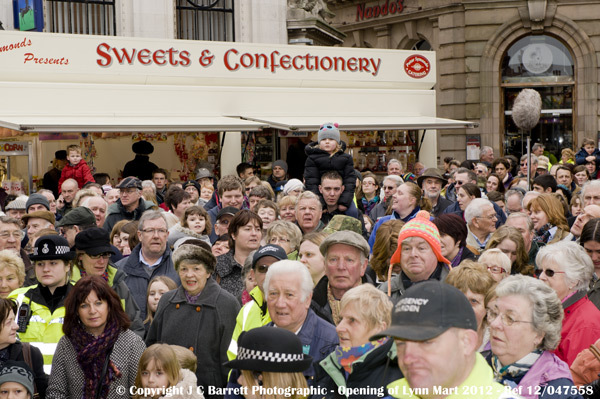 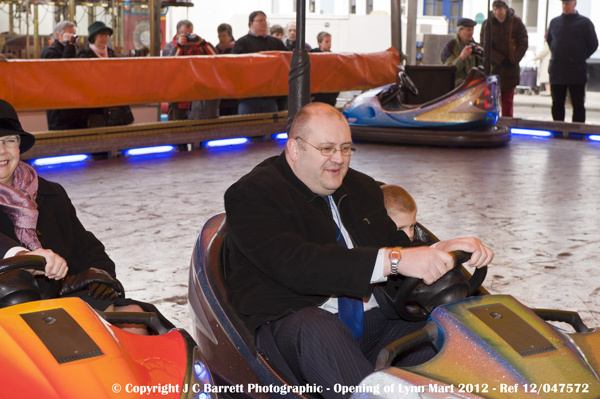 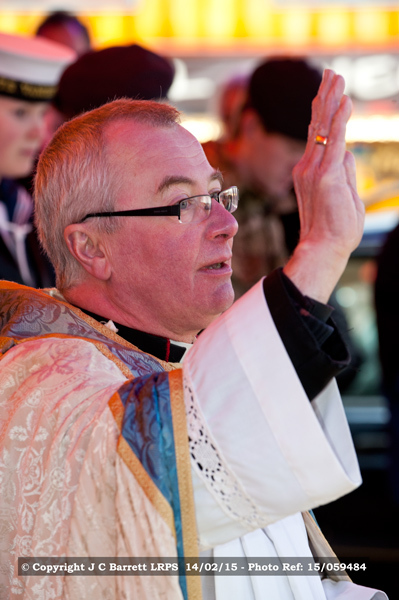 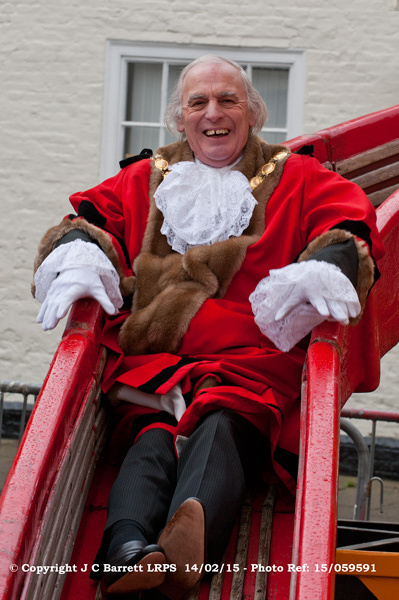 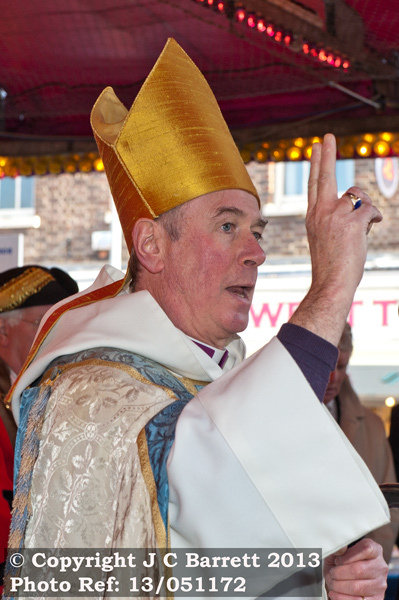 Today 14th February 2012 (St Valentine's Day) at noon borough Mayor Colin Sampson opened the King's Lynn Mart. 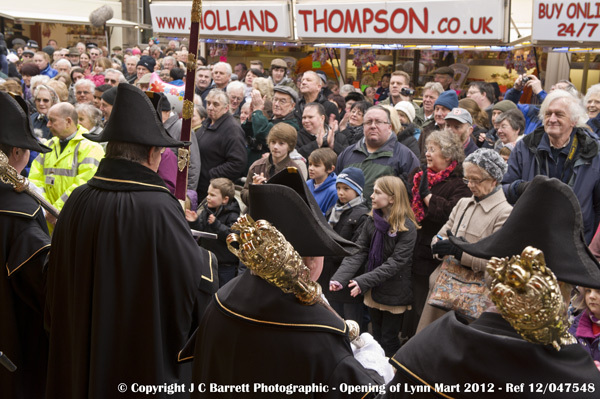 Donald Gray (Showman's Guild) said: King's Lynn Mart has one of the finest openings in the country. 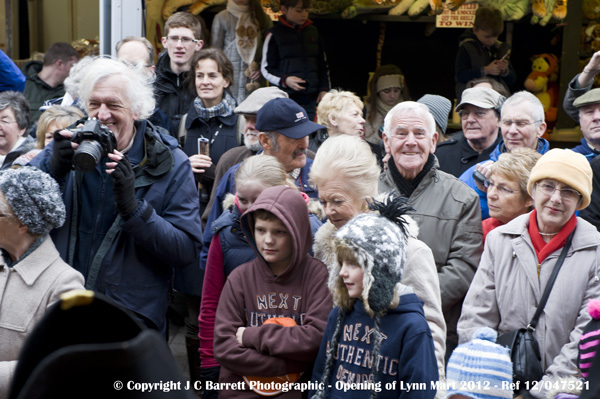 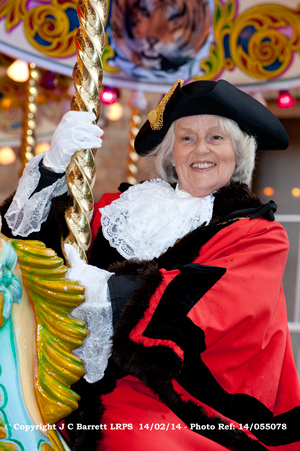 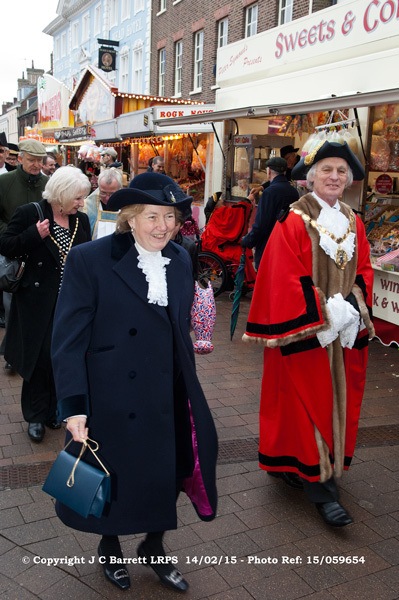 It is the first event of the year in the diary for the showmen, and guests from around the county arrived at Lynn's Tuesday Market Place to see the ceremony. 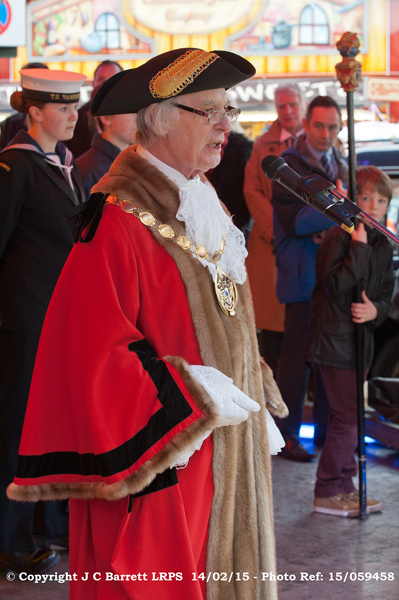 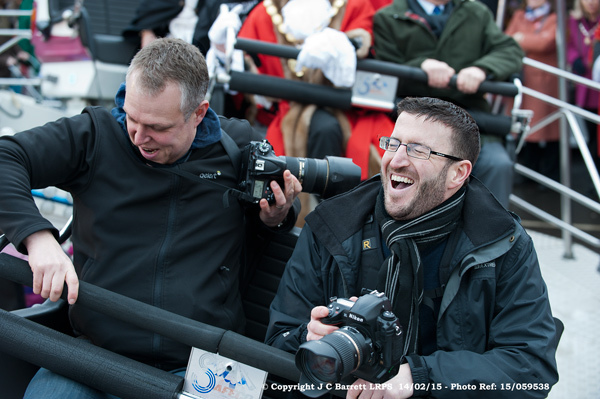 A full civic event took place with mayors, council leaders, MPs and other dignitaries attending. 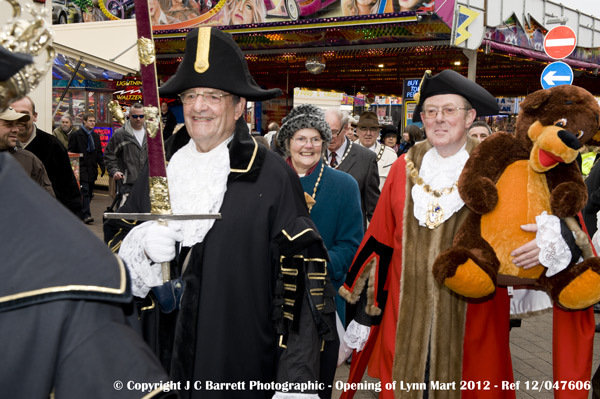 The King's Lynn Mart is part of King's Lynn's history, a long and distinguished history in the town and dates back more than 800 years, having been granted a charter from King John. 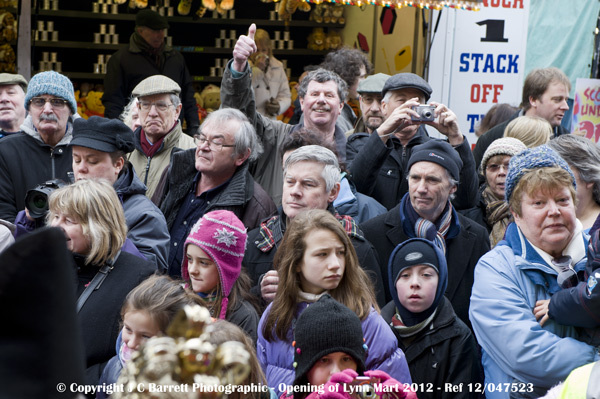 This year's Mart, runs until February 28 2012. 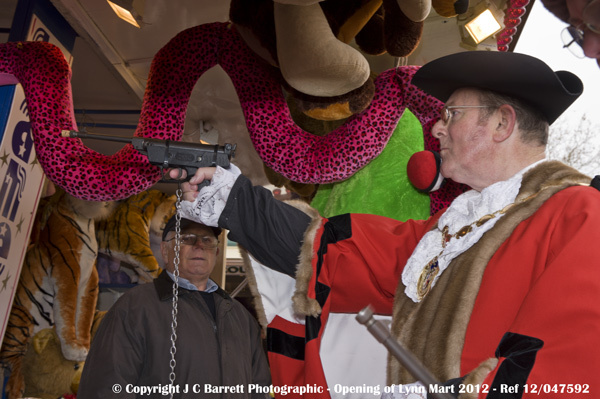 The Mart will not be opening on Sundays. 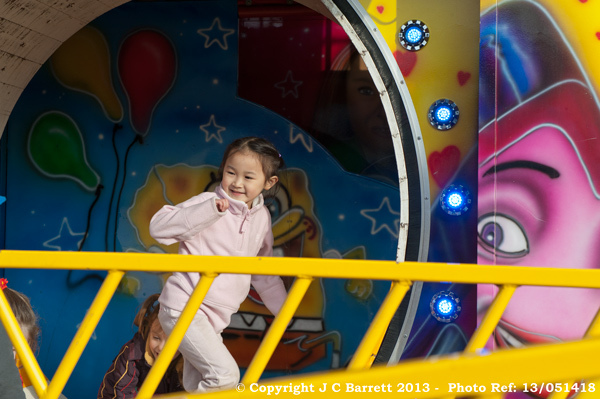 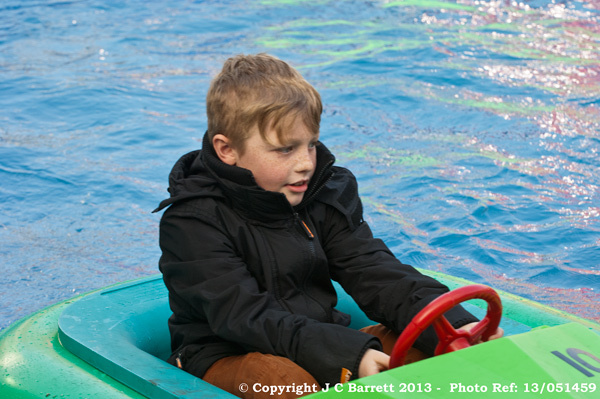 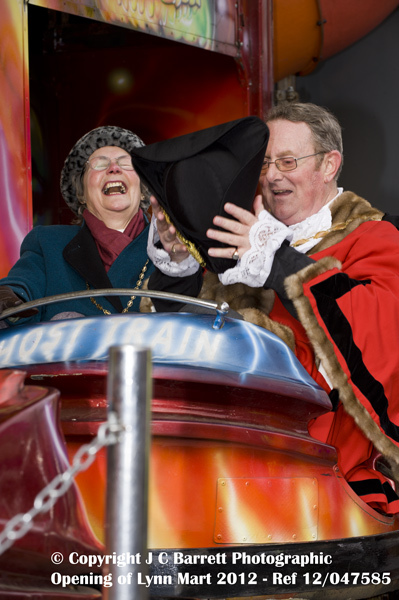 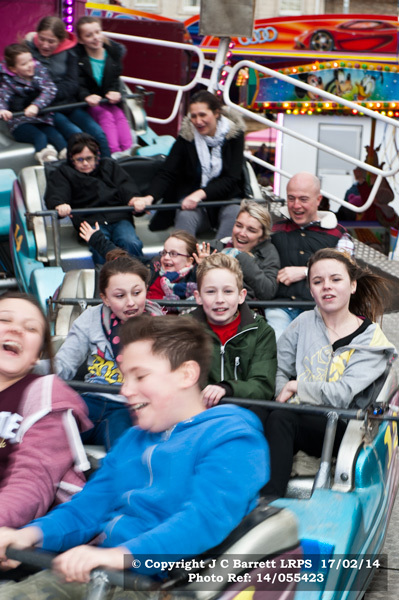 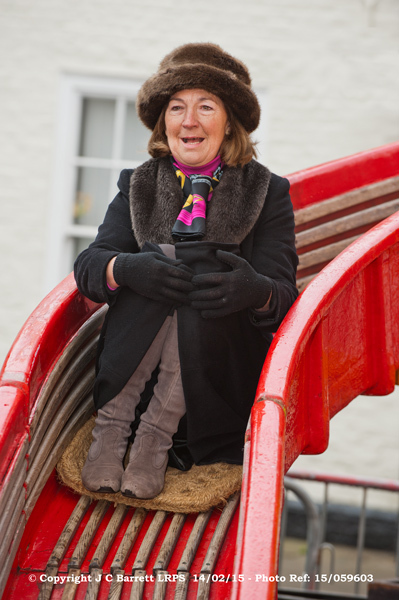 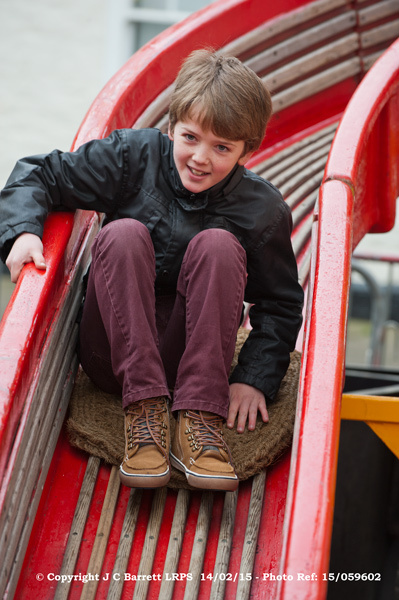 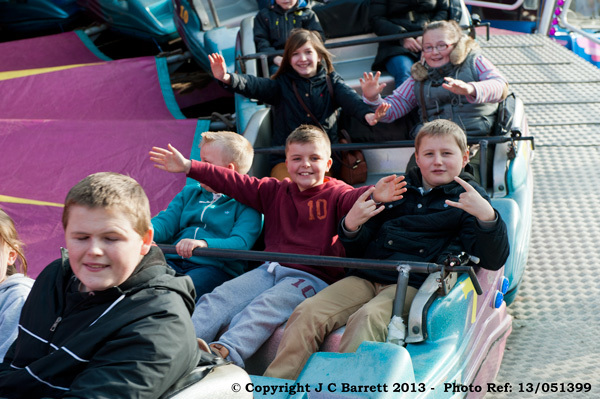 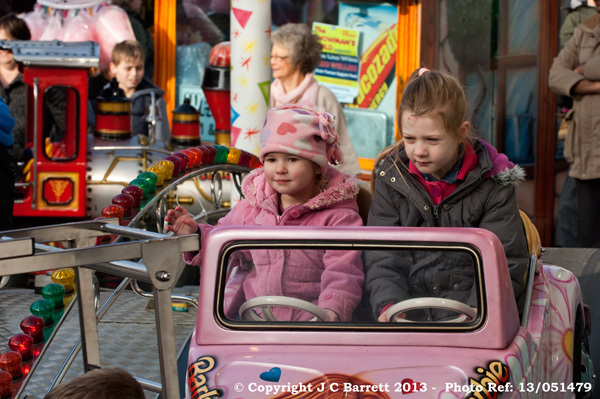 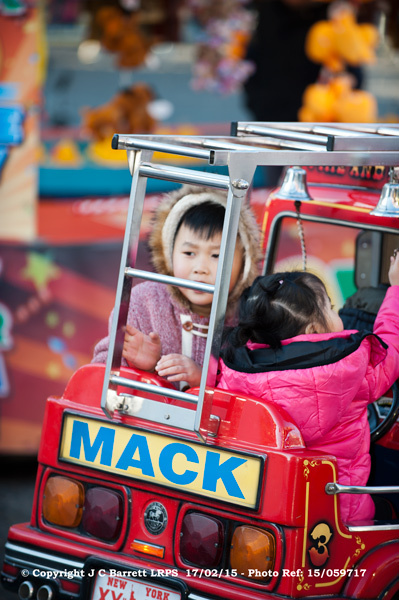 Children's Day is on Wed 15th February, when all rides will be £1. 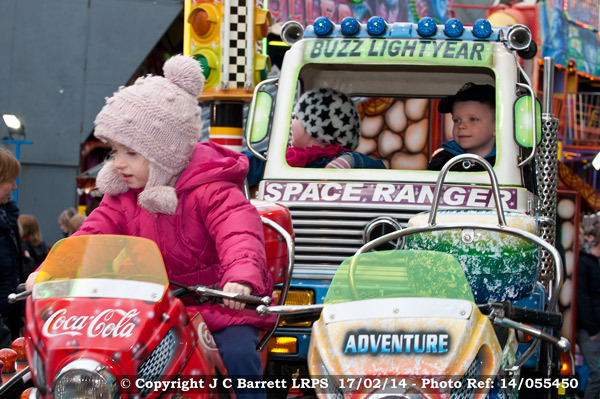 This year for the first time brings a new ride for them with the arrival of the "Little Bumper Bugs". 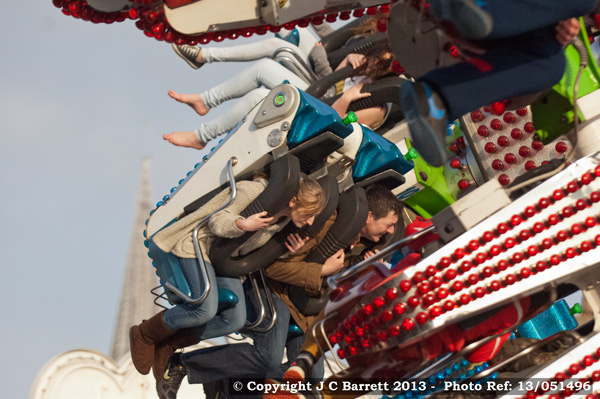 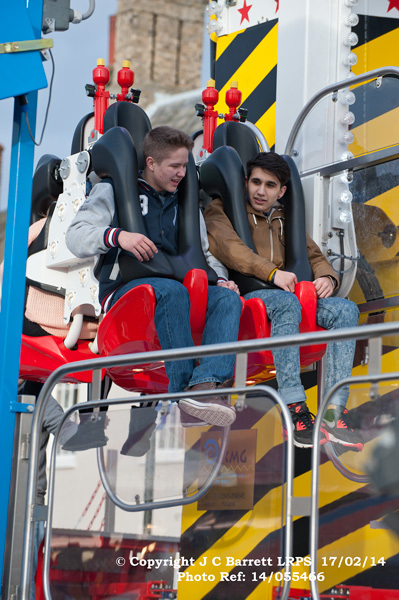 A ride called "The Move" which turns thrill-seekers upside-down is guaranteed to be one of the main attractions. 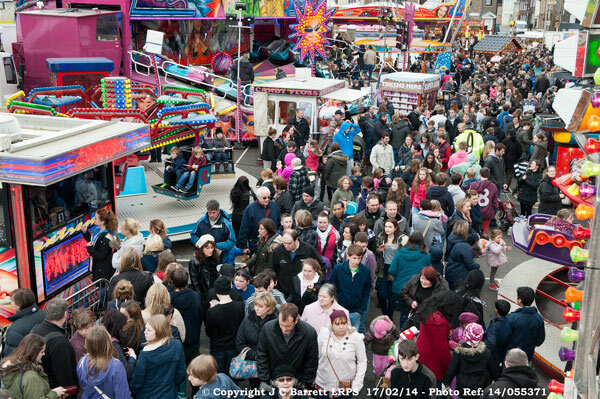 With an improved forecast the showman are hoping for a good turnout . 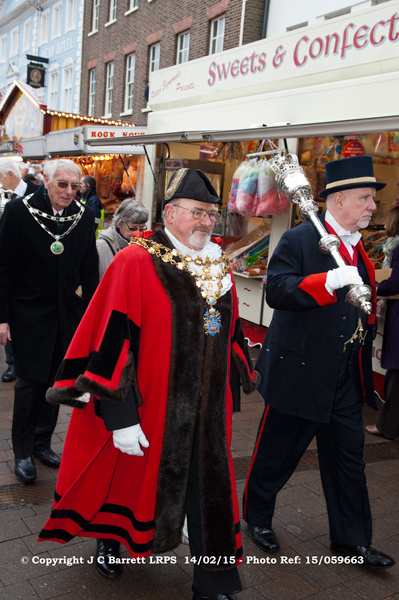 During the 15th Century the town hosted two marts which were important trading fairs and which attracted visitors from as far afield as Italy and Germany. 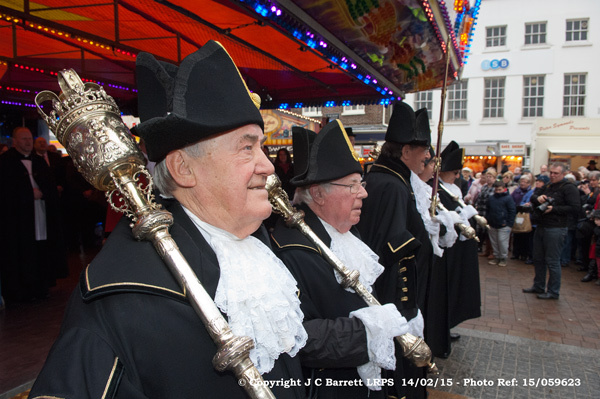 Today the town hosts just one mart on the Tuesday Market Place which starts on February 14 each year, and is believed to be one of the oldest fairs in the country. 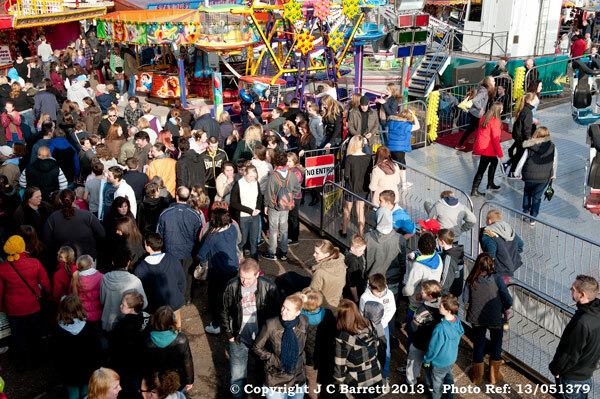 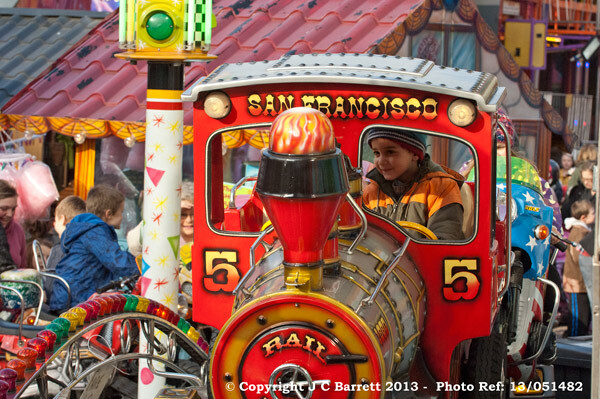 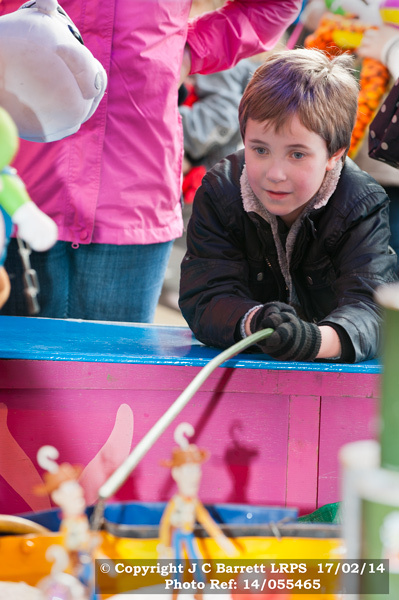 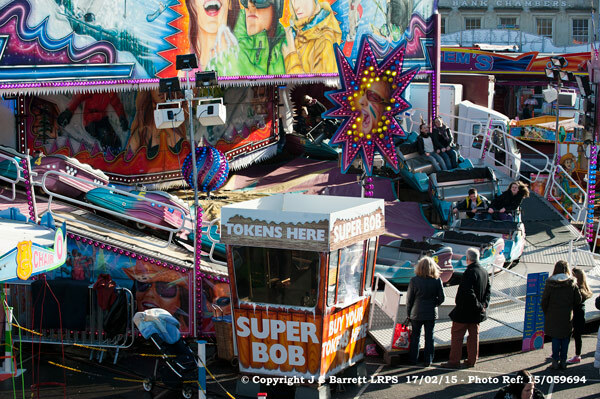 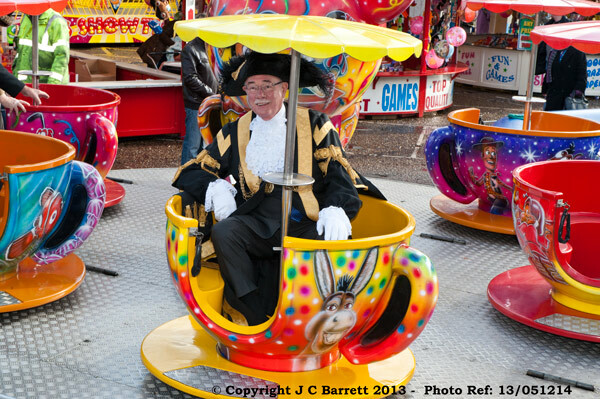 Traditionally, it is the first funfair in the showmen's calendar.